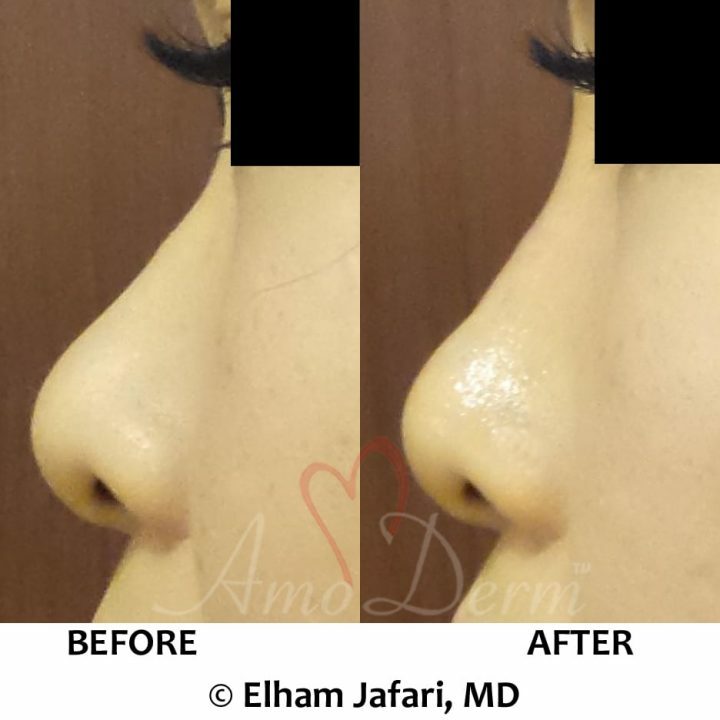 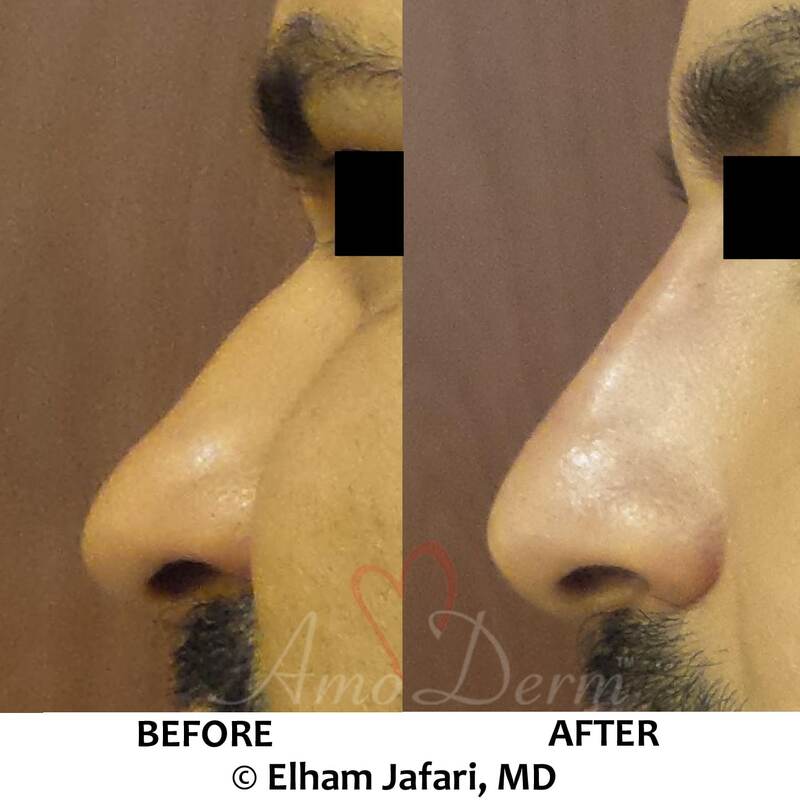 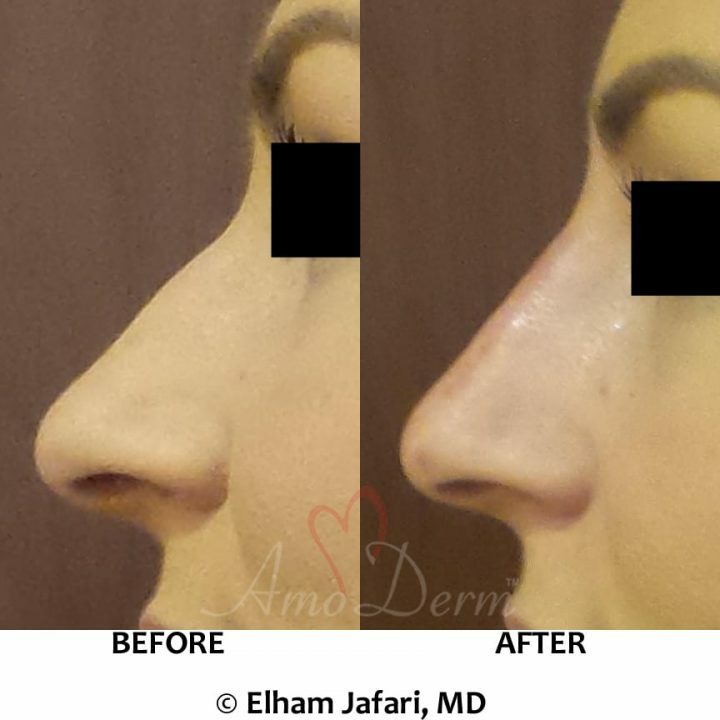 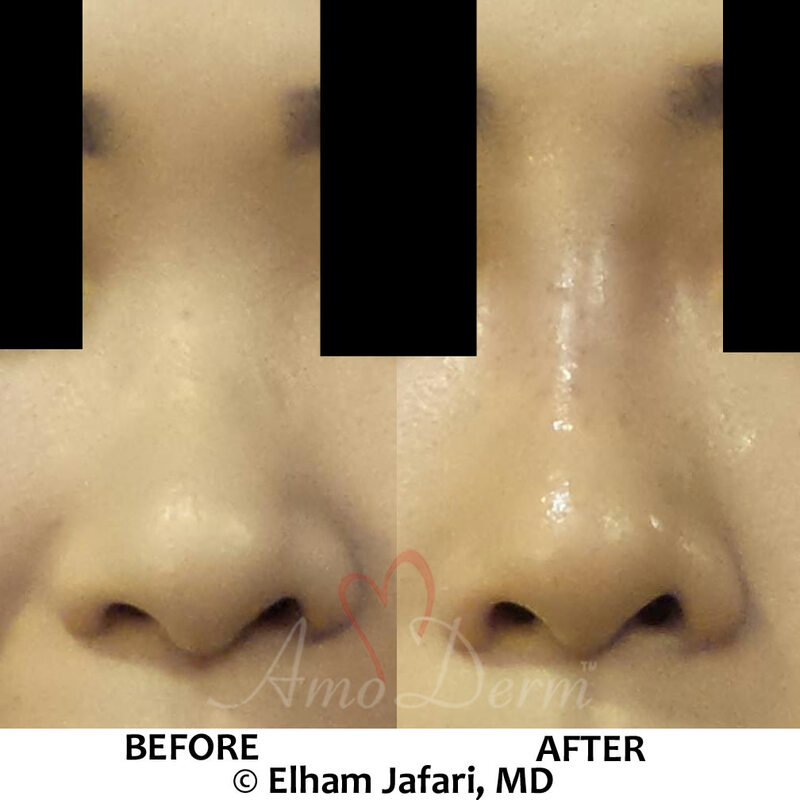 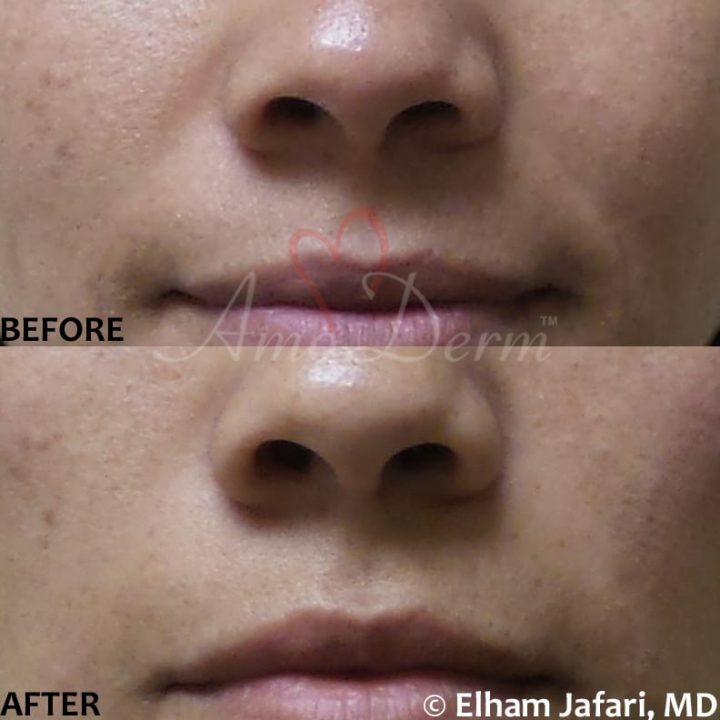 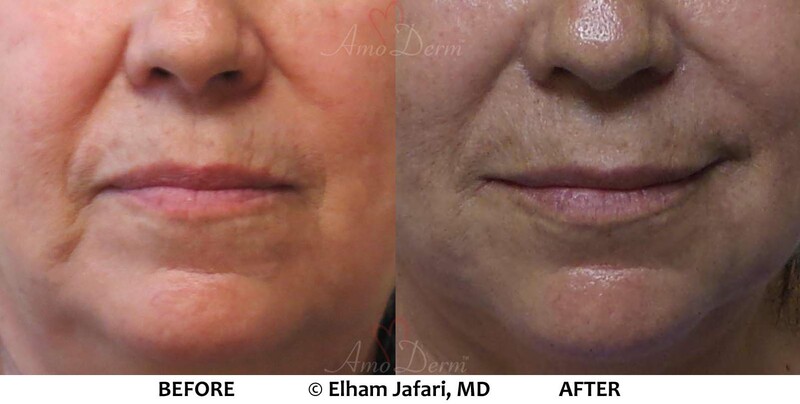 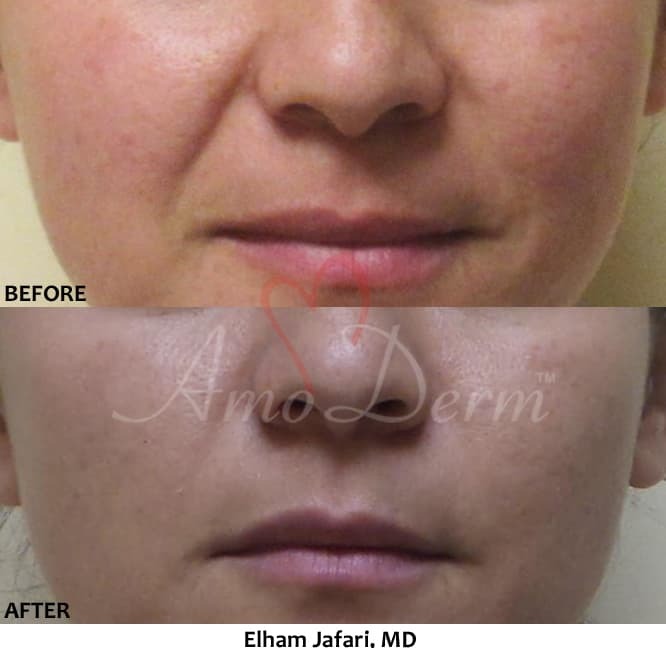 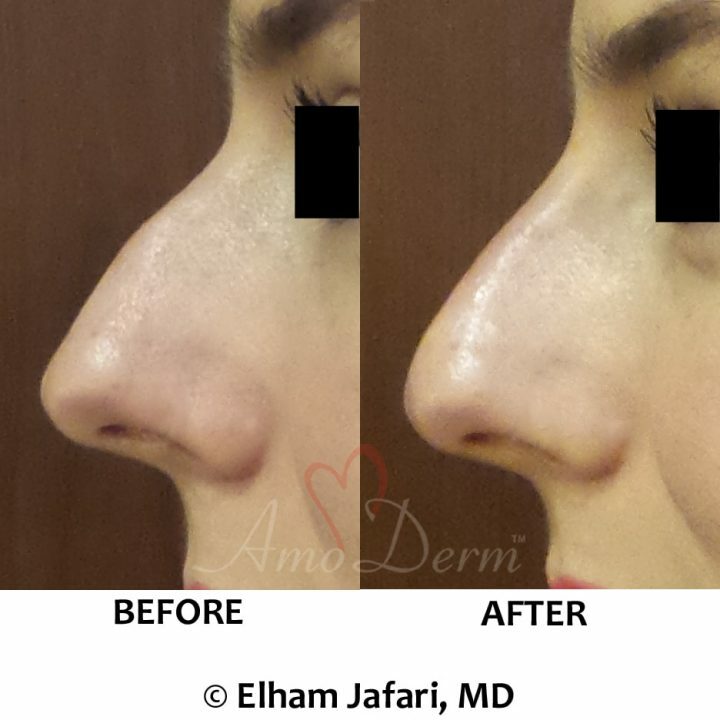 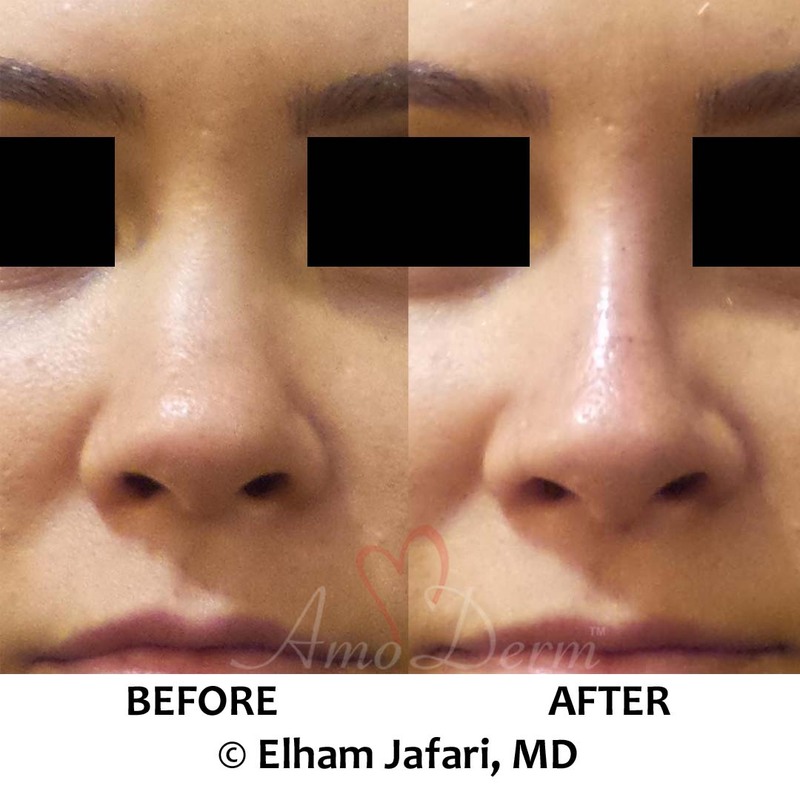 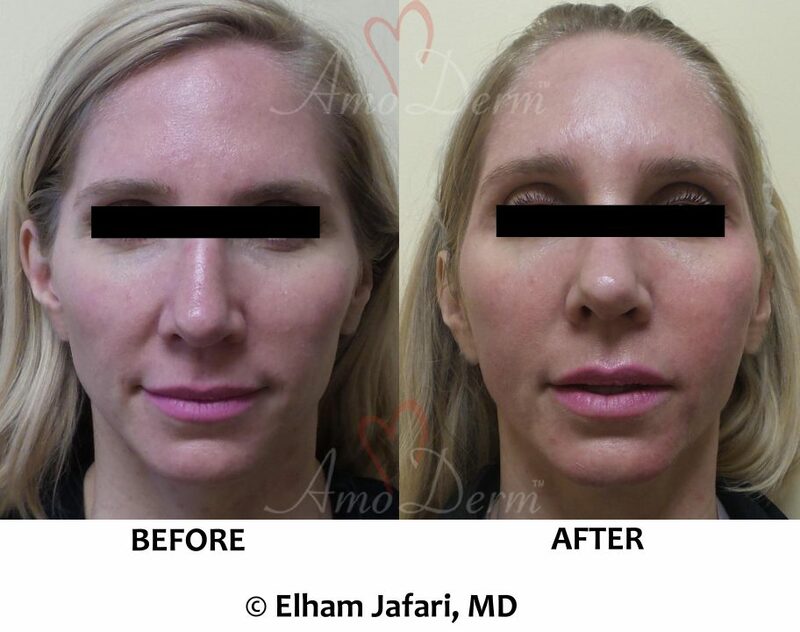 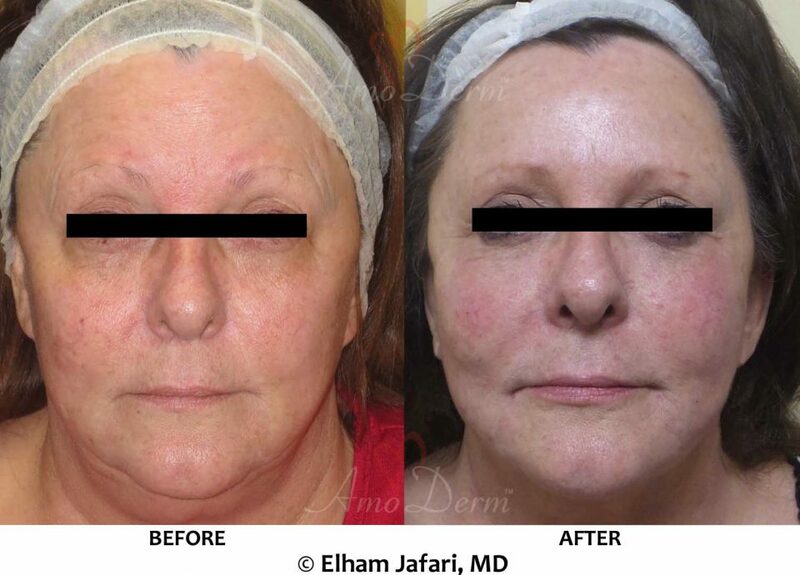 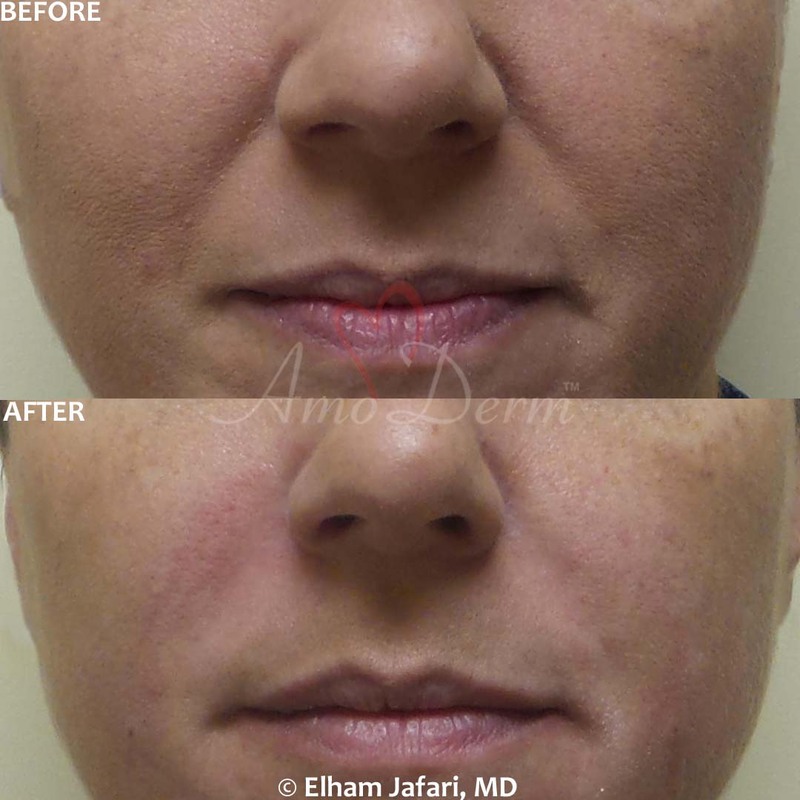 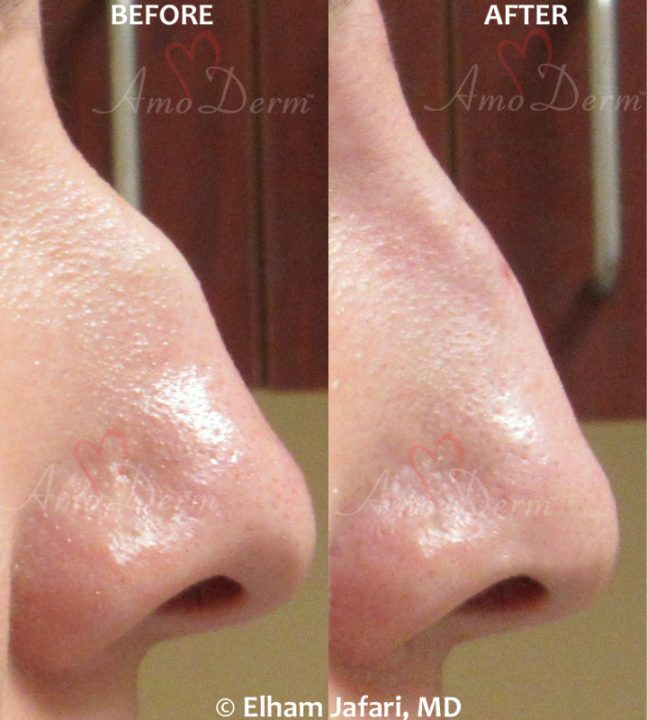 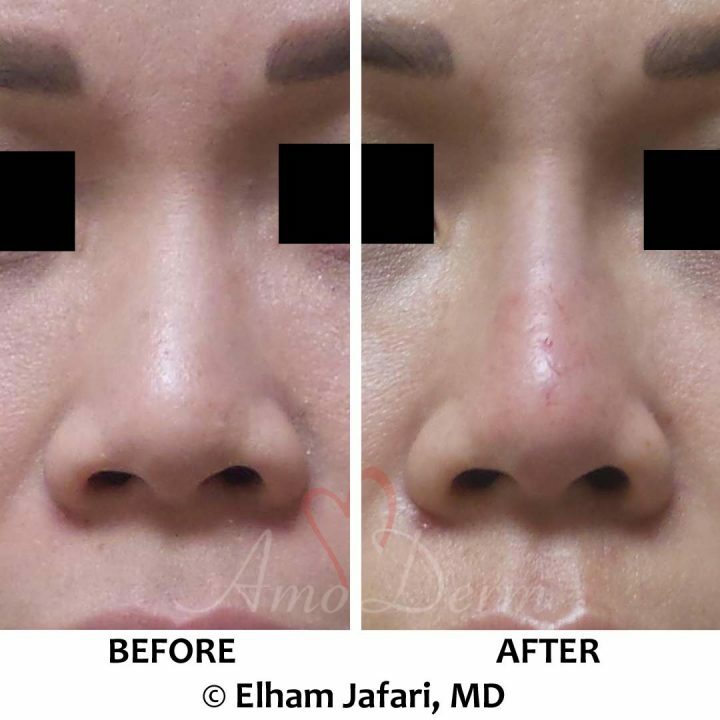 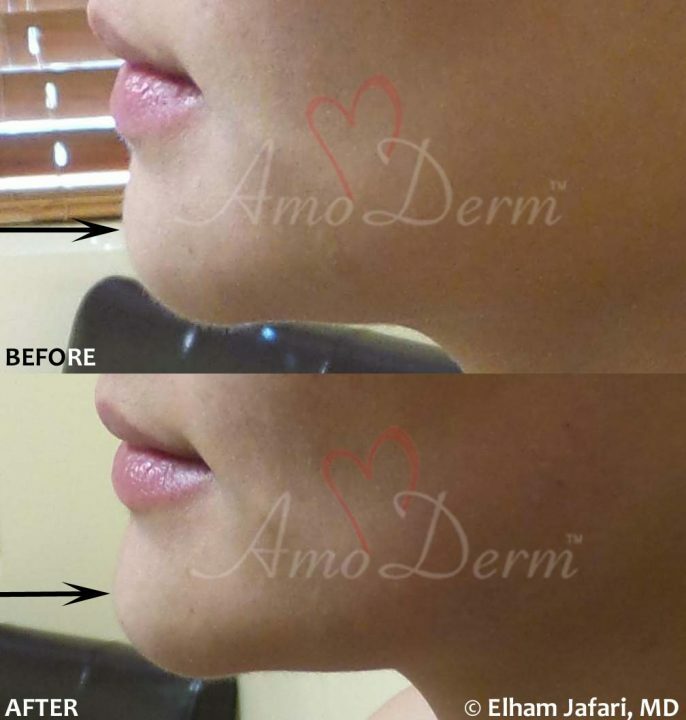 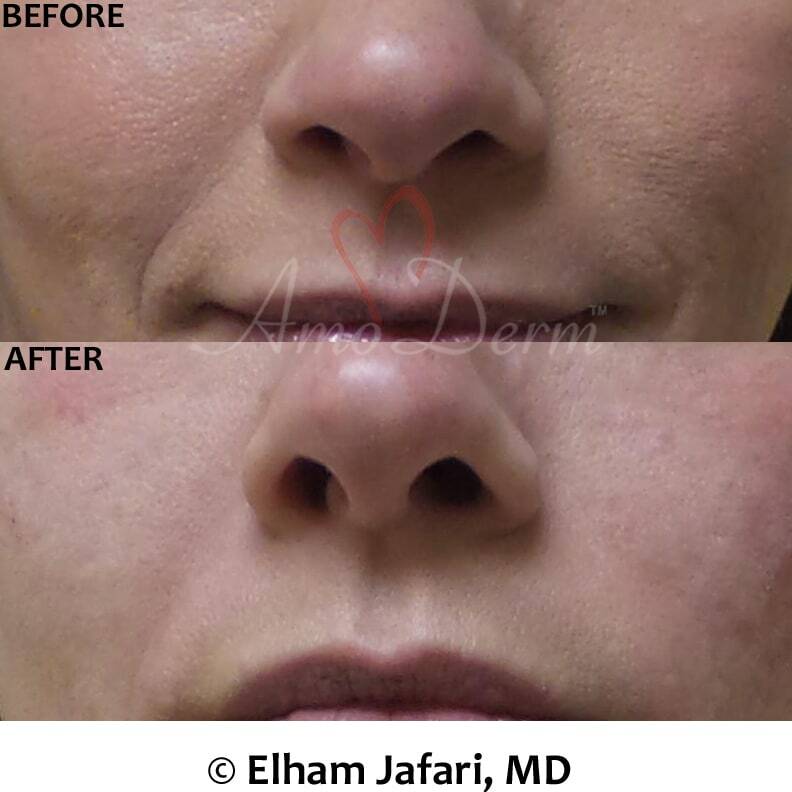 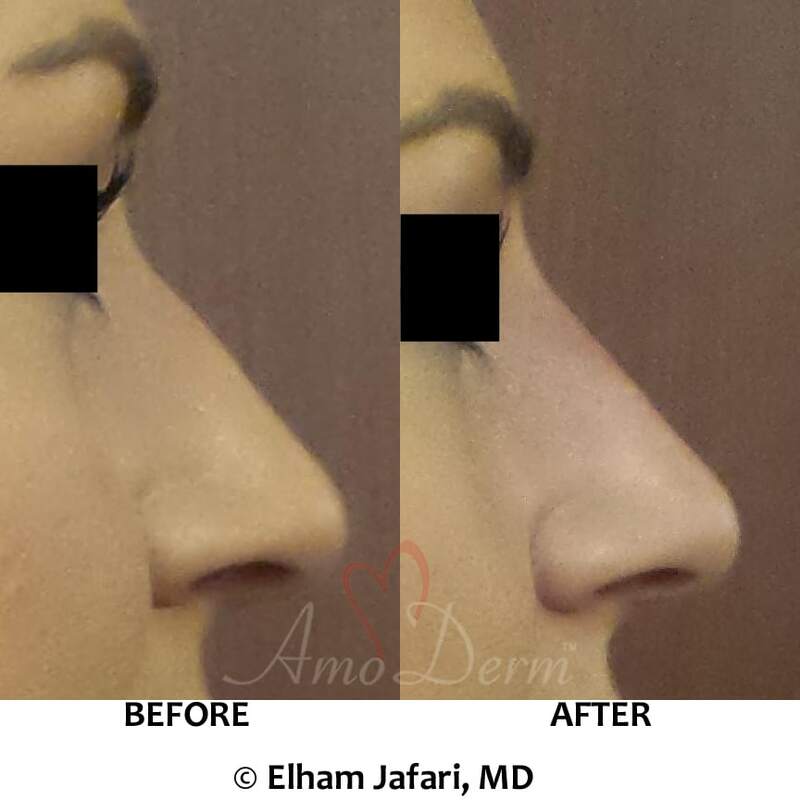 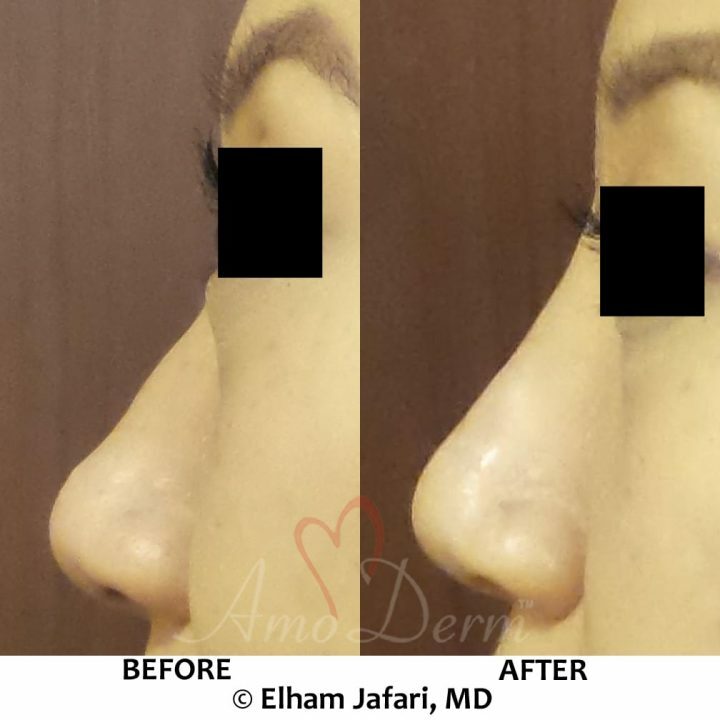 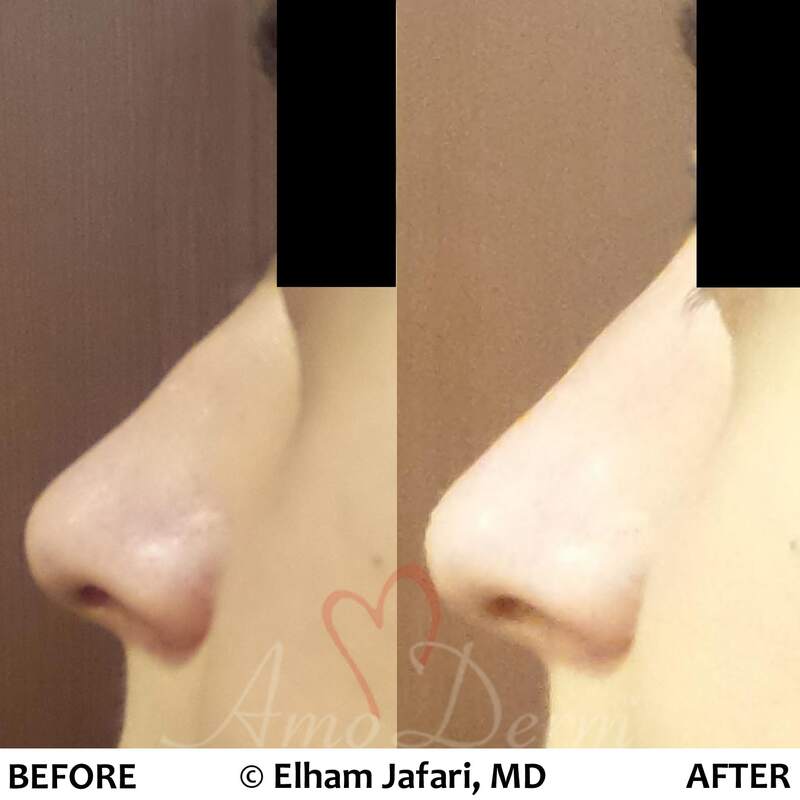 Bellafill (also known as Artefill) is a unique kind of dermal filler with long-lasting and potentially even permanent results. 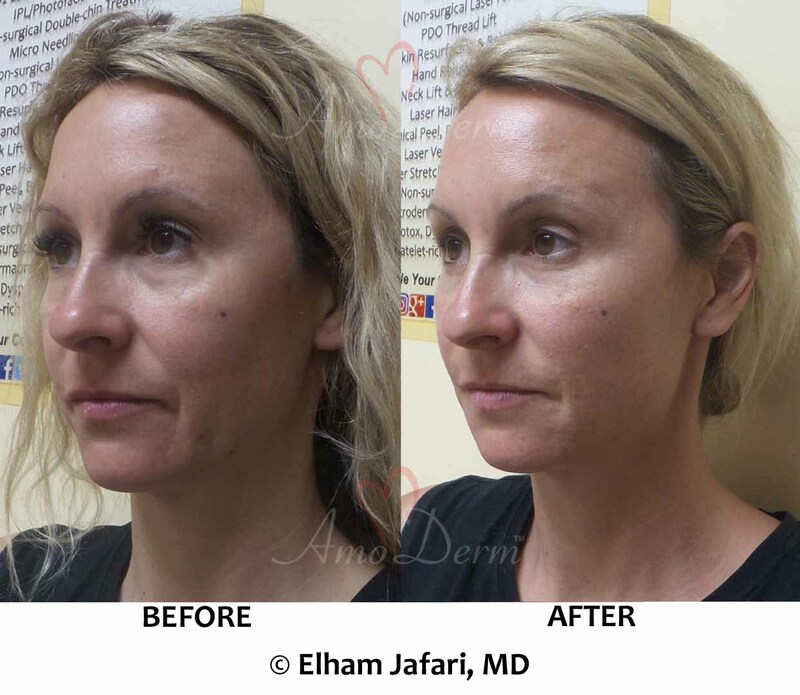 Your doctor can use Bellafill to skillfully restore lost volume in your skin and help restore a natural-looking, refreshed and rejuvenated appearance. Thanks to its long-lasting effect, Bellafill is especially useful for those seeking long-term solutions. 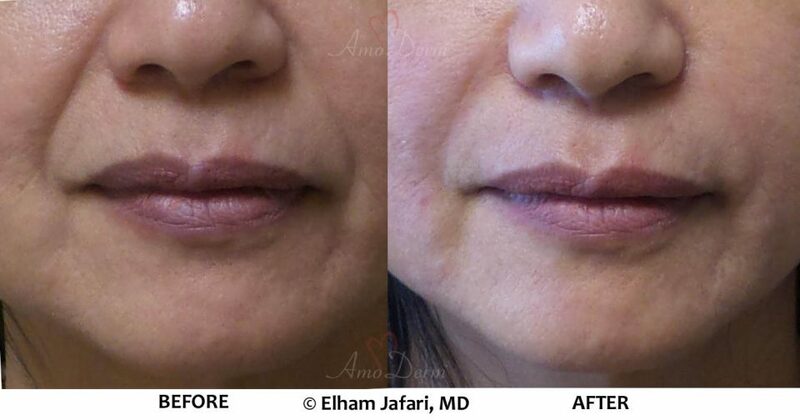 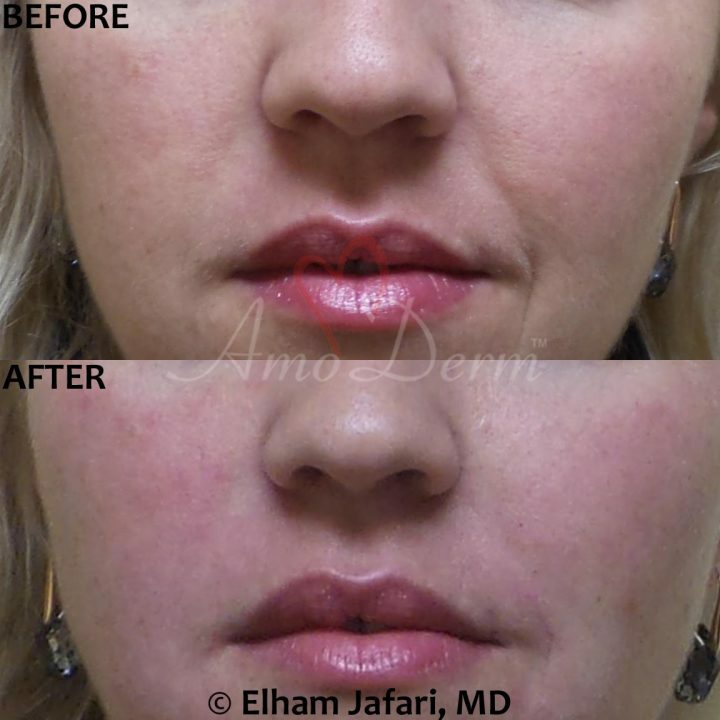 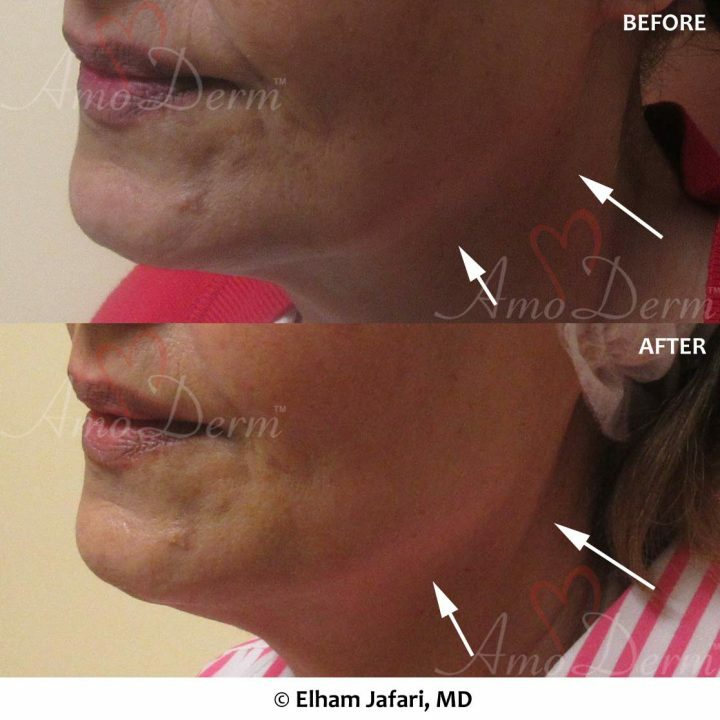 Bellafill injection can also be used to treat and smooth out pitted scars in the skin. 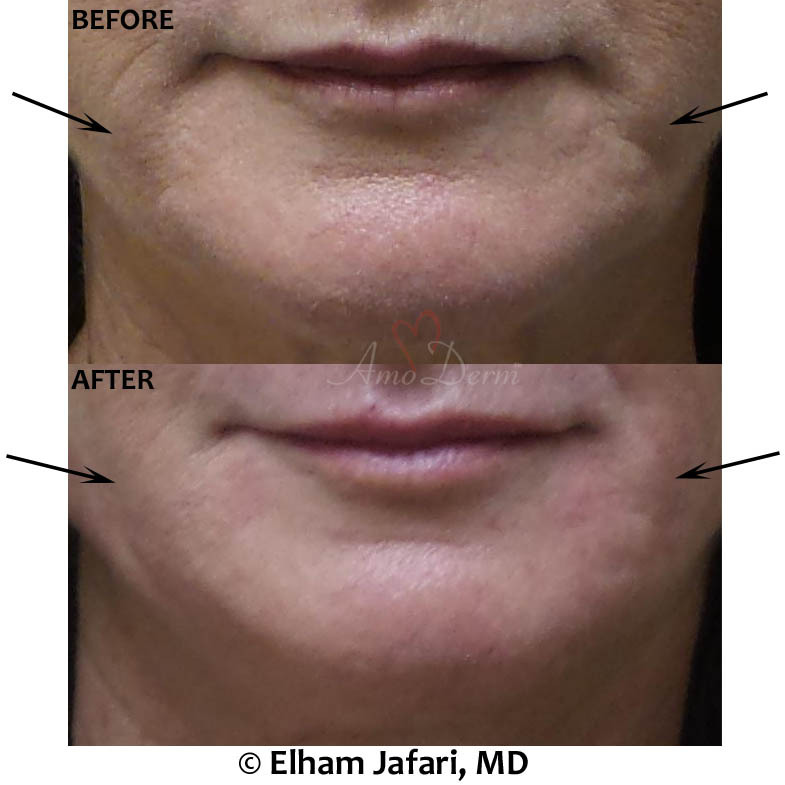 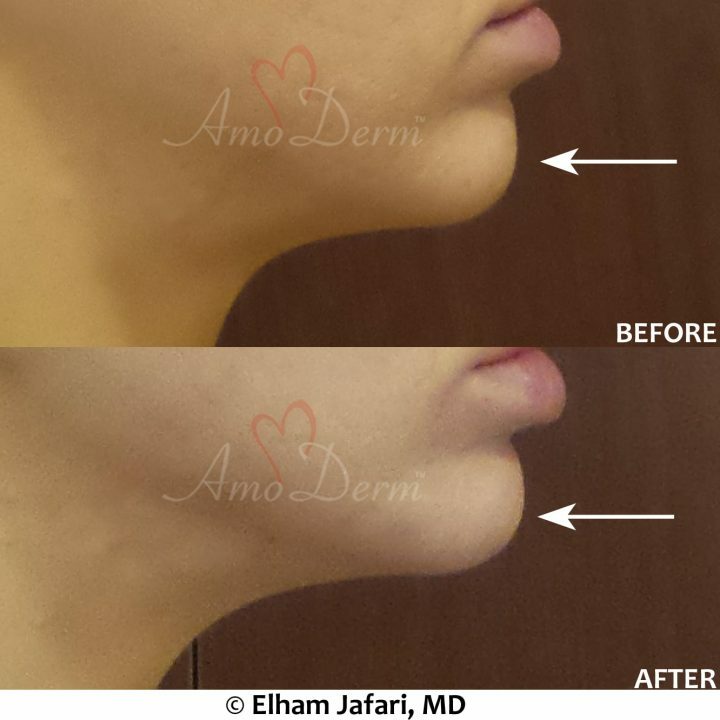 Bellafill (formerly known as Artefill) is an FDA-approved injectable dermal filler that can be used to restore and replenish lost volume in the skin, treating many common conditions such as wrinkles, lines and folds (namely, smile lines and nasolabial folds), saggy and loose skin, lost volume and pitted/depressed scars in skin. 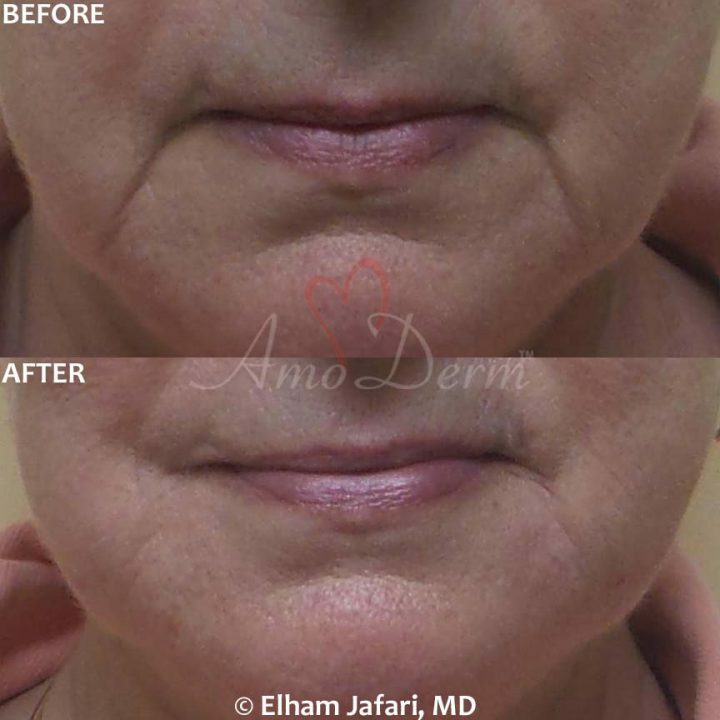 Bellafill is one of many fillers that can be used by your doctor to lost volume as part of anti-aging and rejuvenating treatments. 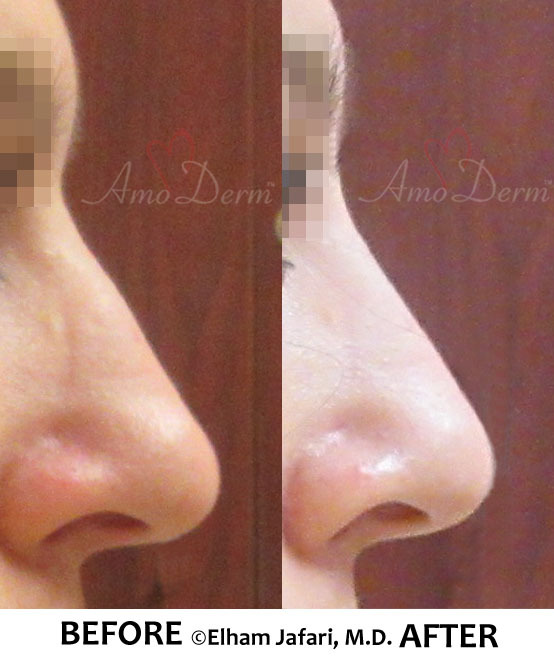 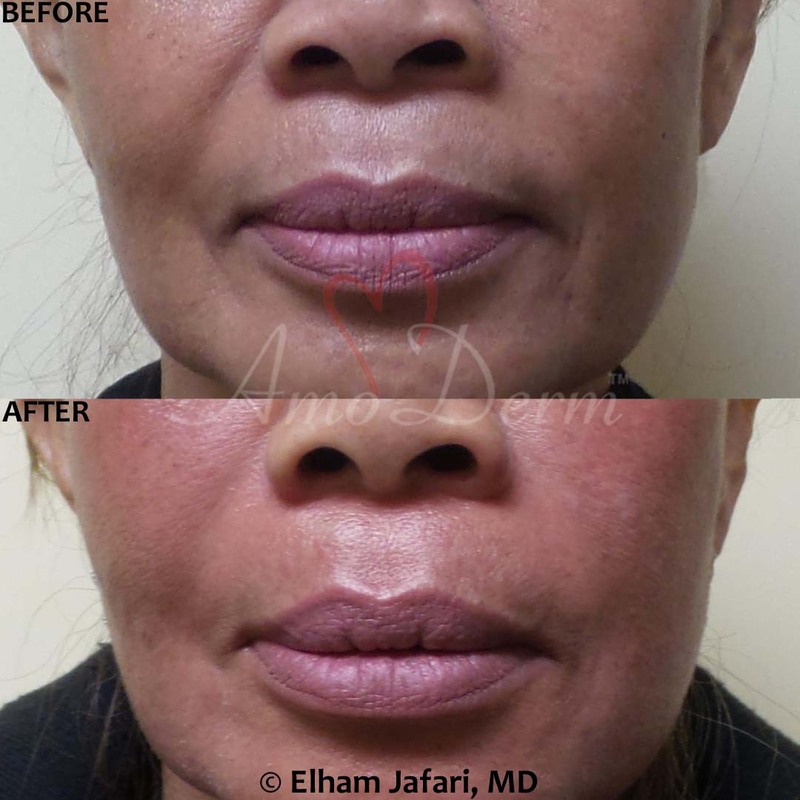 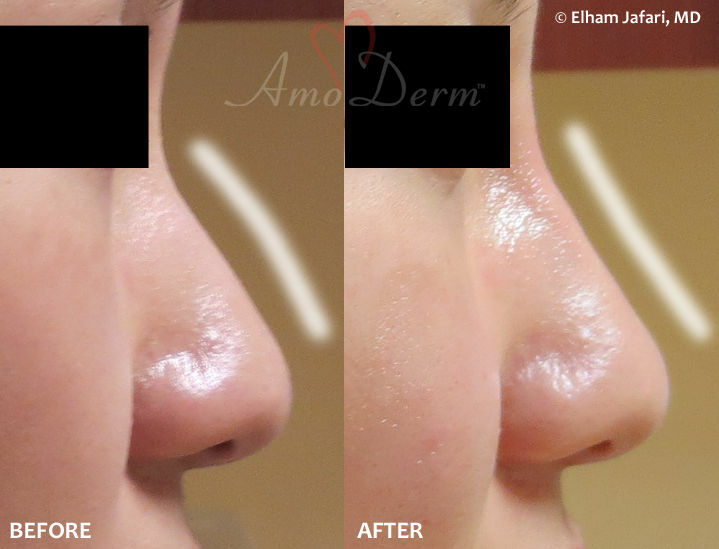 Bellafill is a unique type of filler that is made of purified collagen (about 80%) and polymethylmethacrylate (PMMA) microspheres (about 20%). 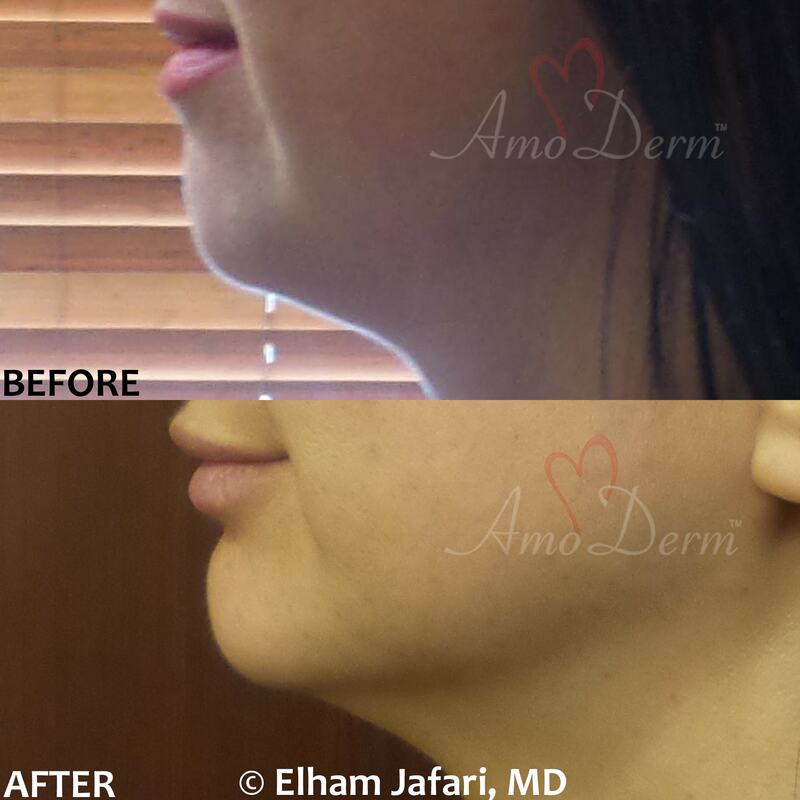 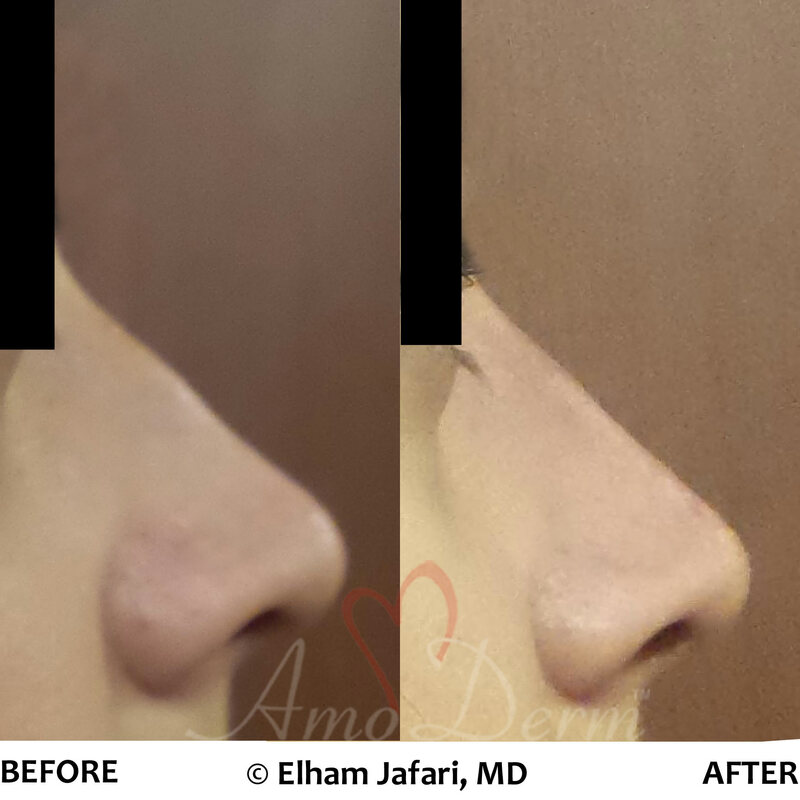 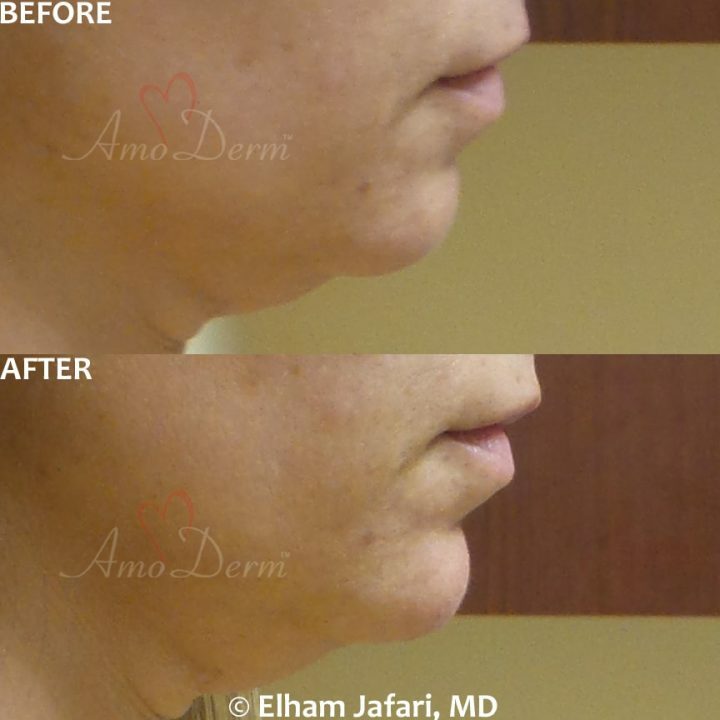 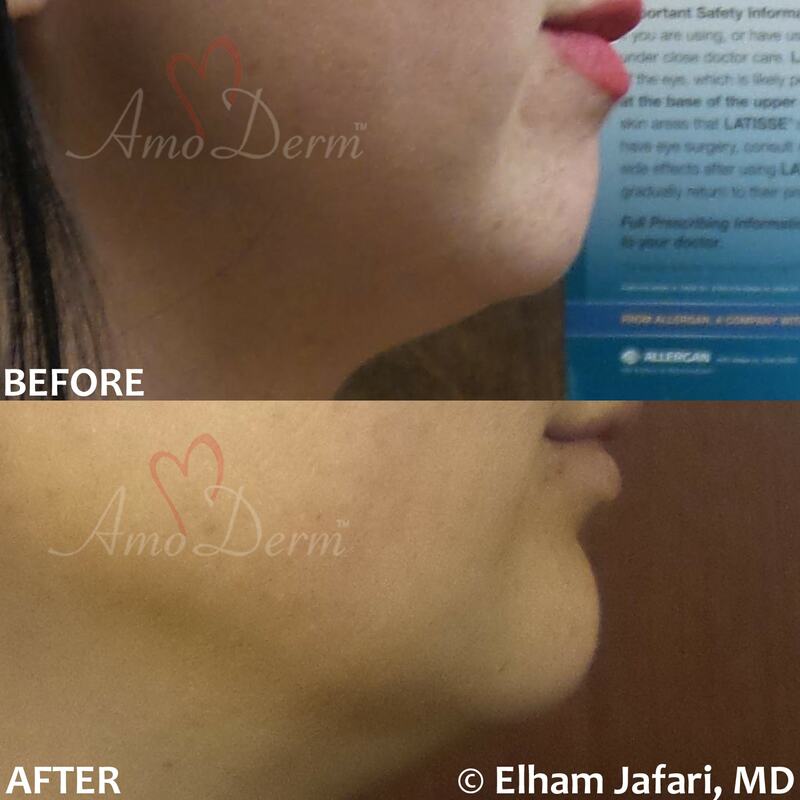 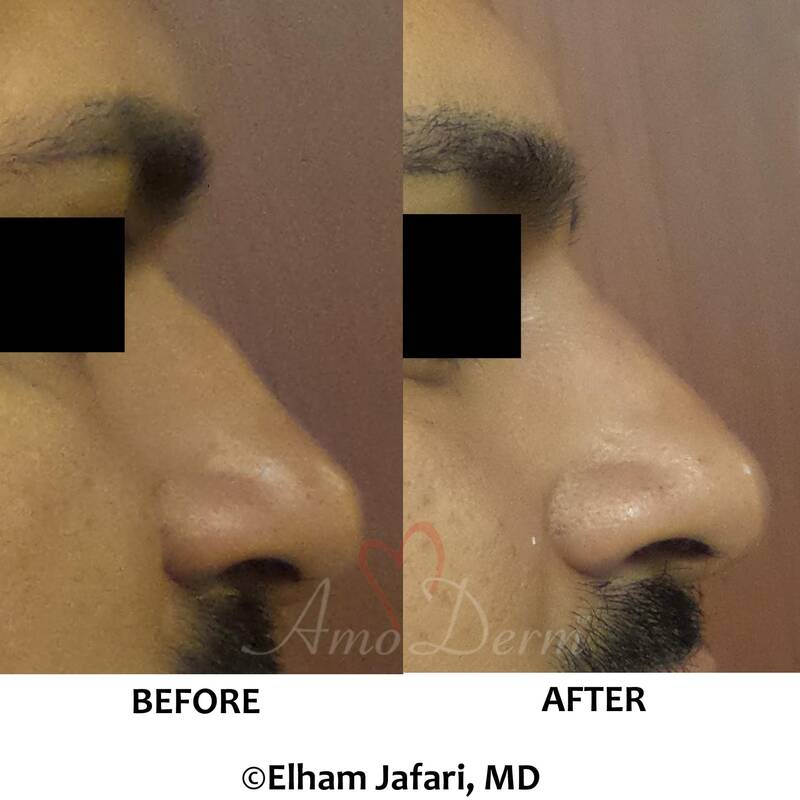 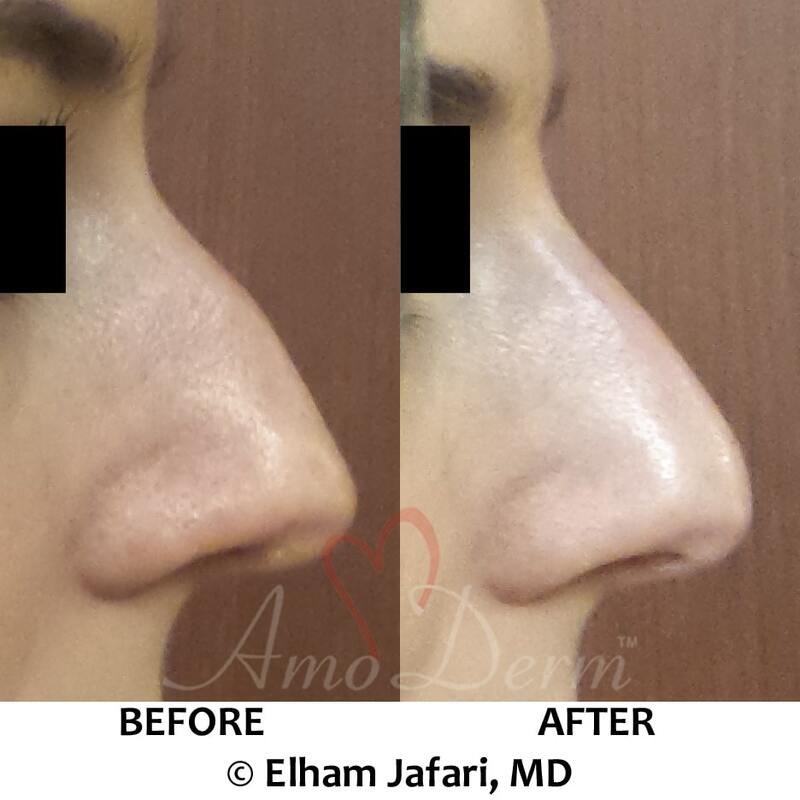 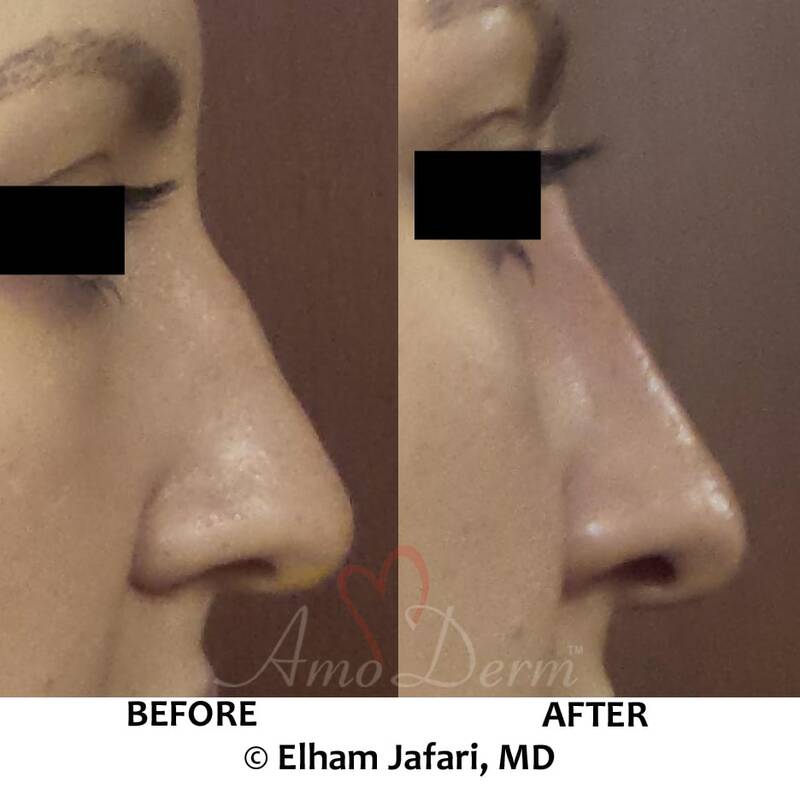 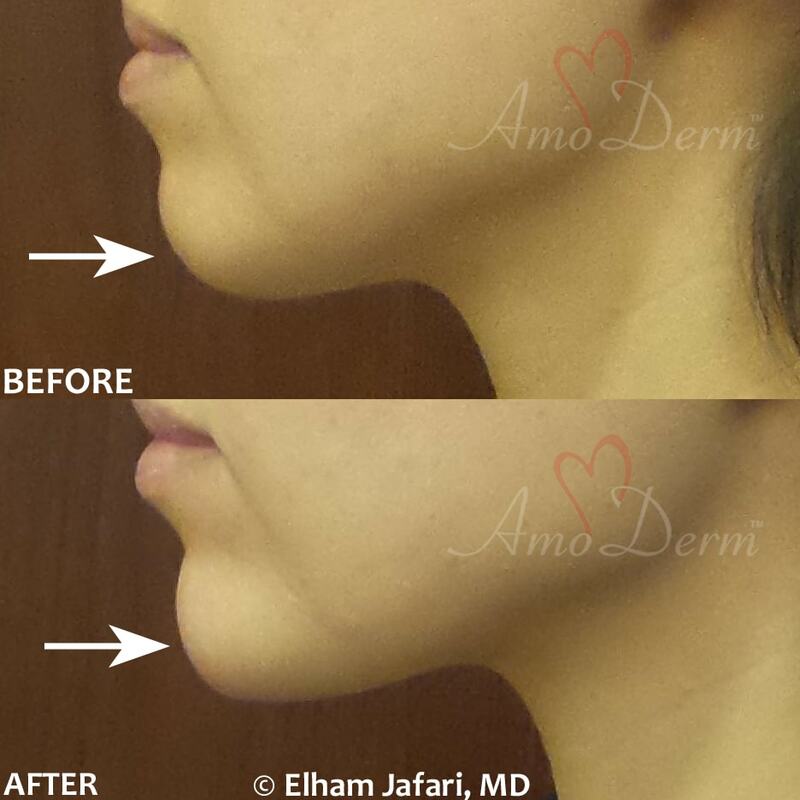 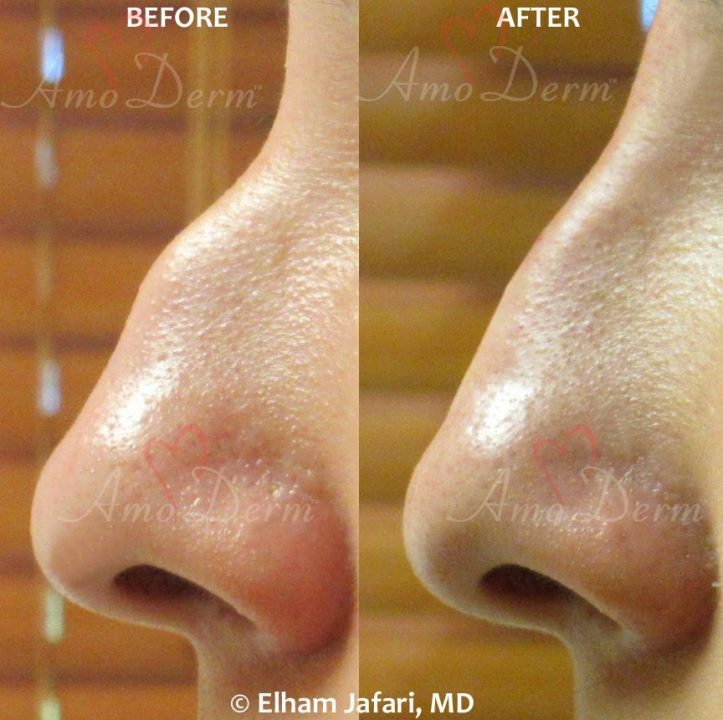 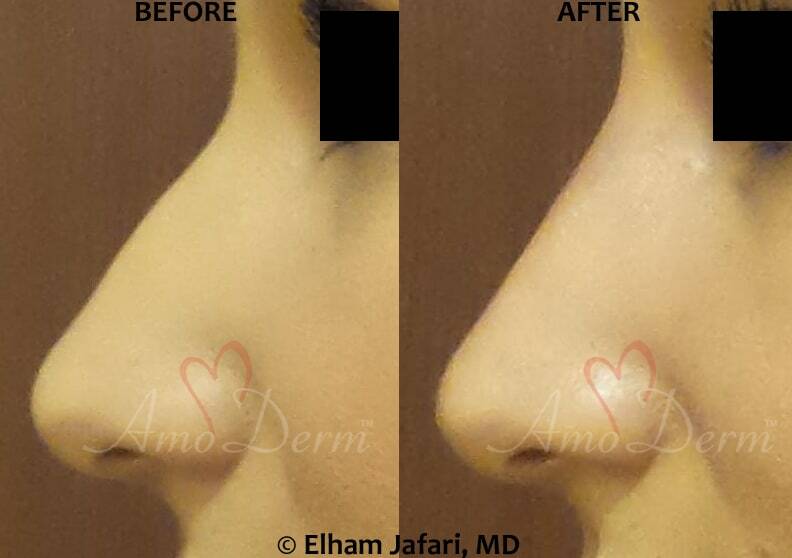 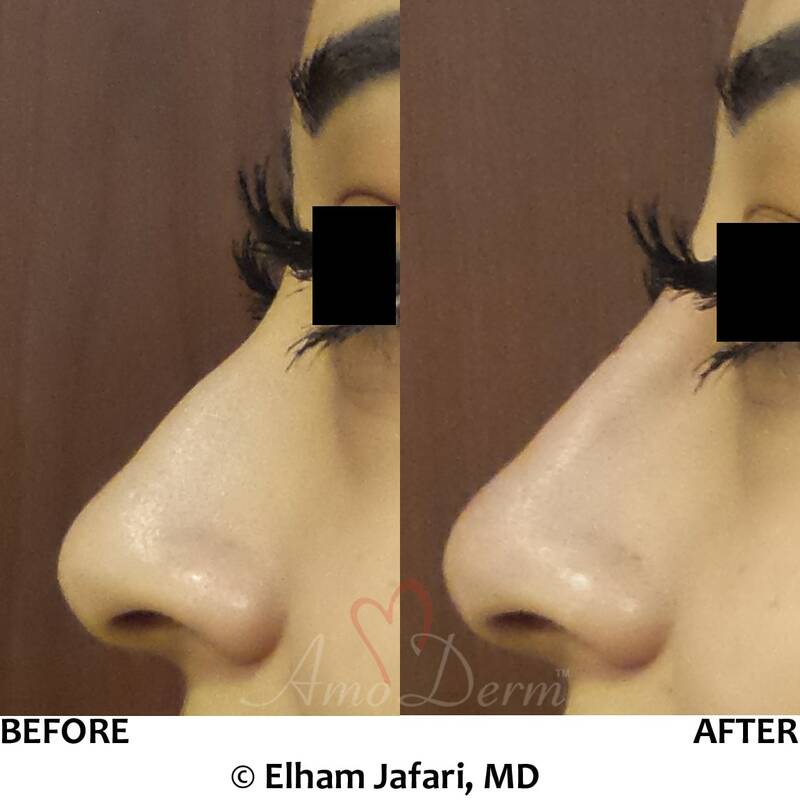 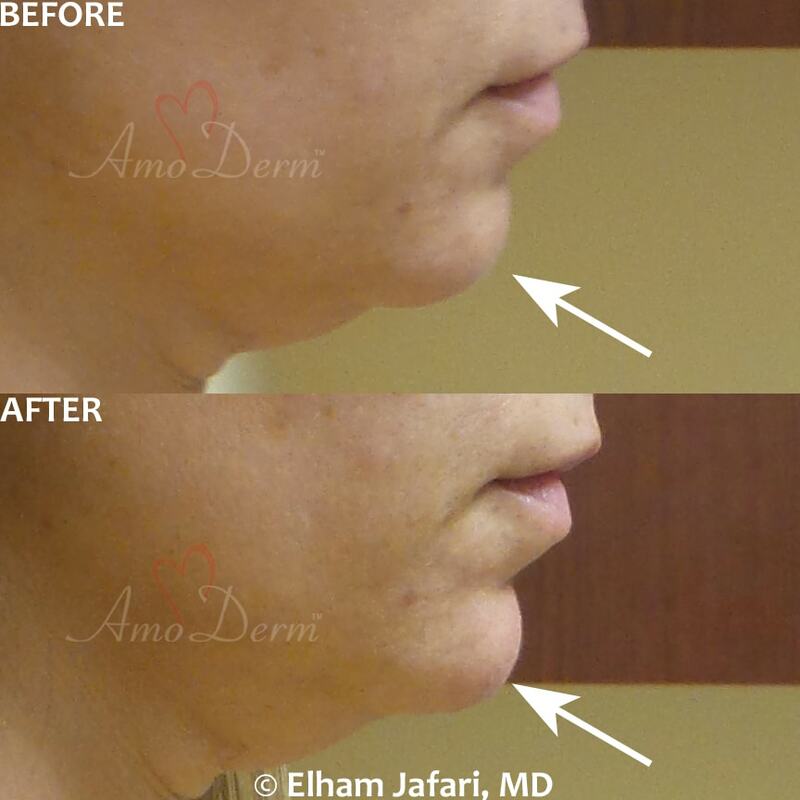 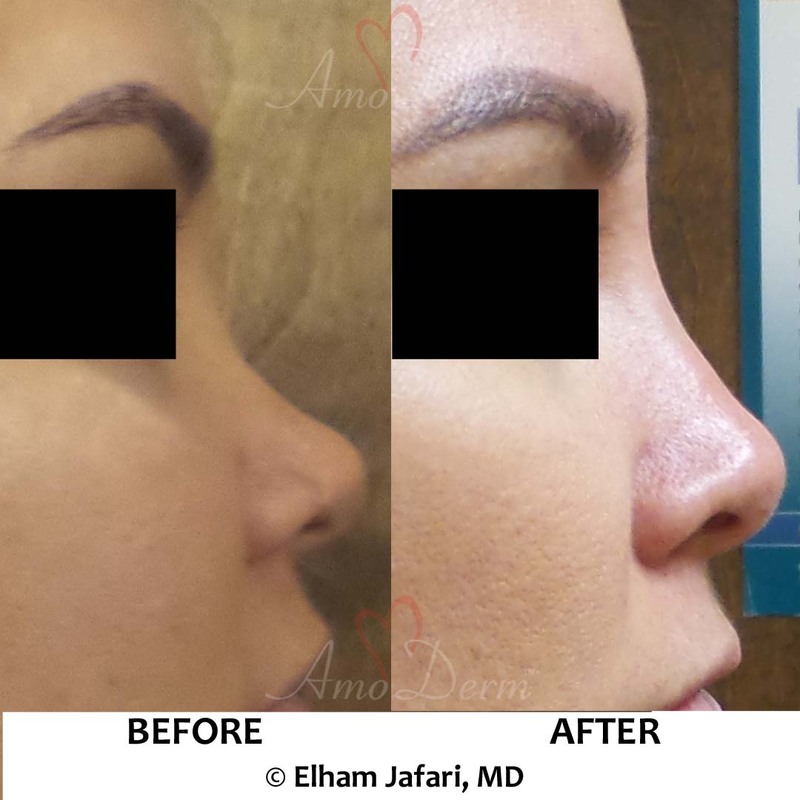 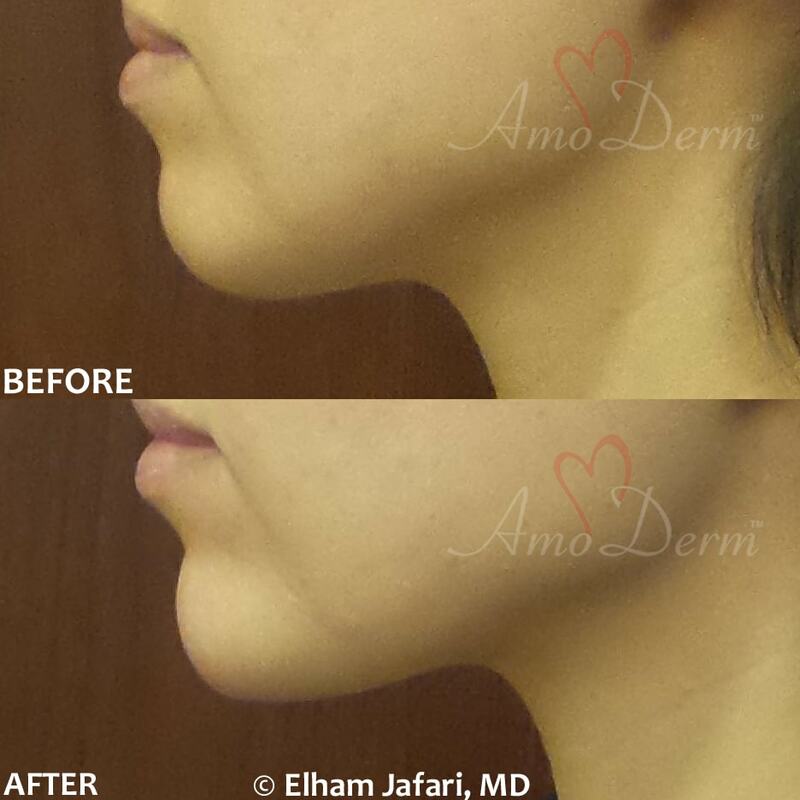 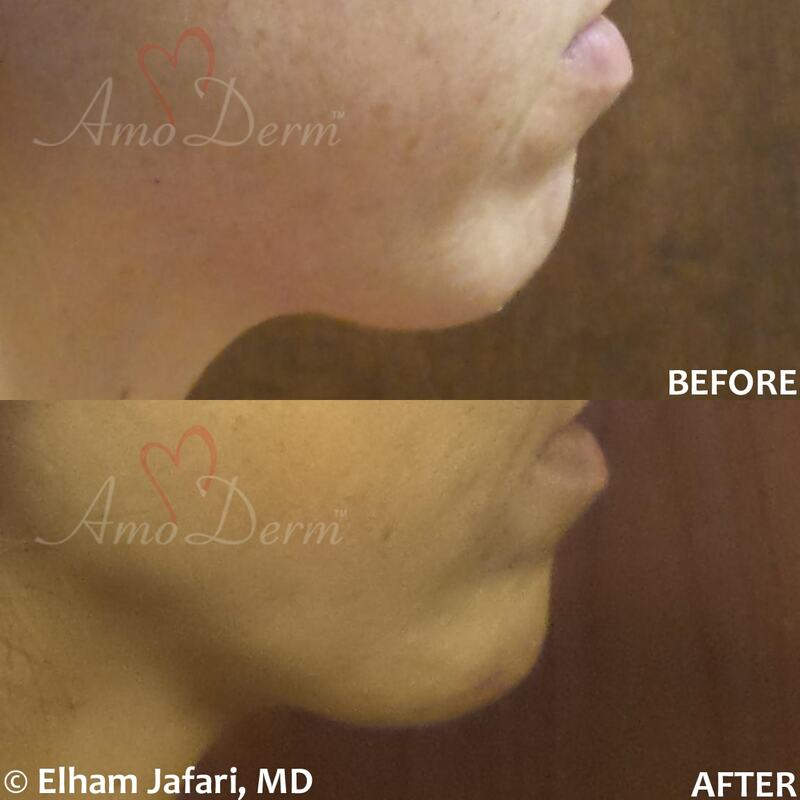 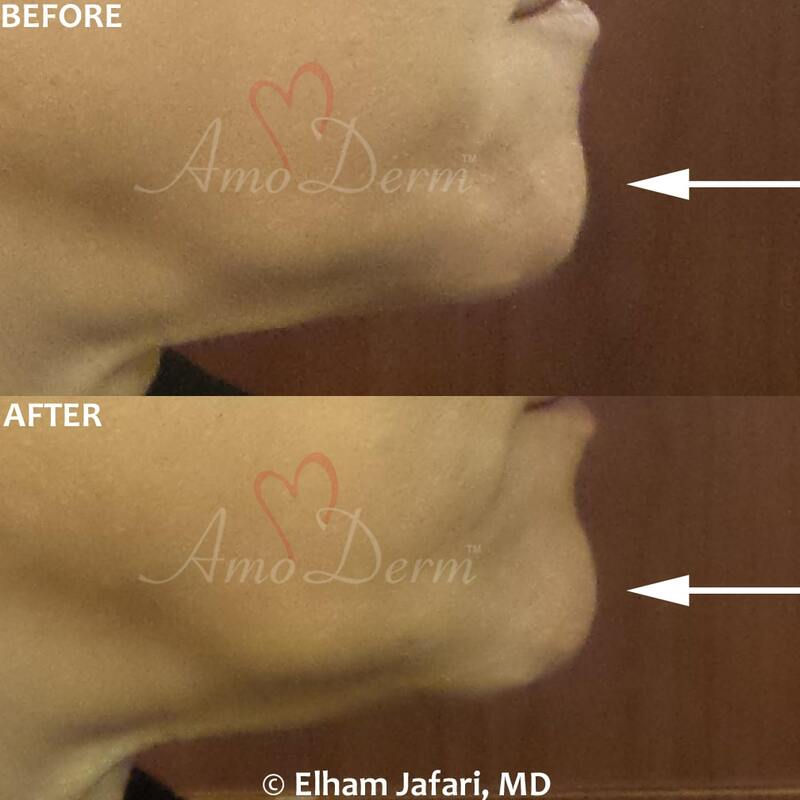 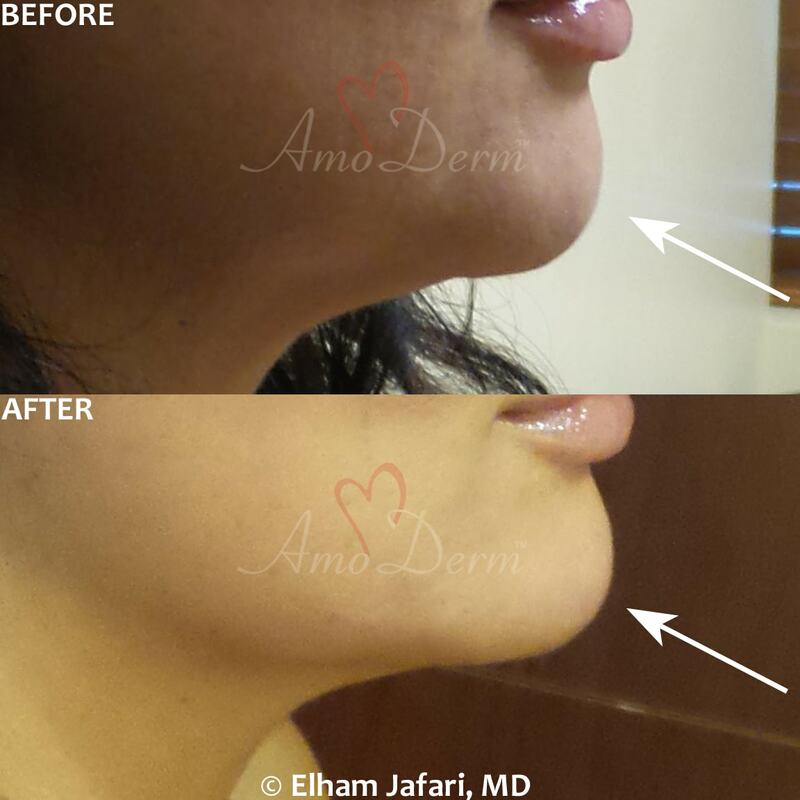 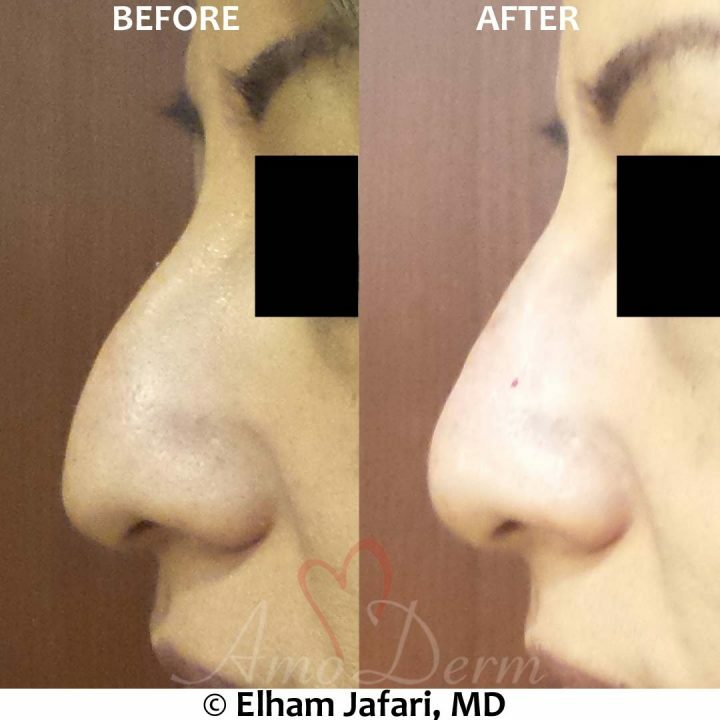 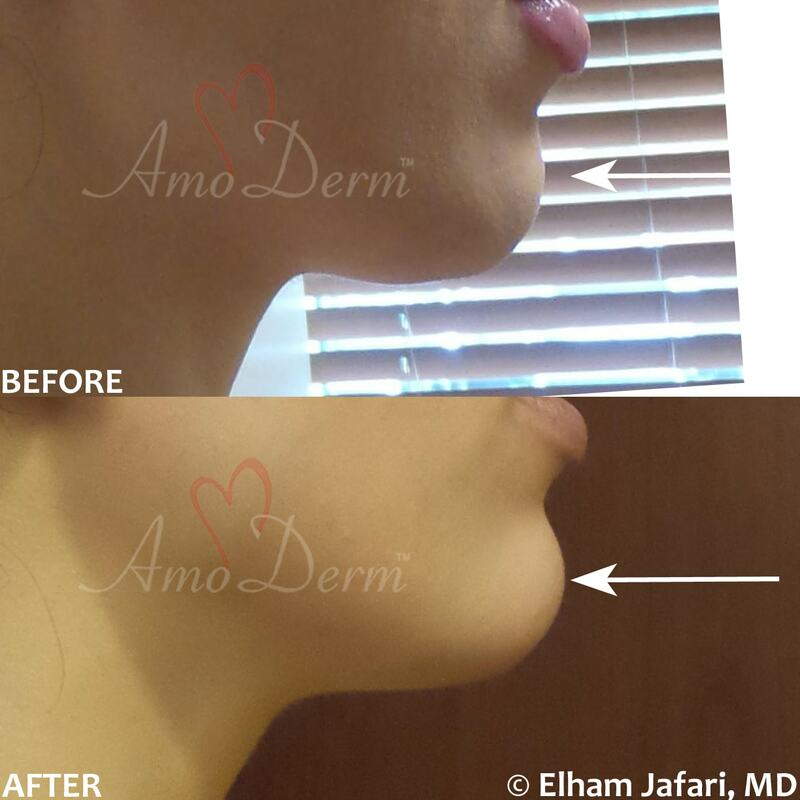 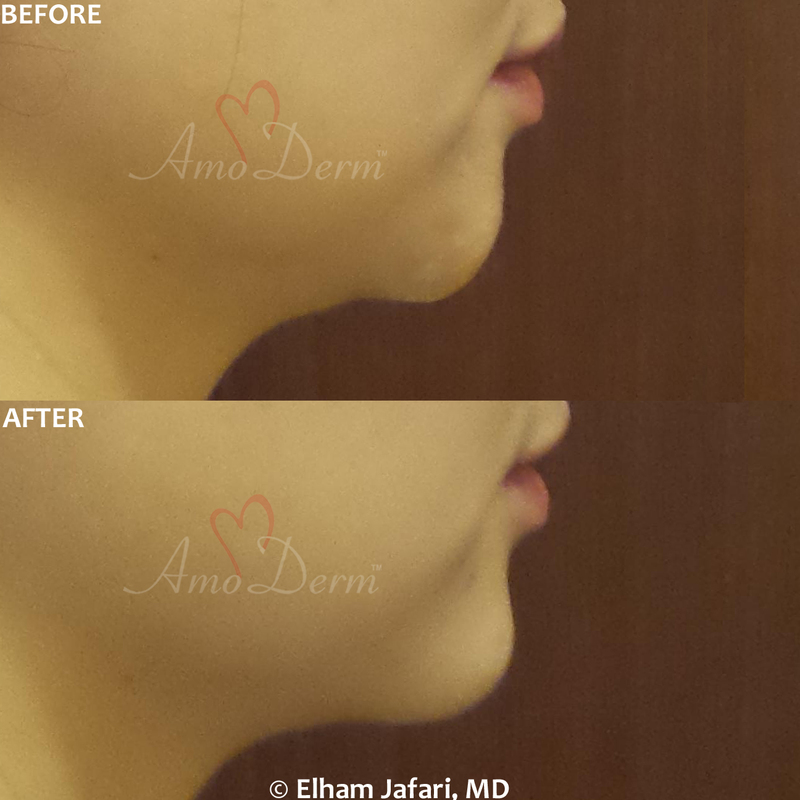 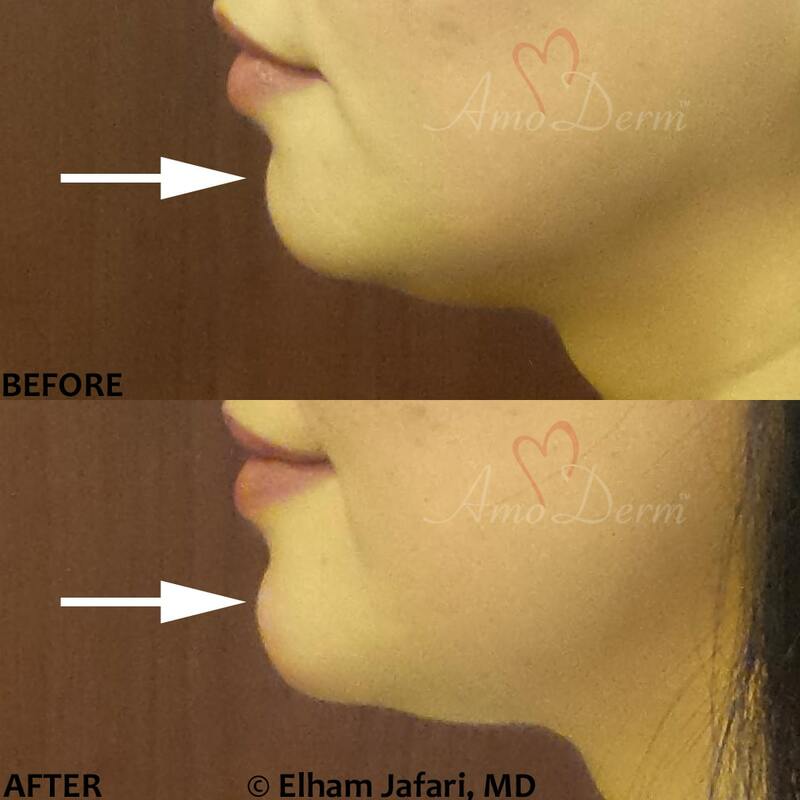 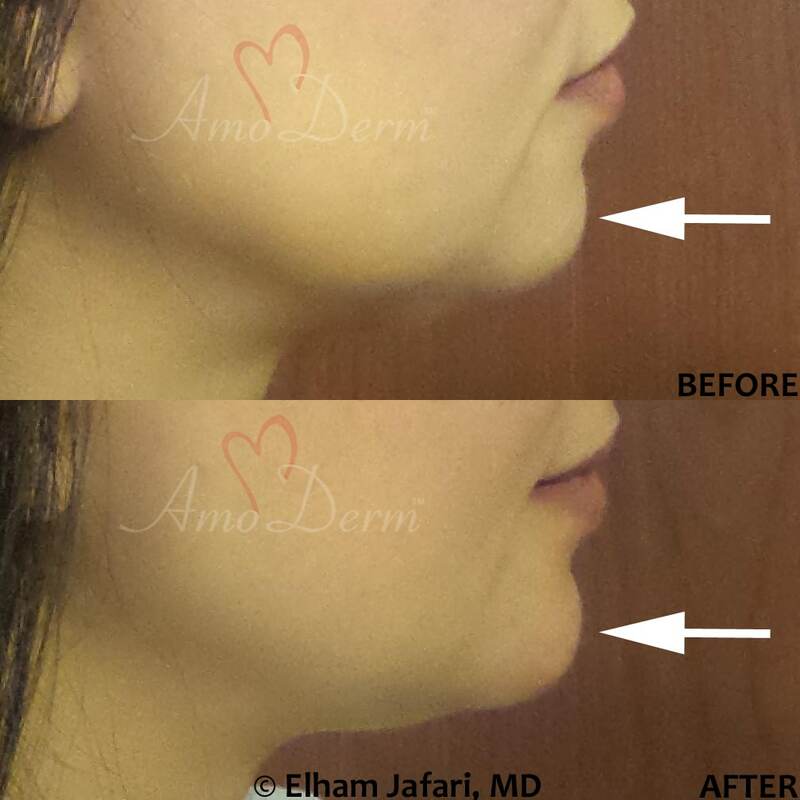 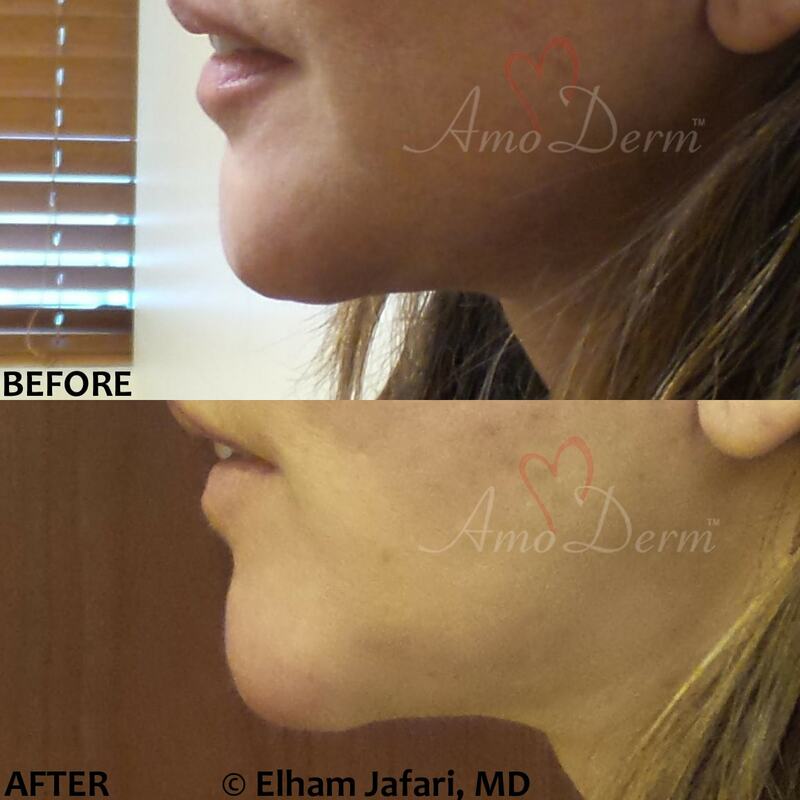 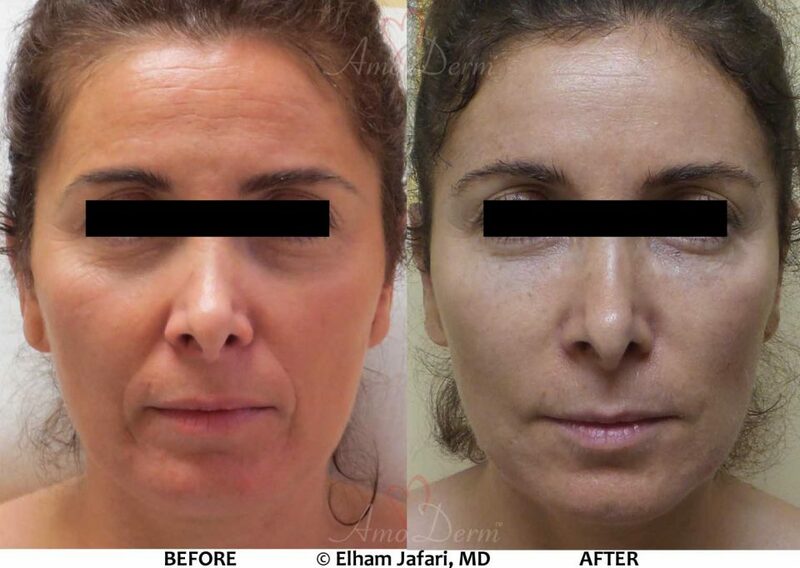 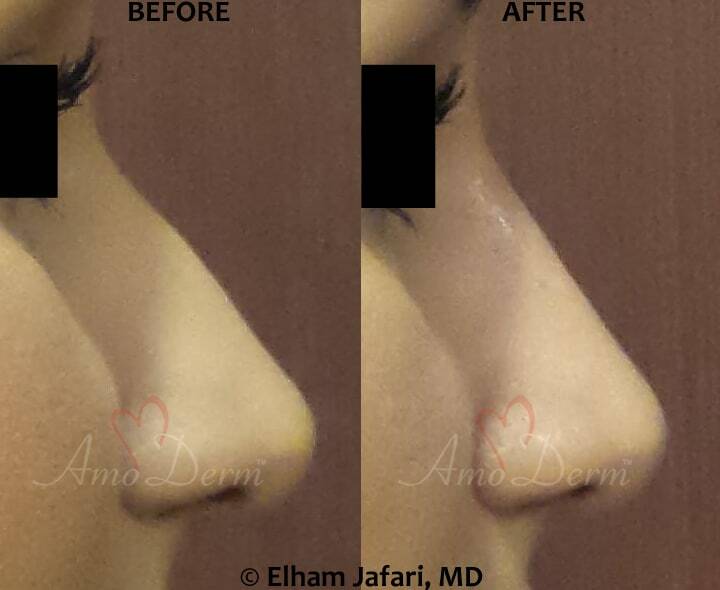 Thanks to this specific formulation, Bellafill is able to provide both immediate and long-lasting results. 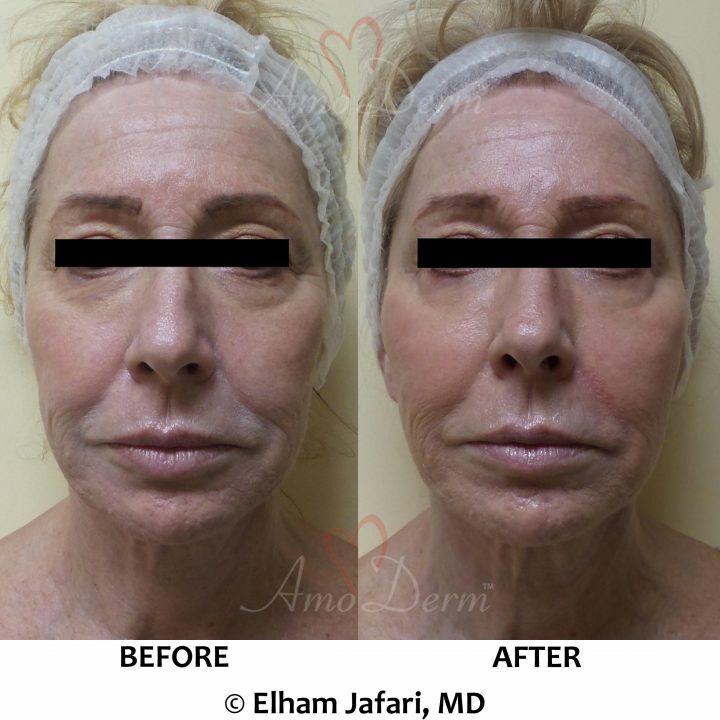 The collagen restores volume and lift the skin immediately and allows that patient to see and enjoy the results right away. 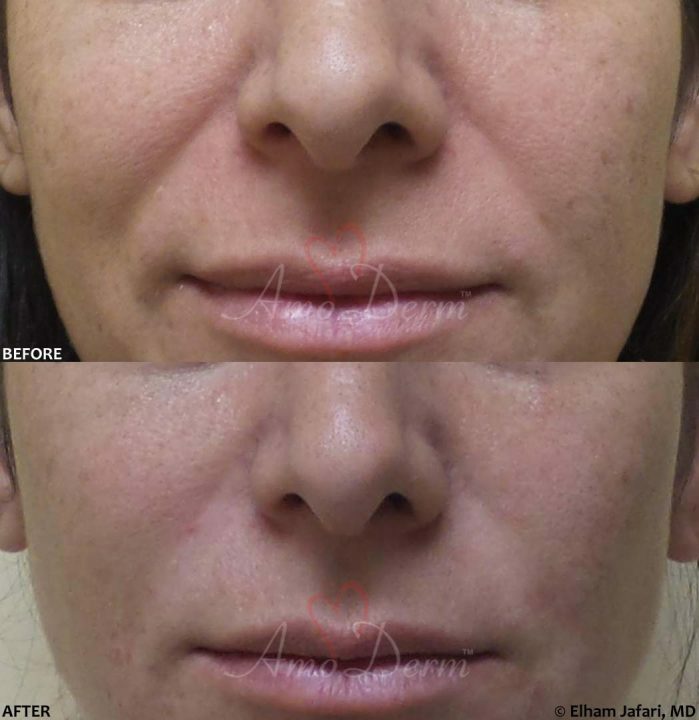 The PMMA microspheres are unique stimulatory particles that create a matrix that enhances and stimulates the body to make more collagen in the coming weeks and months, ensuring sustained and long-lasting results. 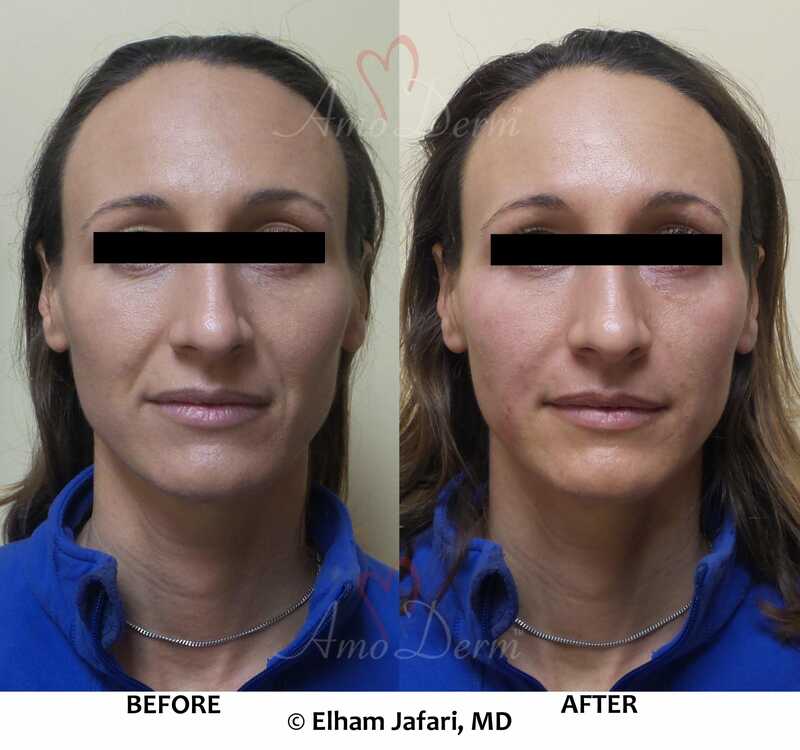 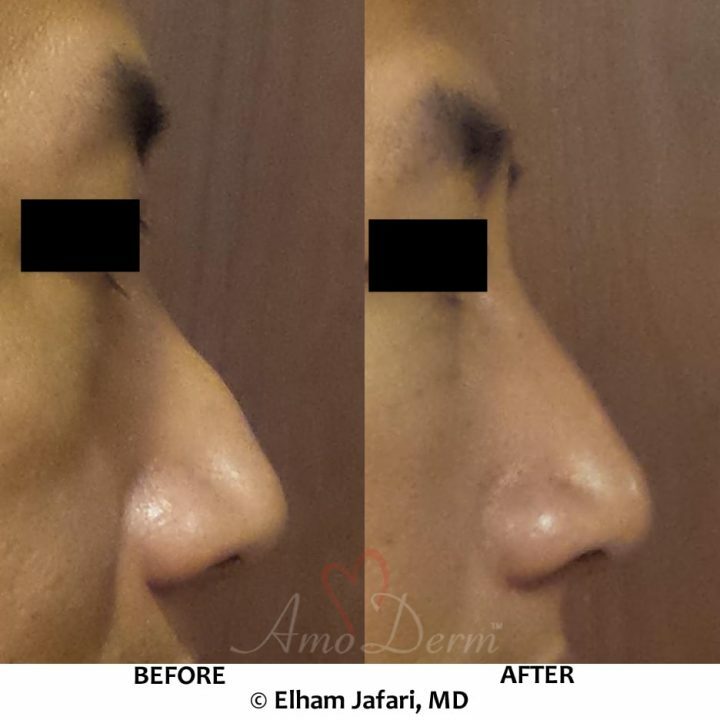 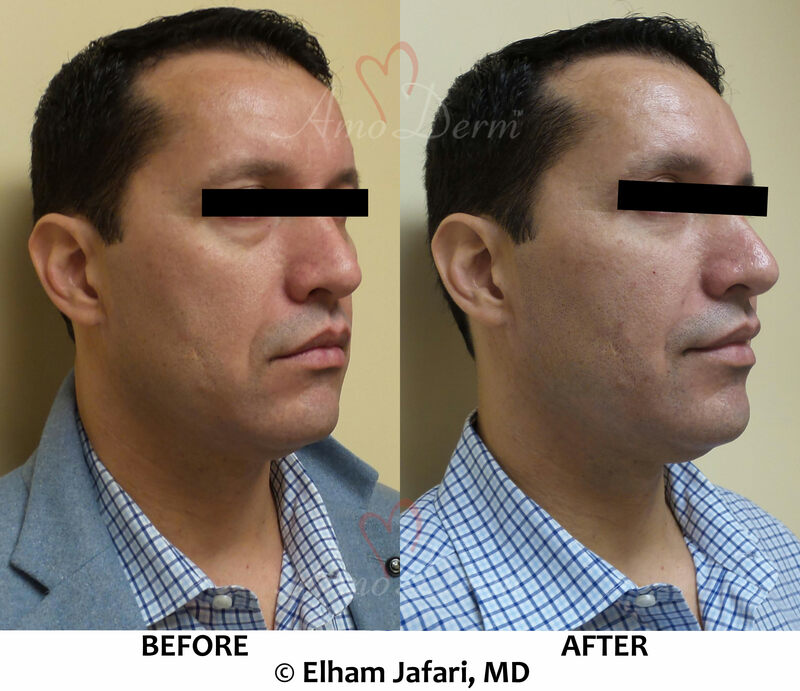 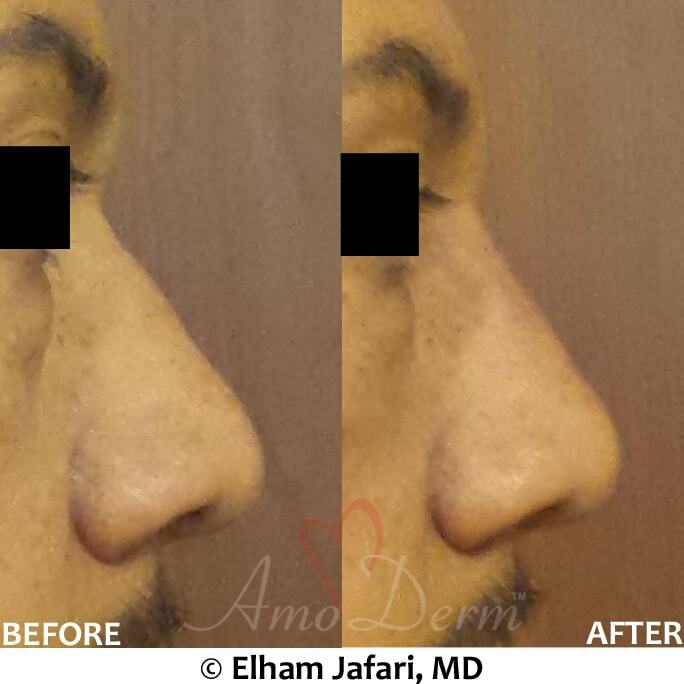 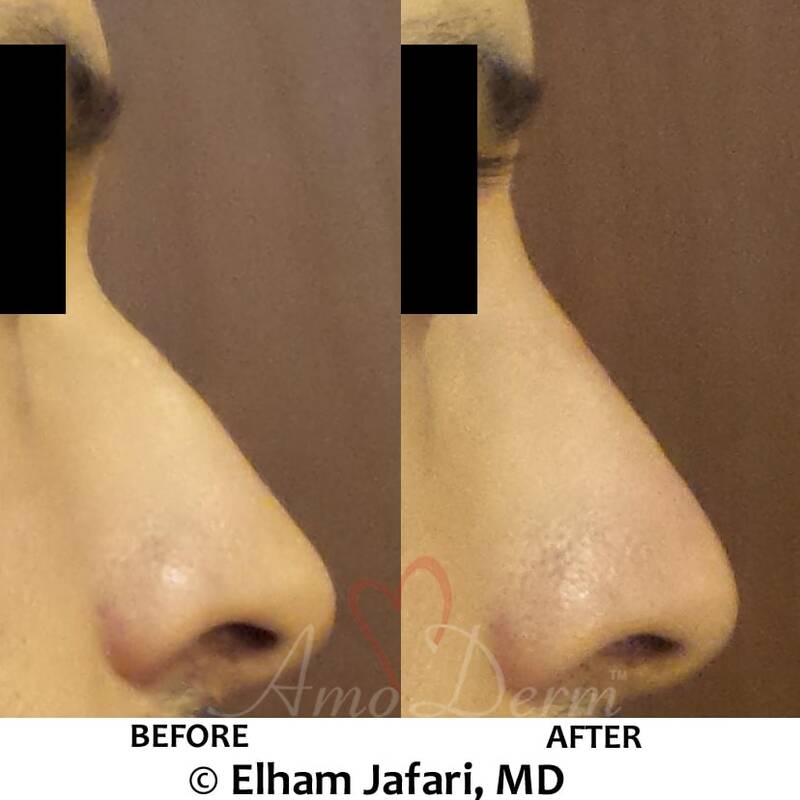 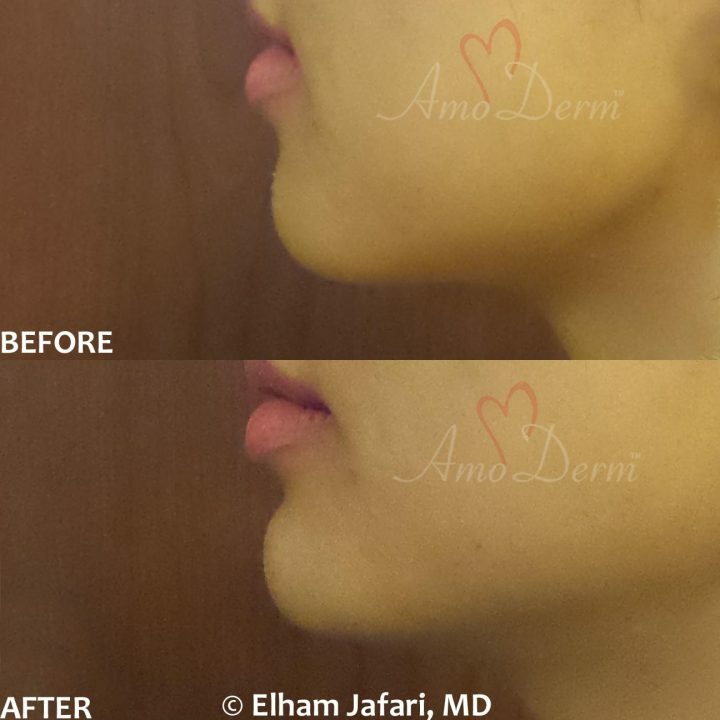 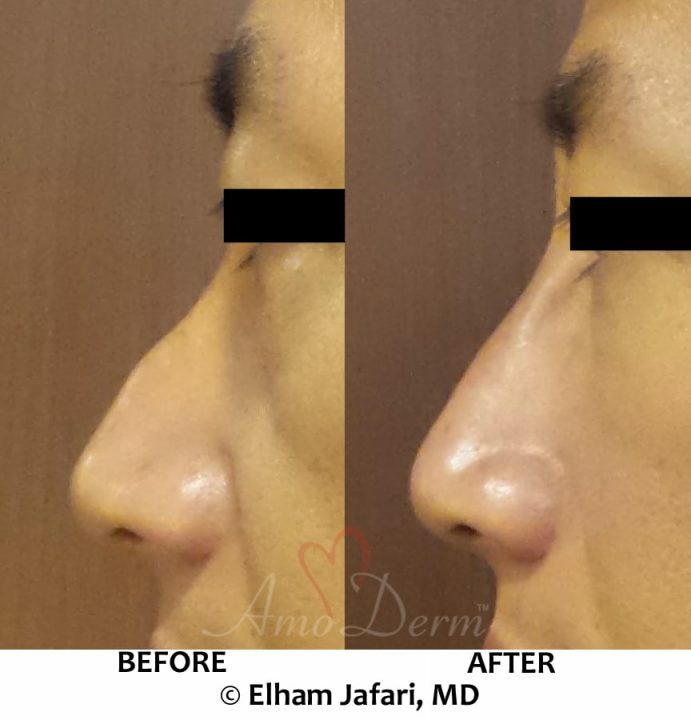 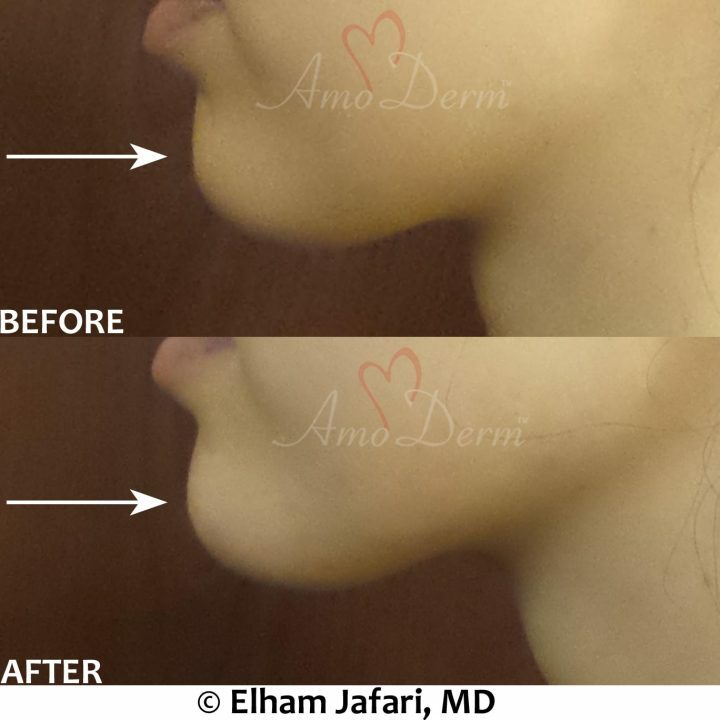 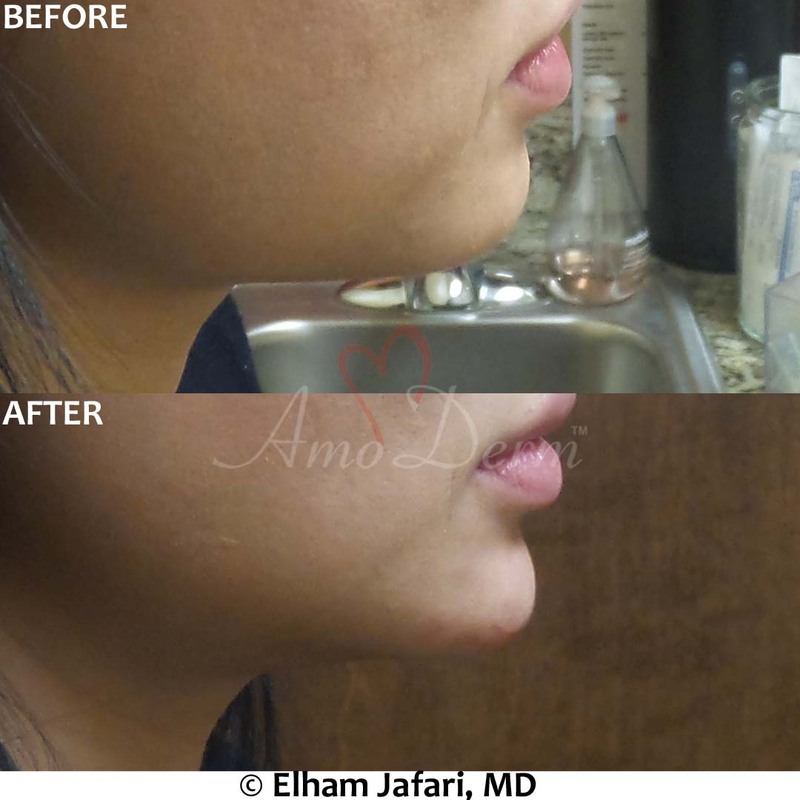 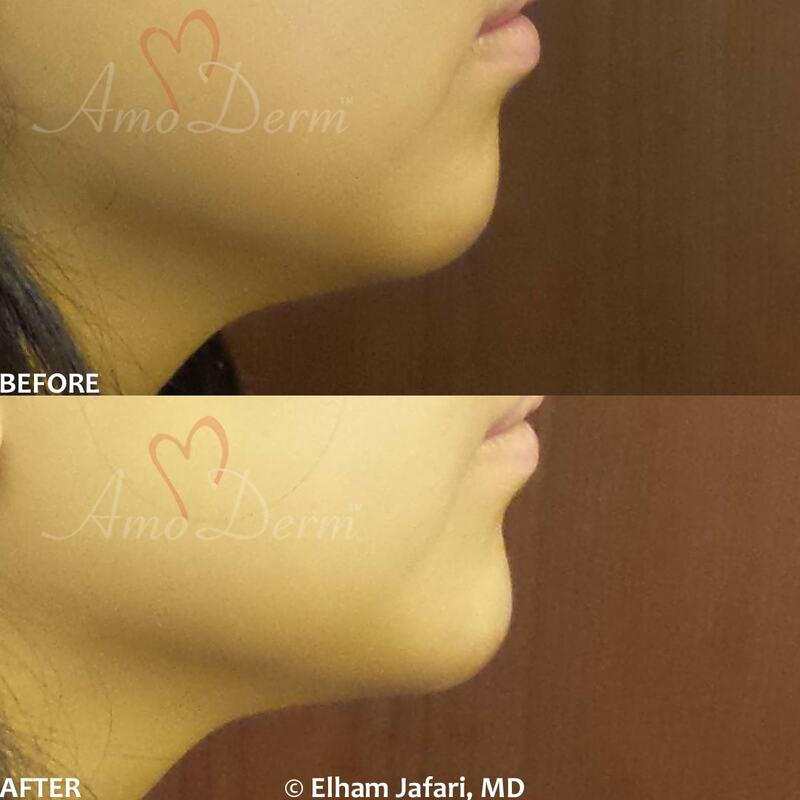 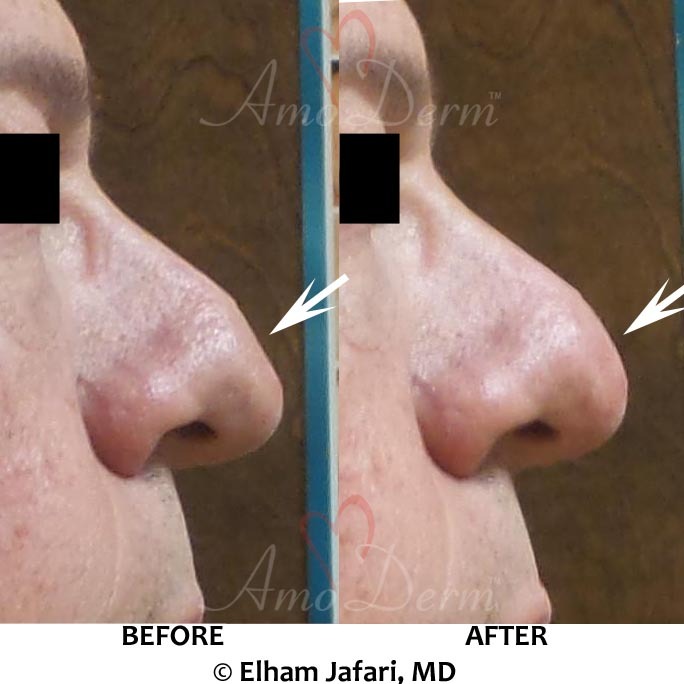 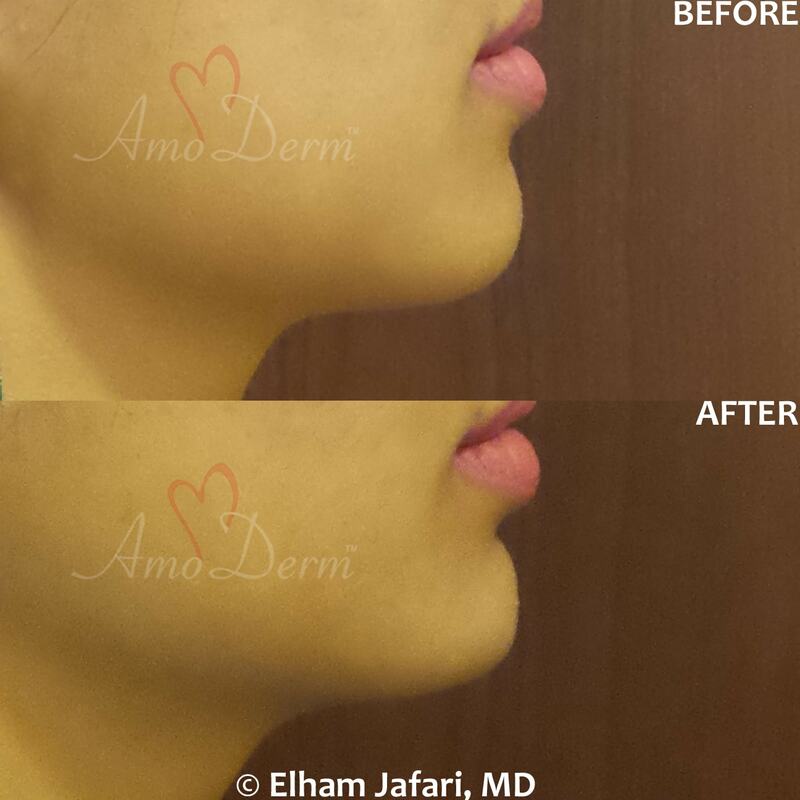 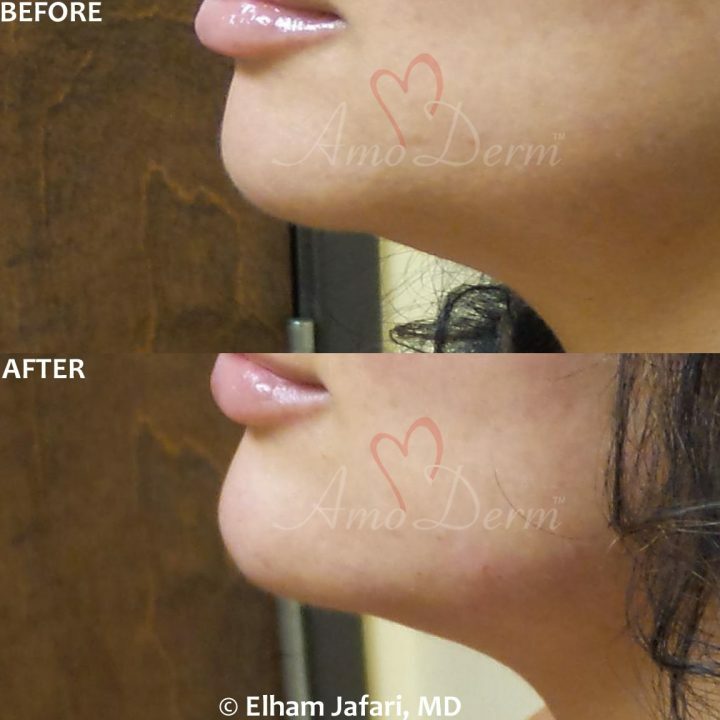 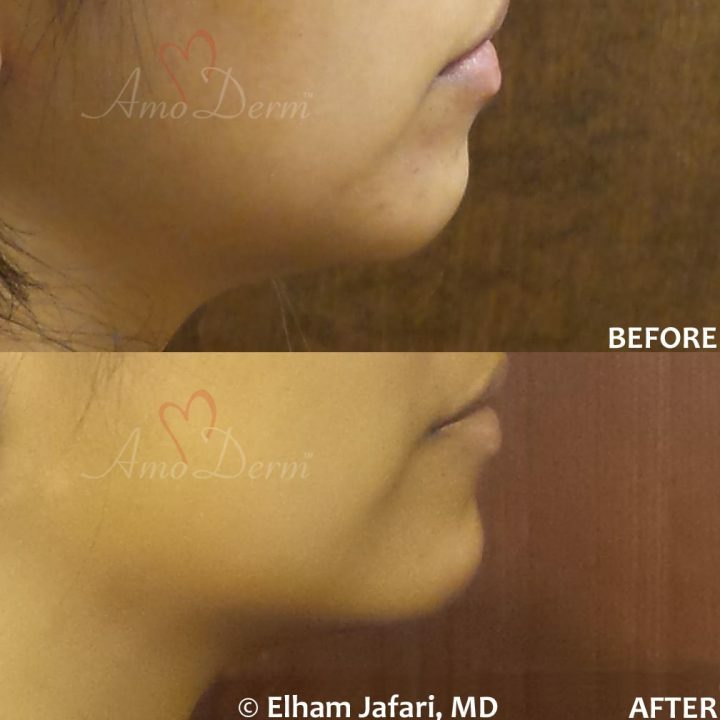 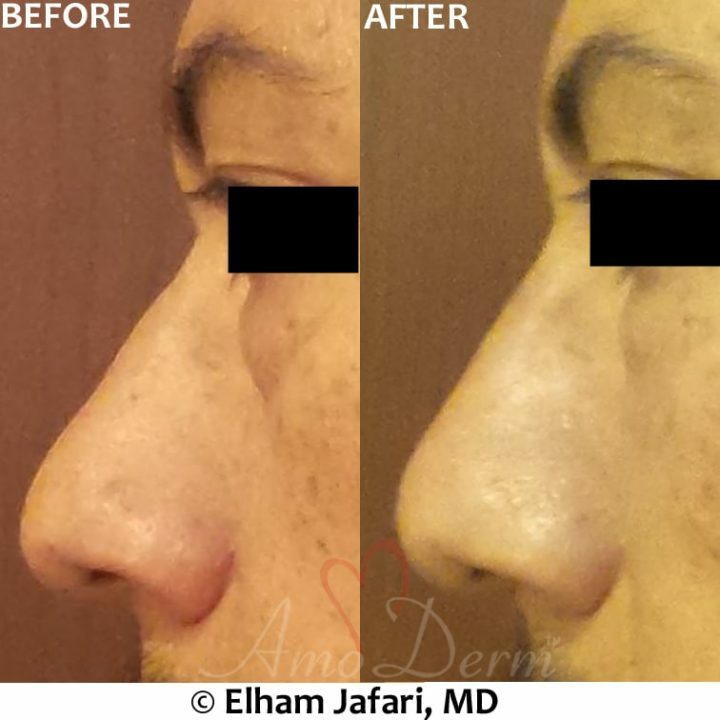 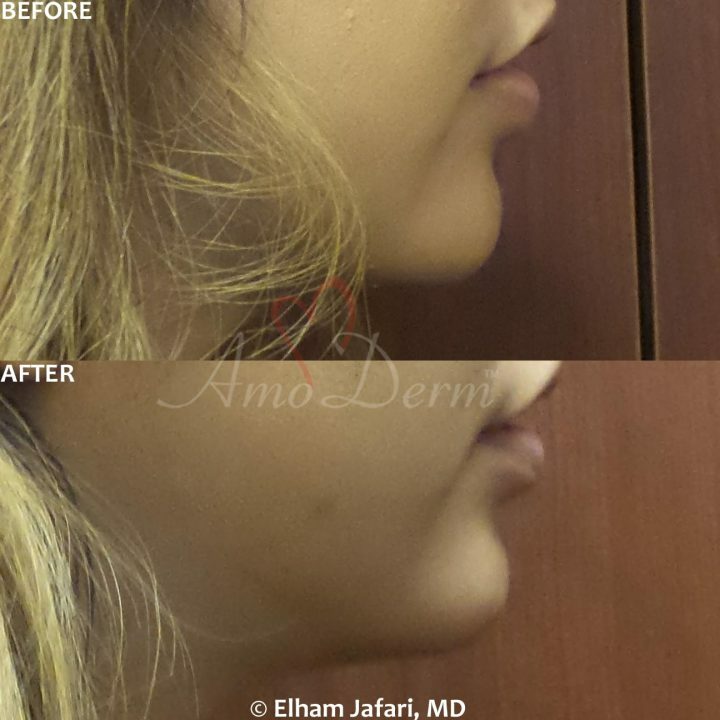 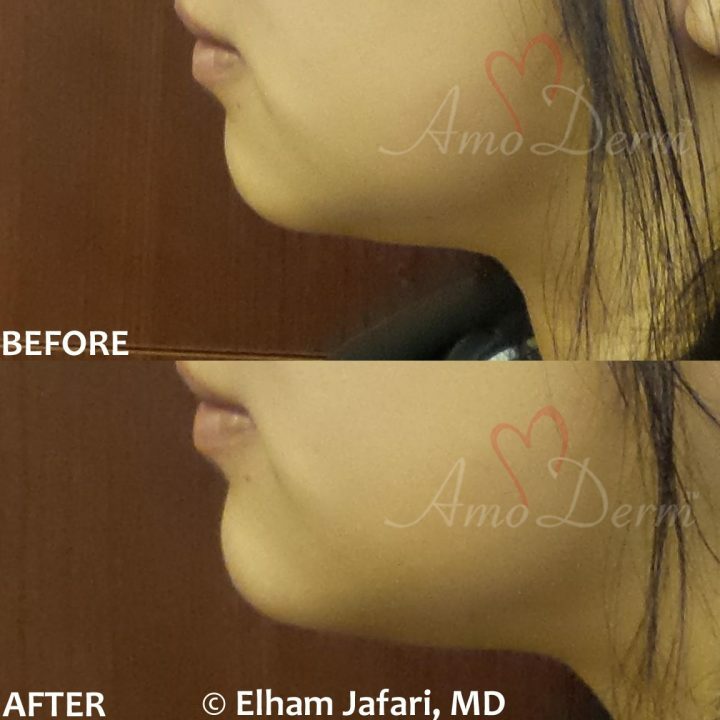 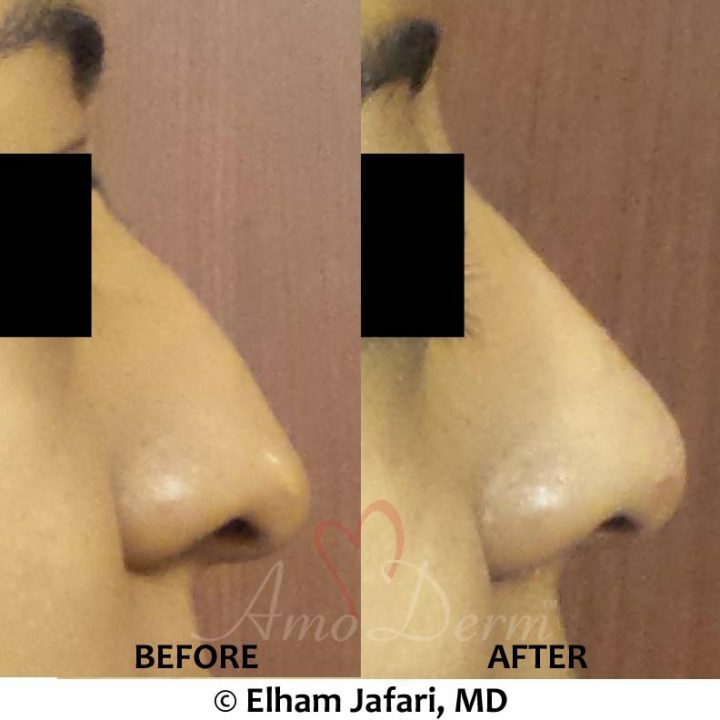 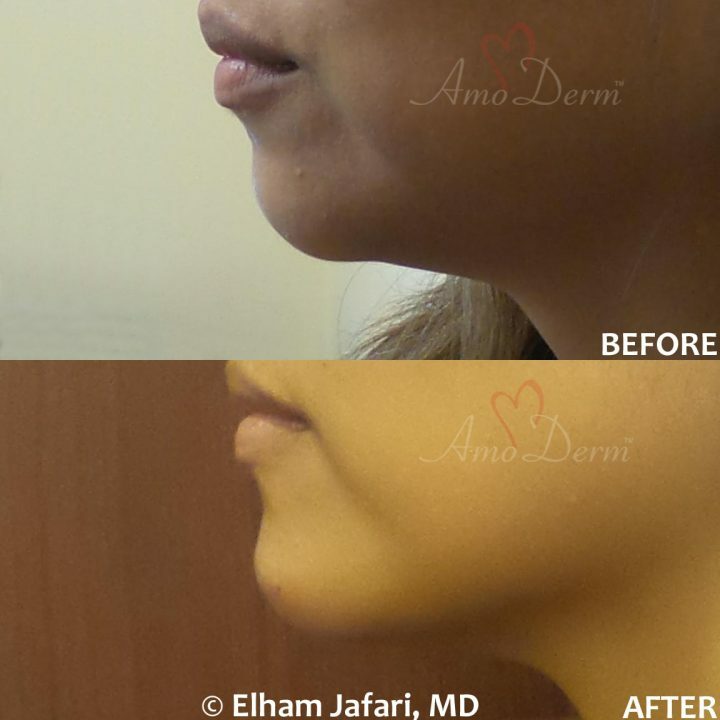 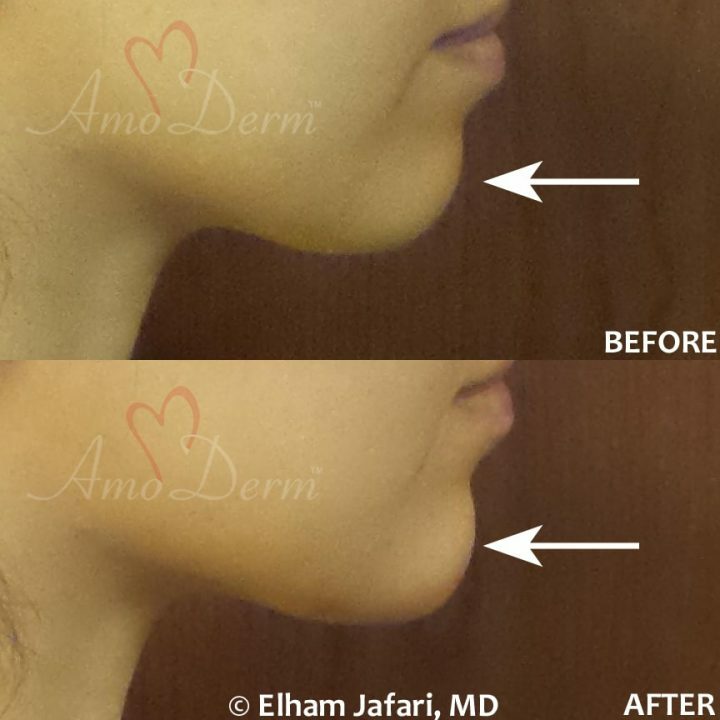 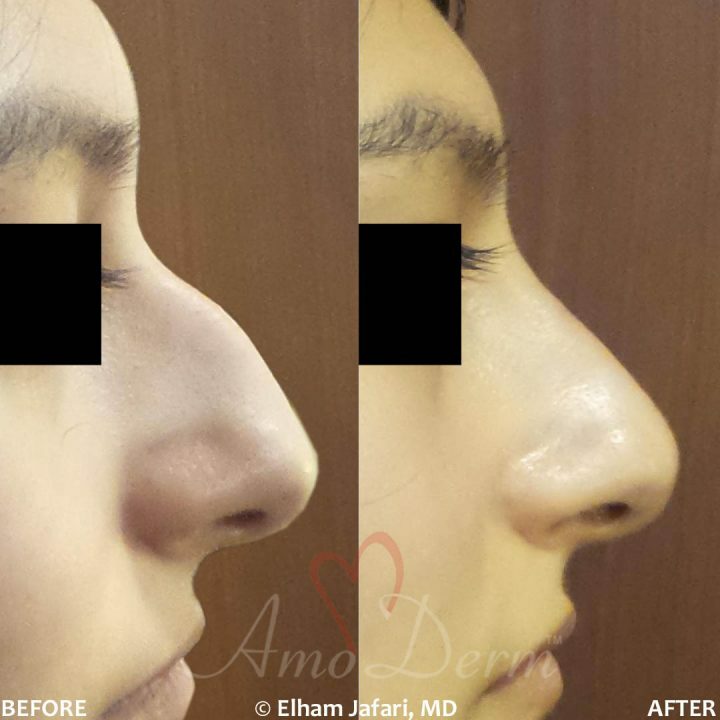 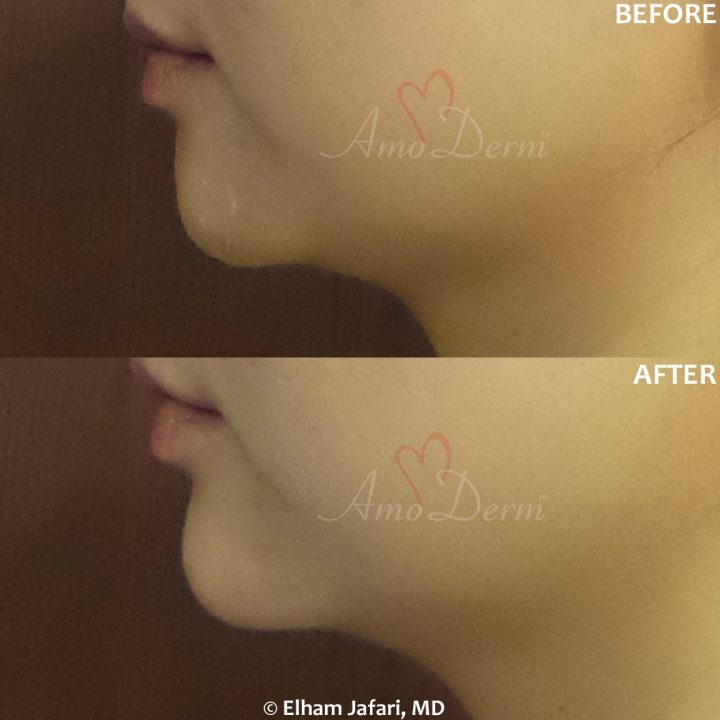 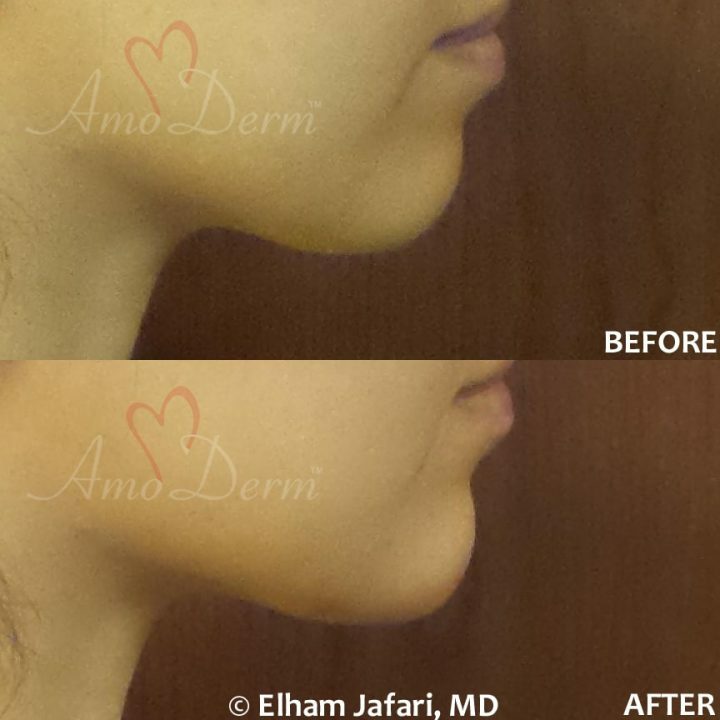 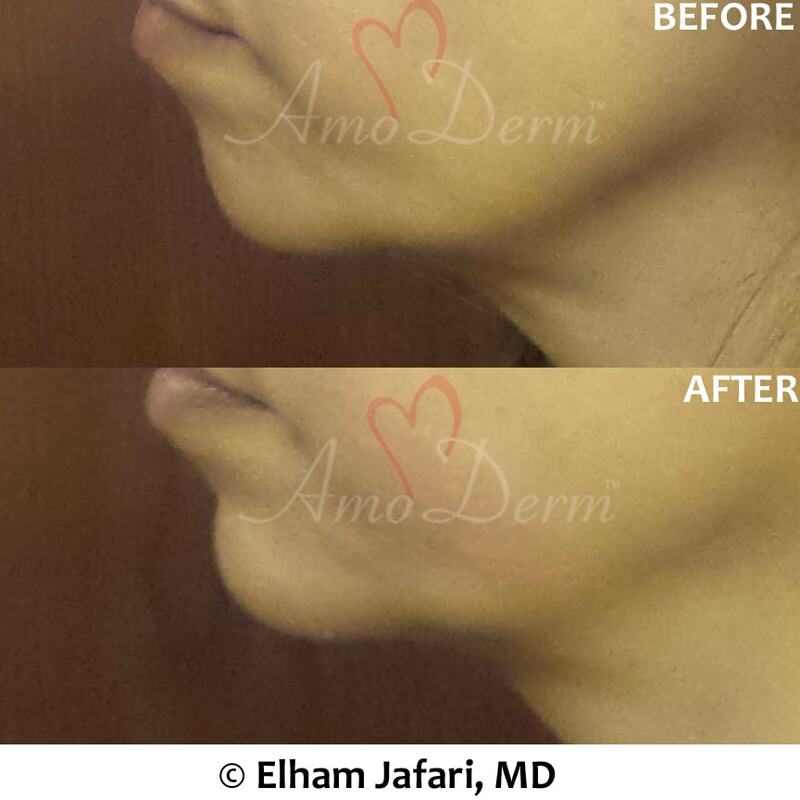 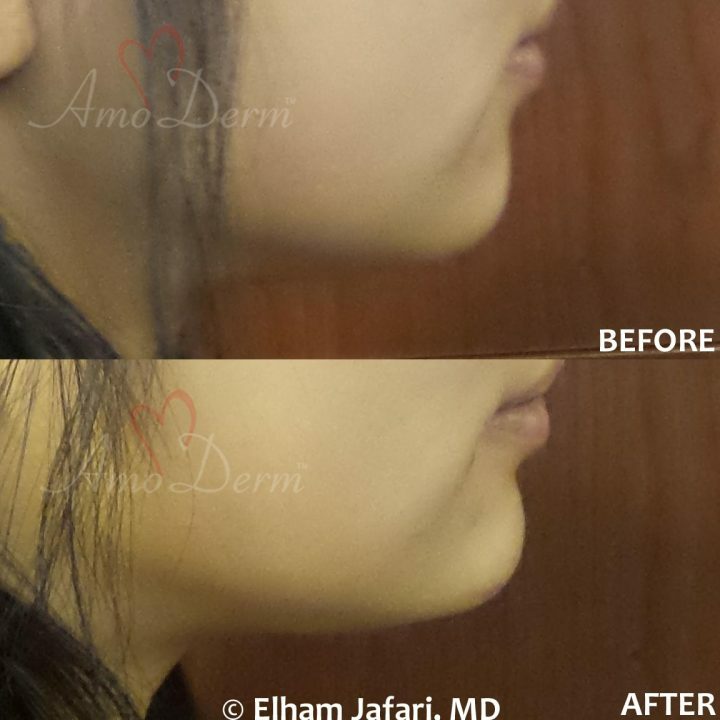 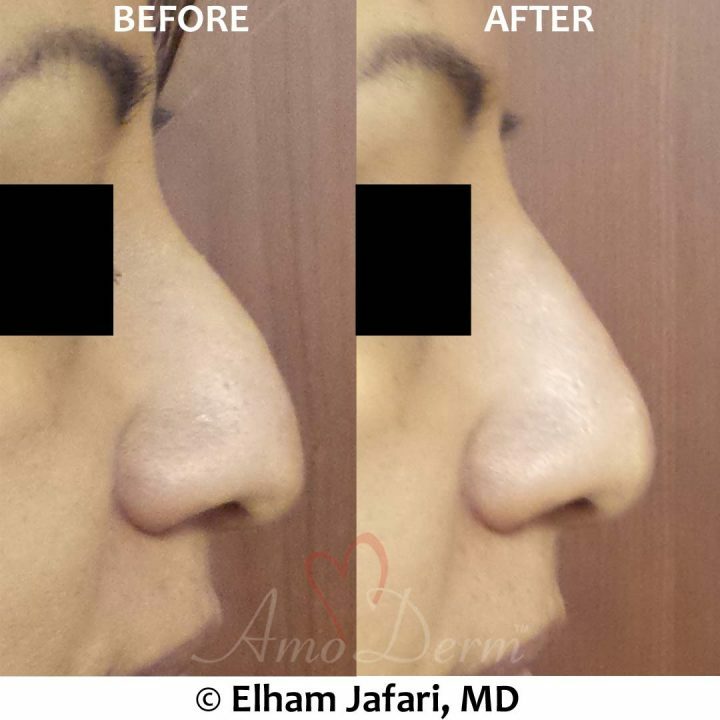 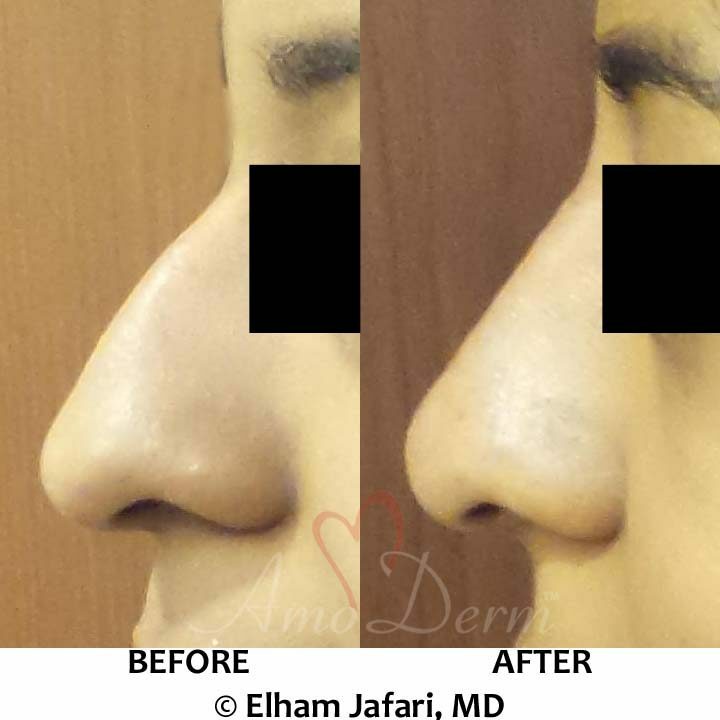 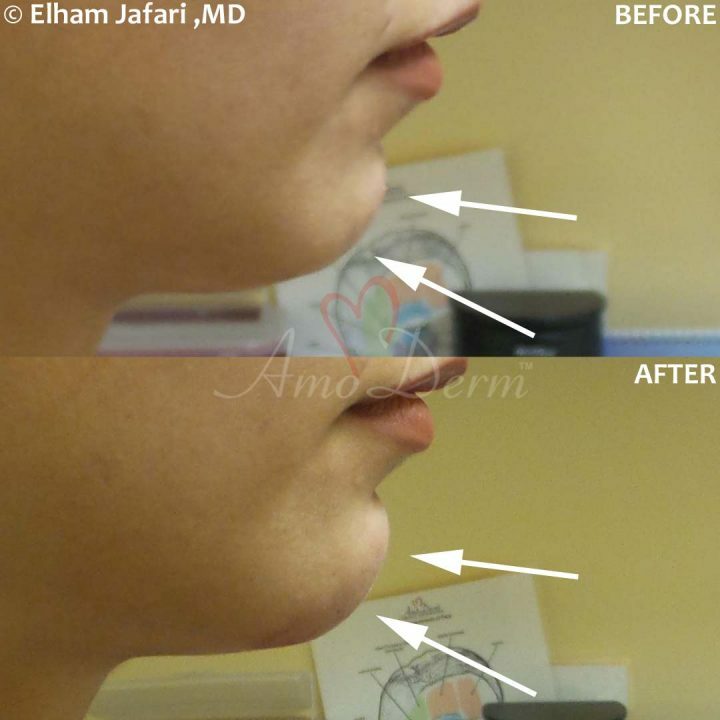 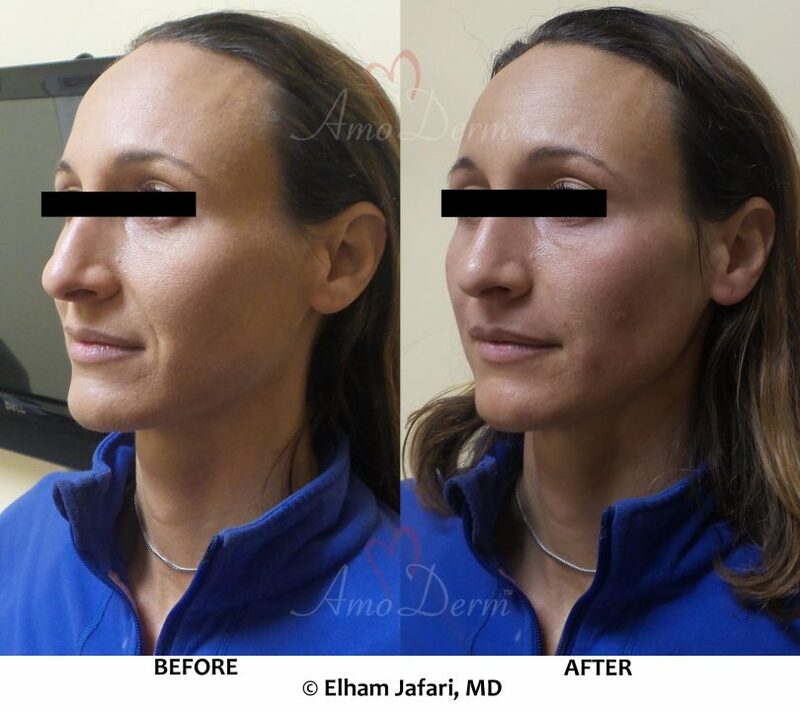 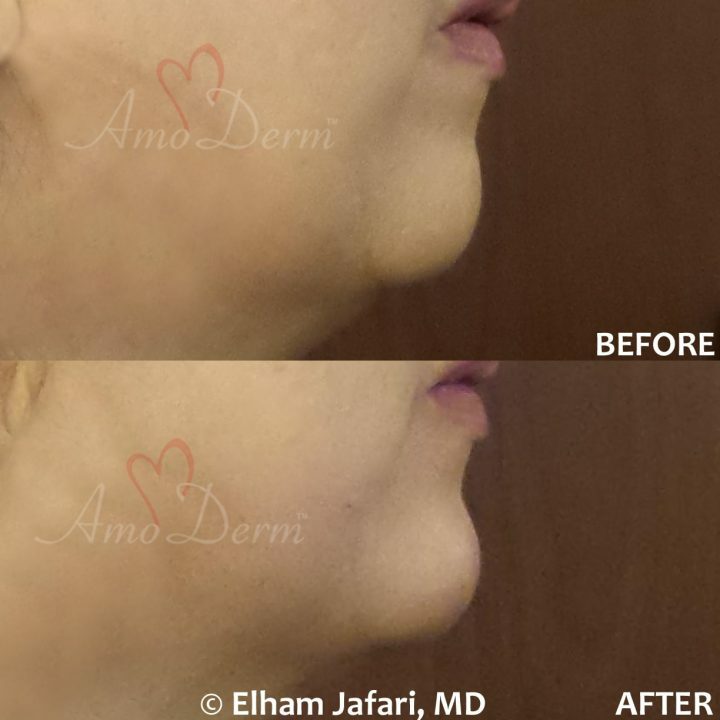 How Is the Bellafill Treatment Performed? 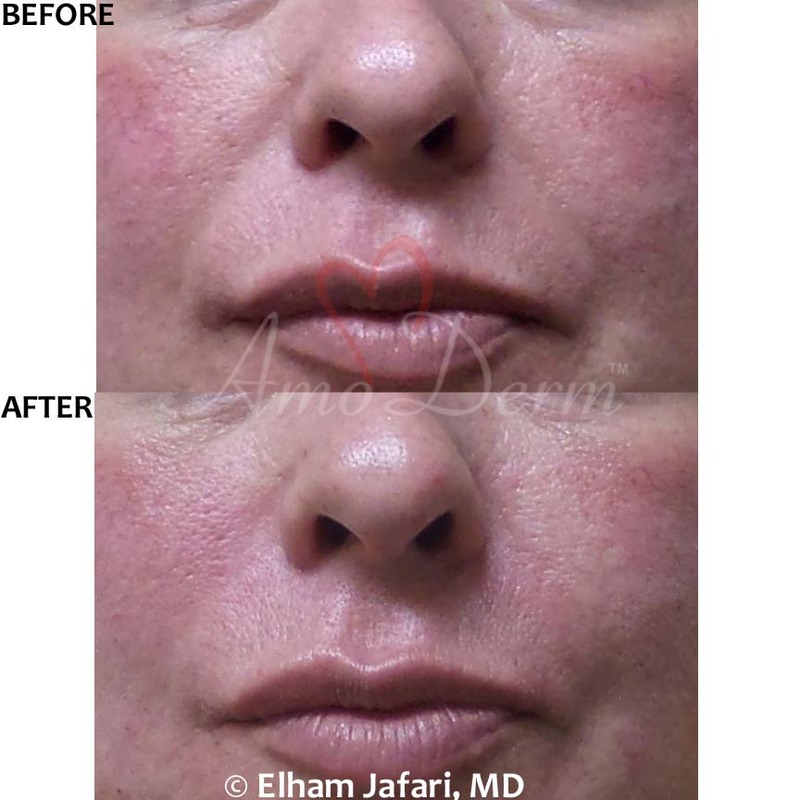 During the first appointment, your doctor performs a skin test by injecting a tiny amount of Bellafill into your skin prior to performing the main injection. This test dose helps identify if you are allergic to collagen or other components of Bellafill treatment (e.g. 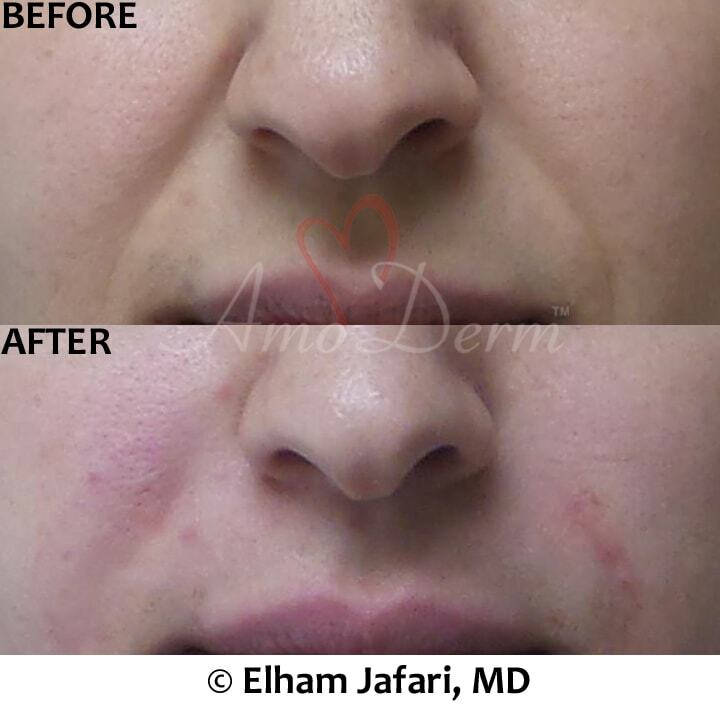 lidocaine which is provided to numb the skin and reduce any pain or discomfort). 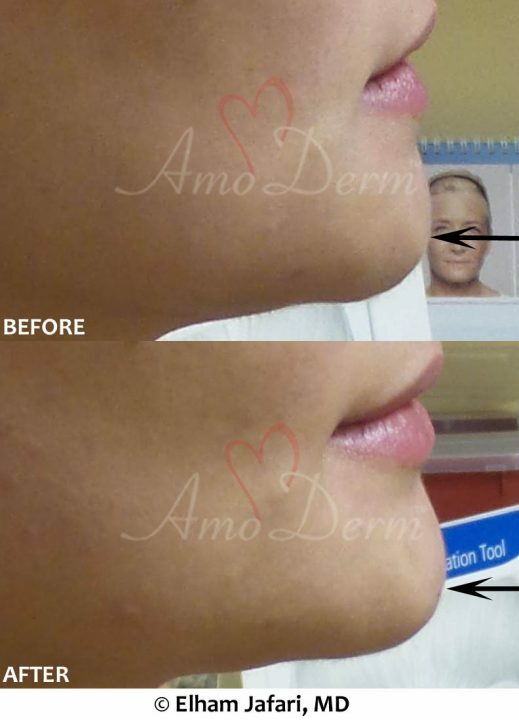 Once the skin test is done and if you do not show any reactions, your doctor will see you for the second and main treatment session, usually around 4 weeks following the skin test appointment, during which she will perform the full injection. 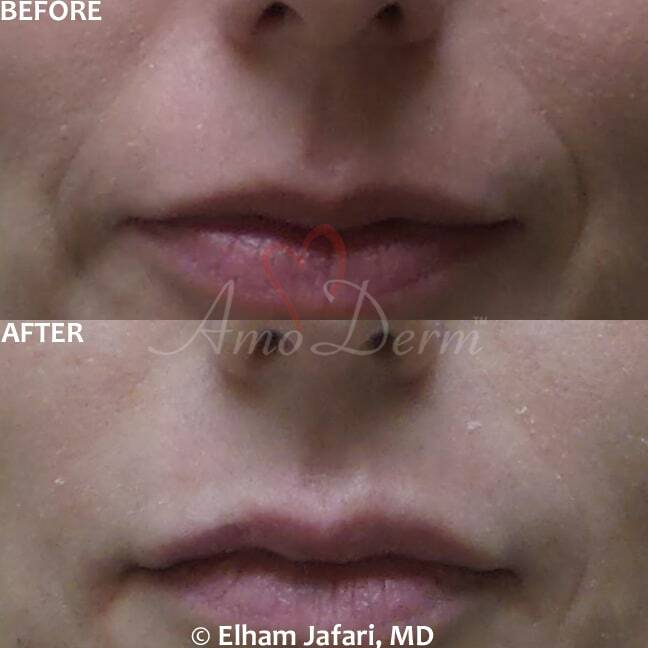 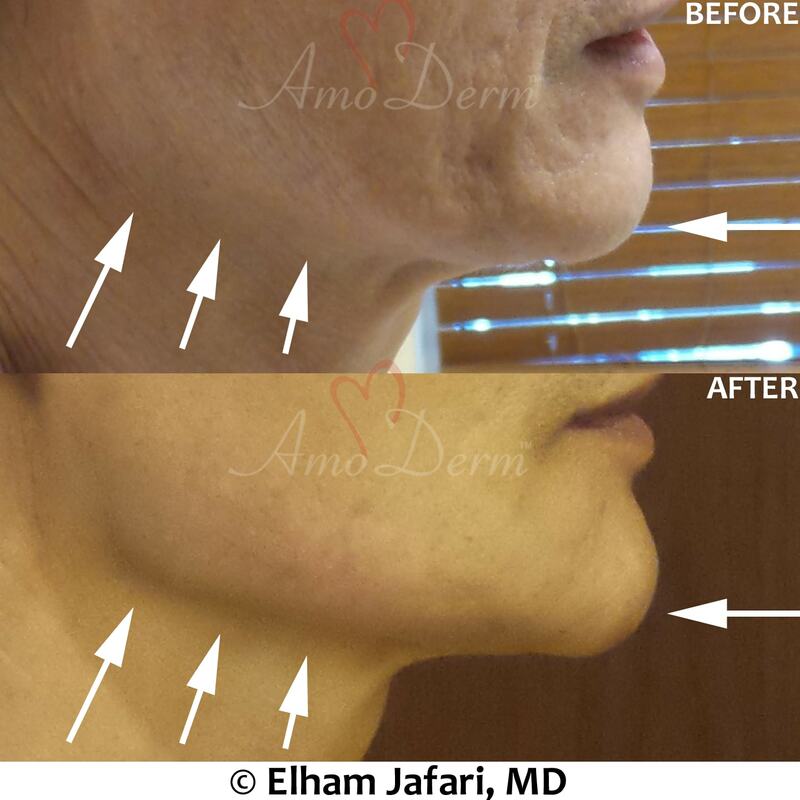 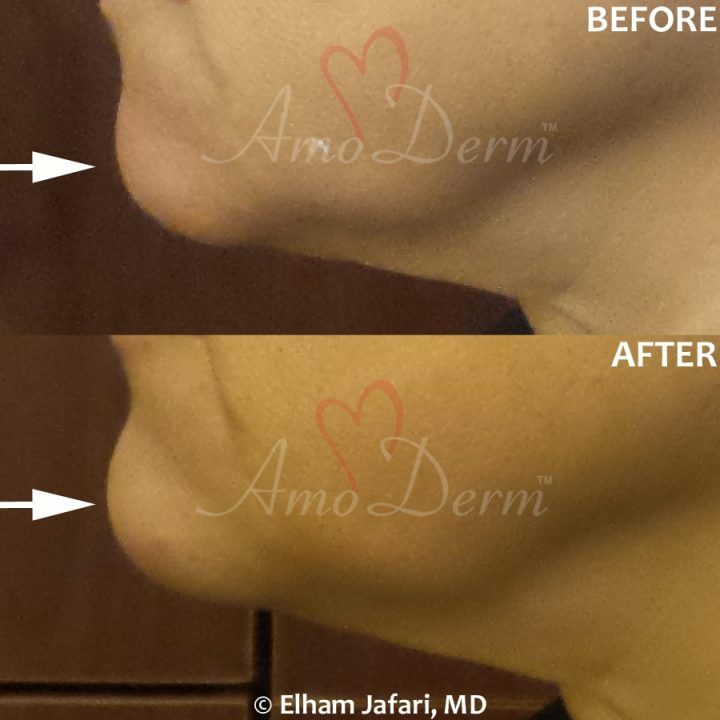 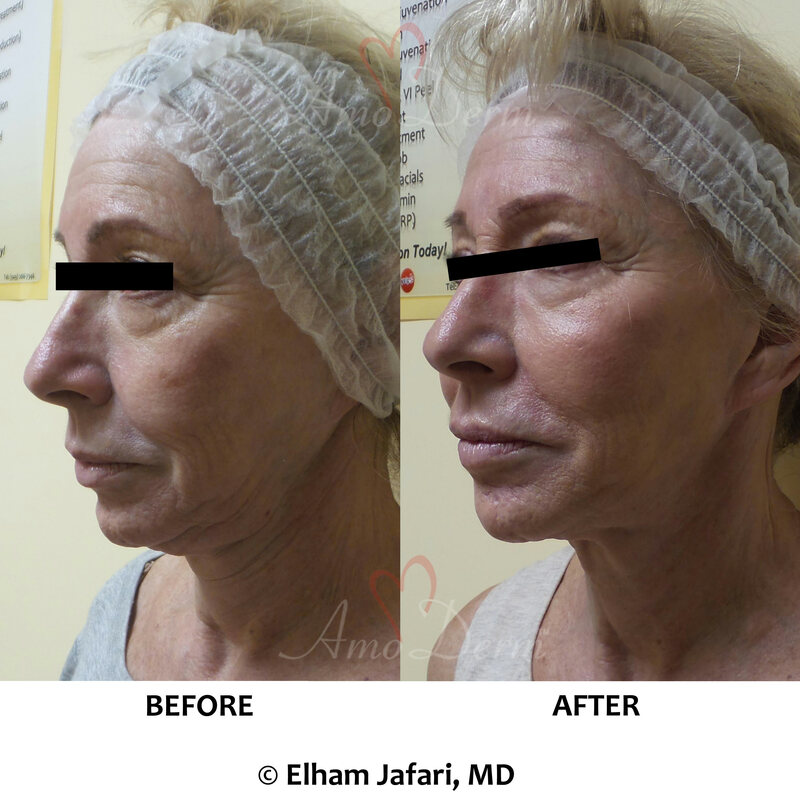 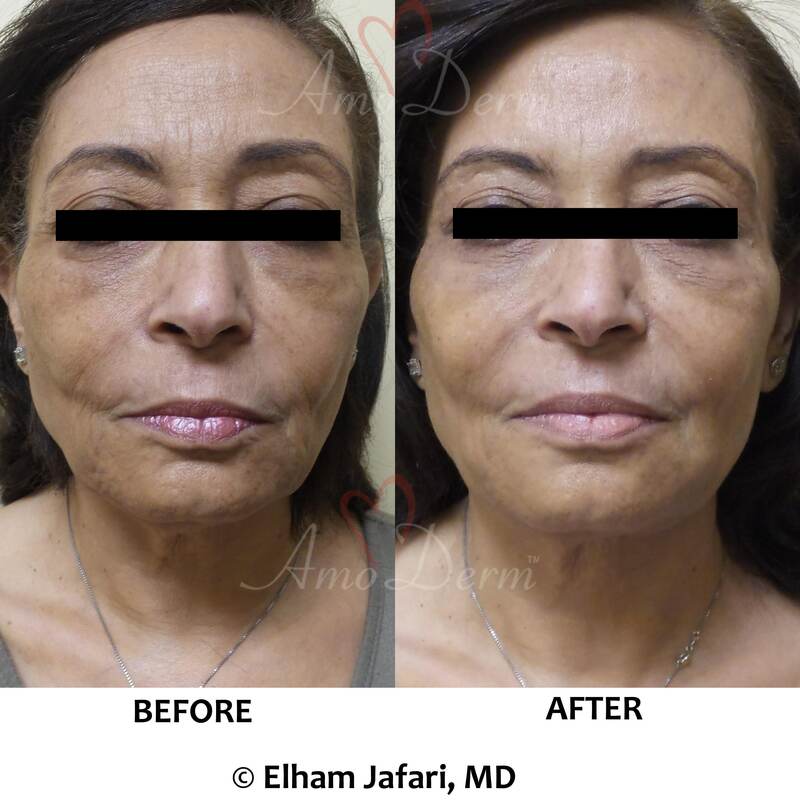 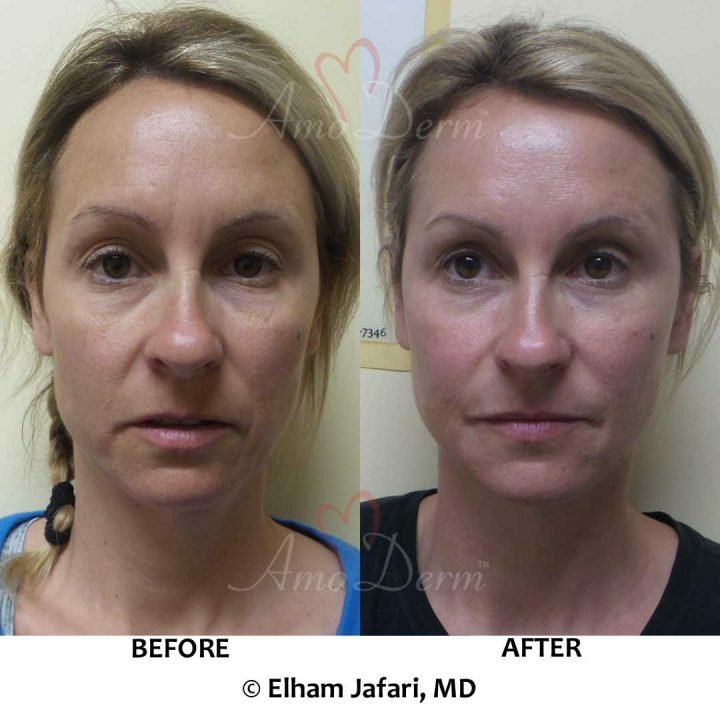 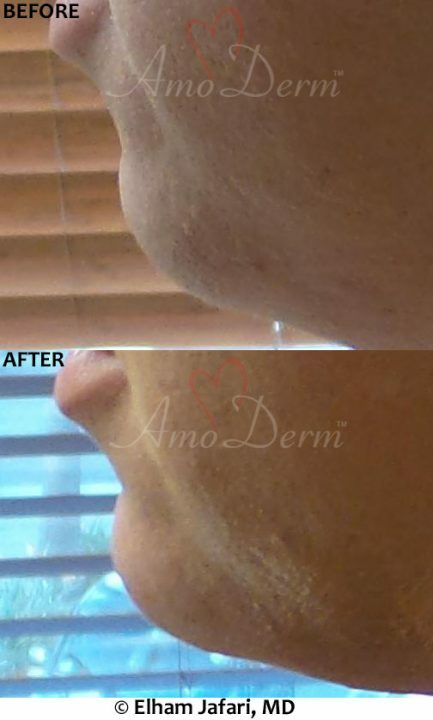 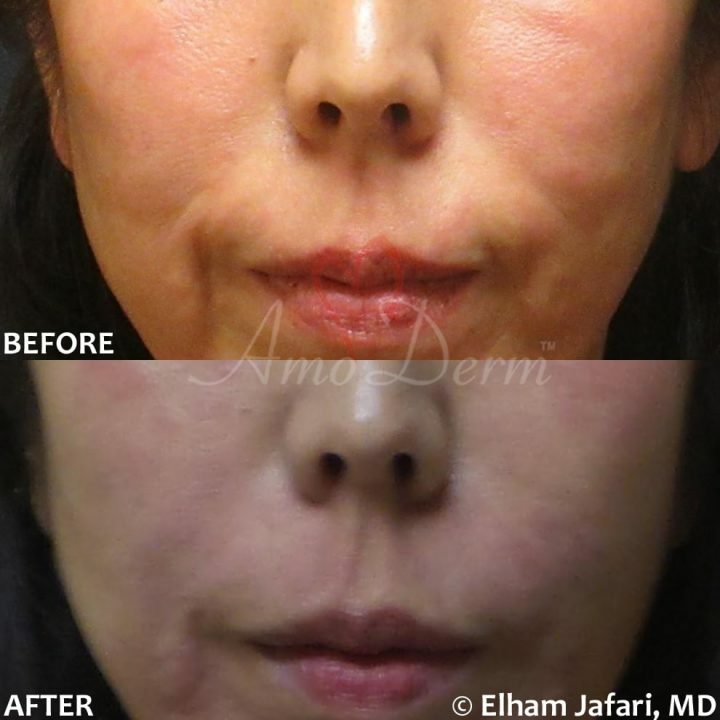 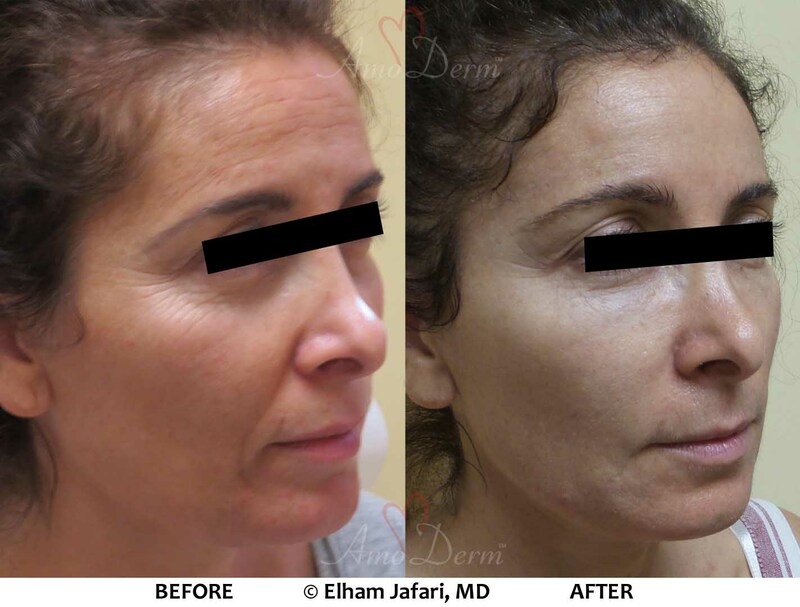 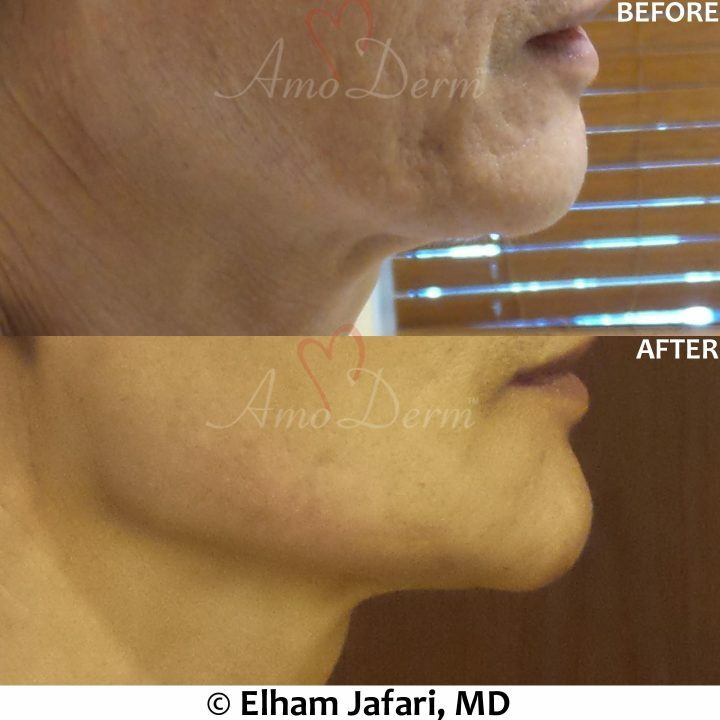 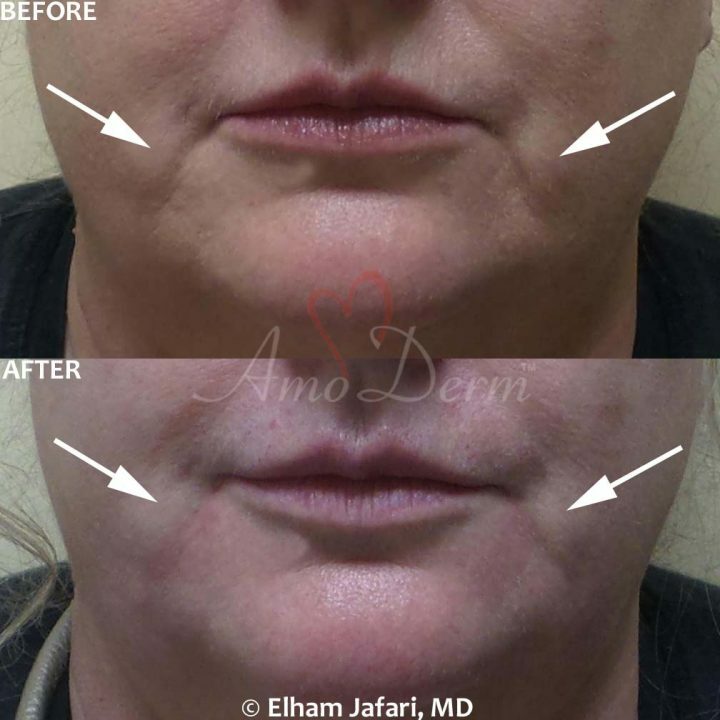 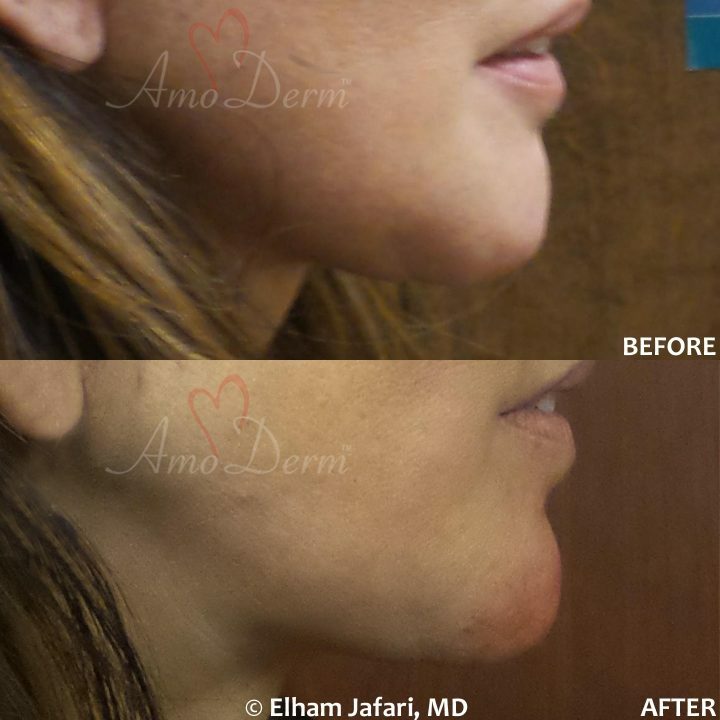 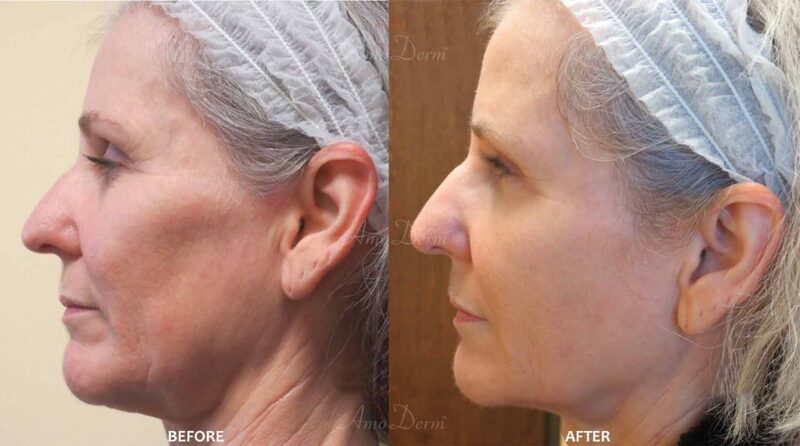 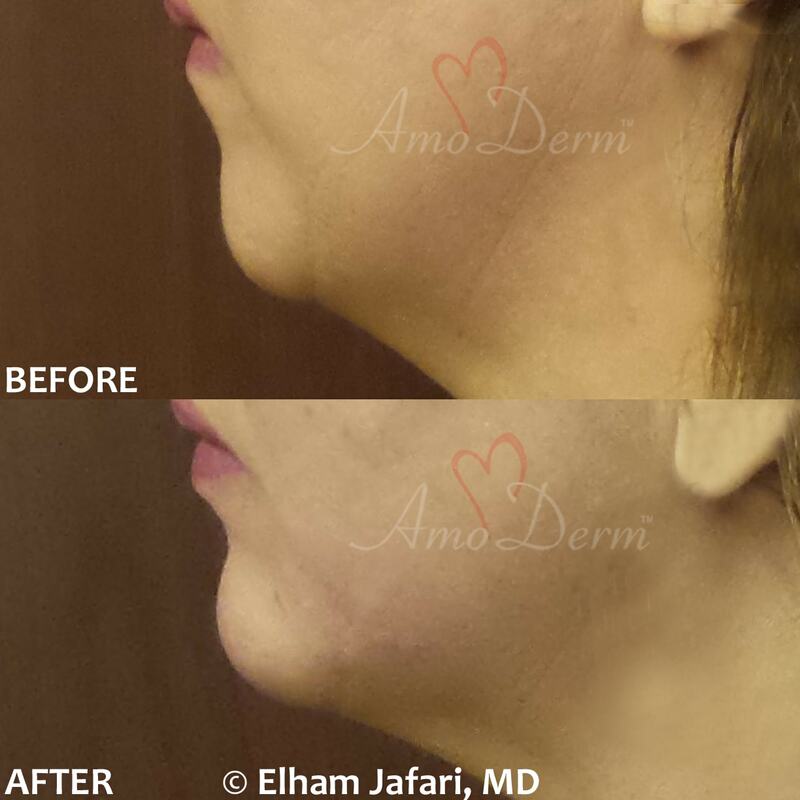 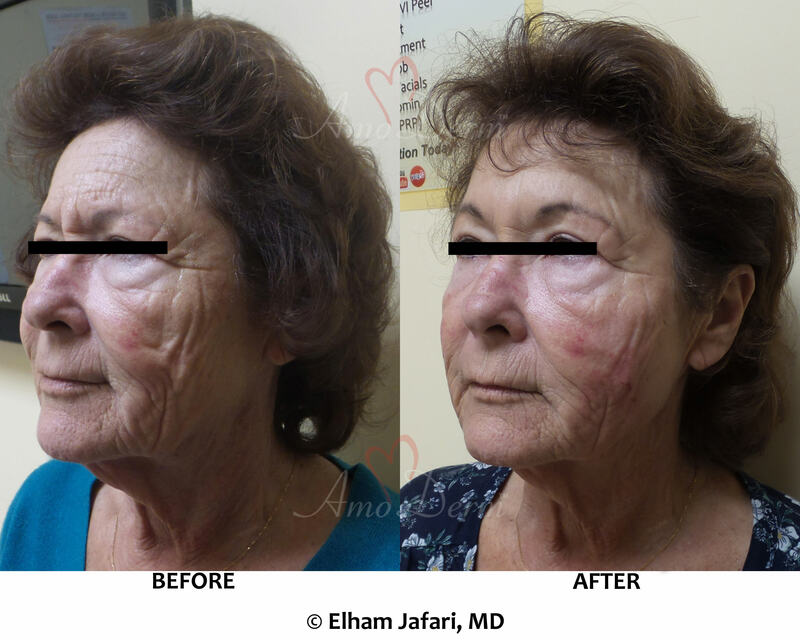 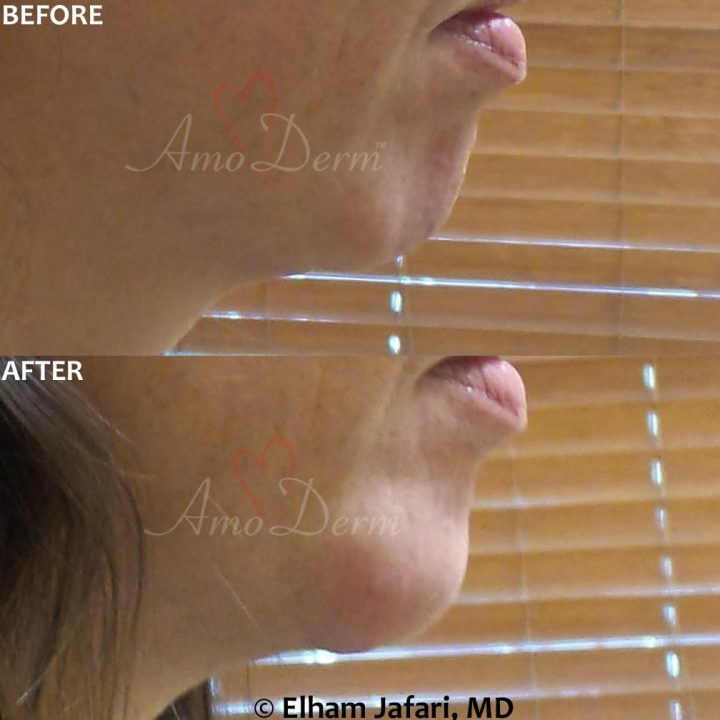 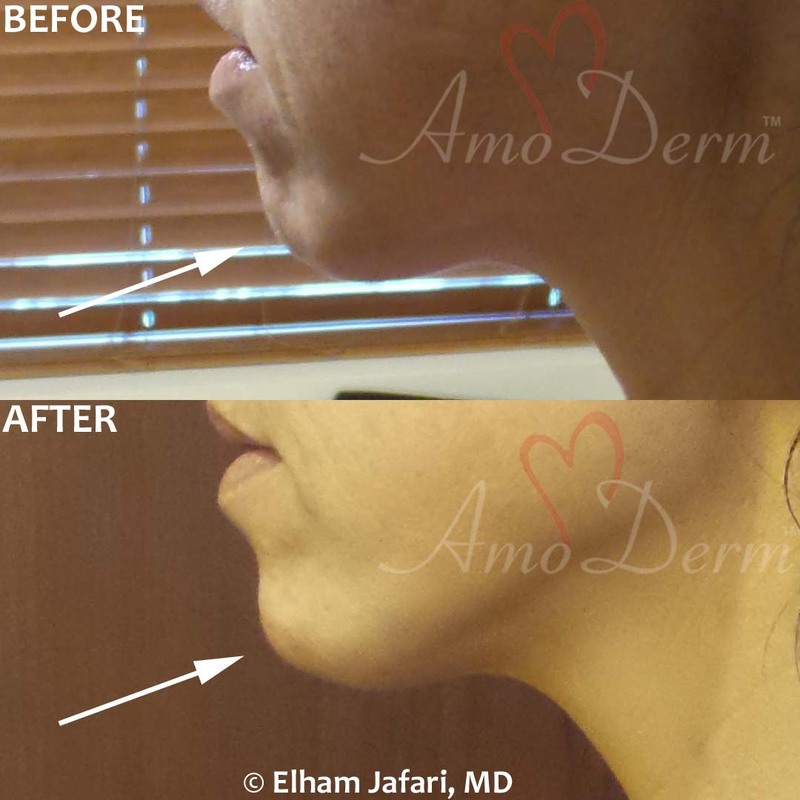 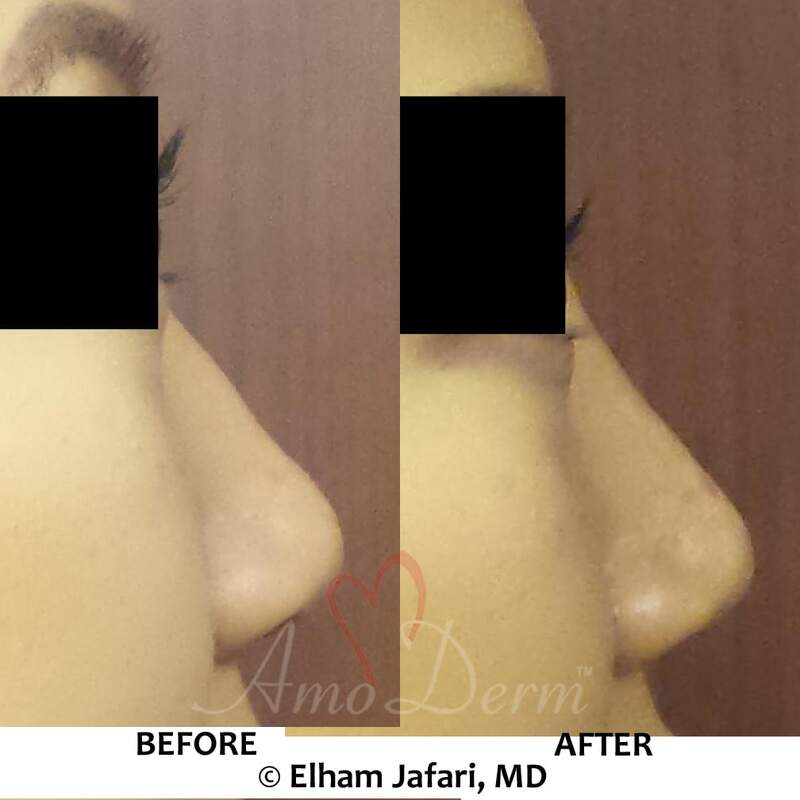 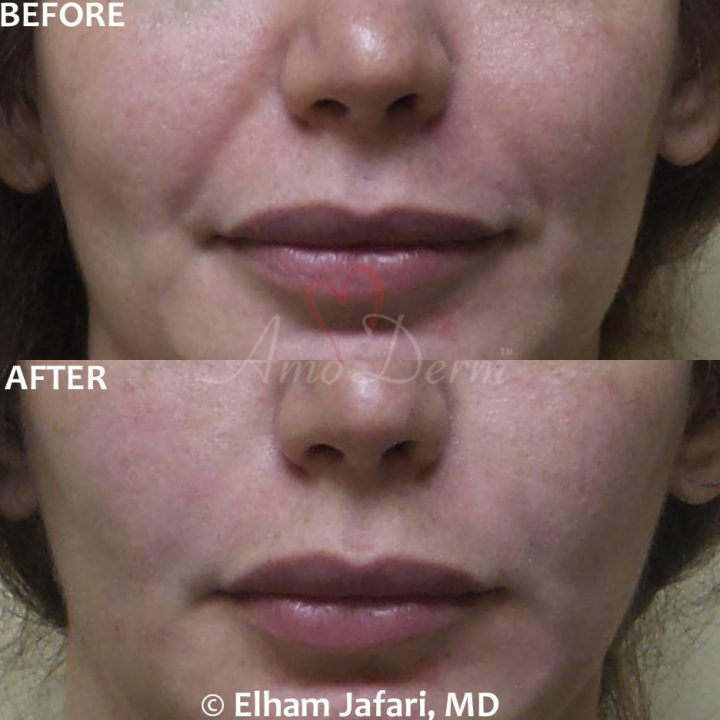 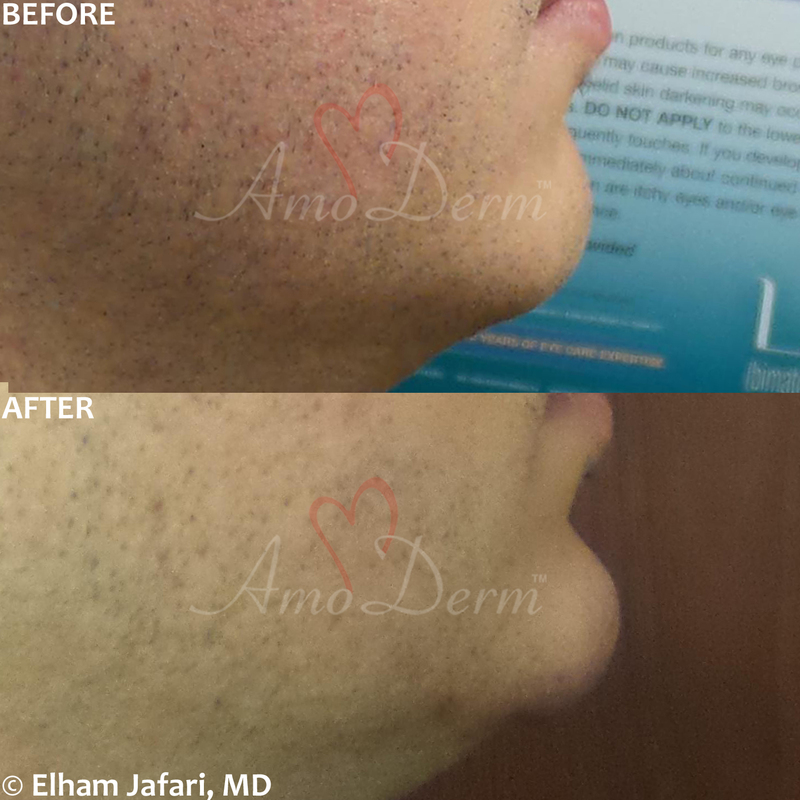 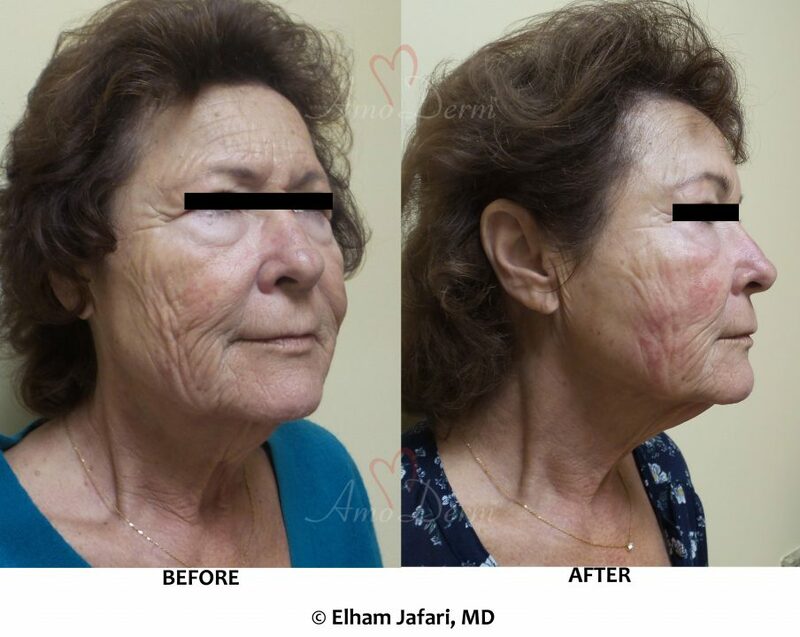 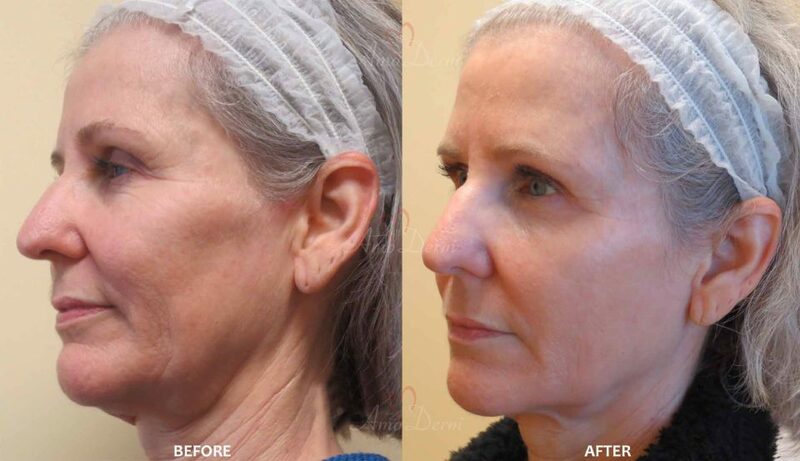 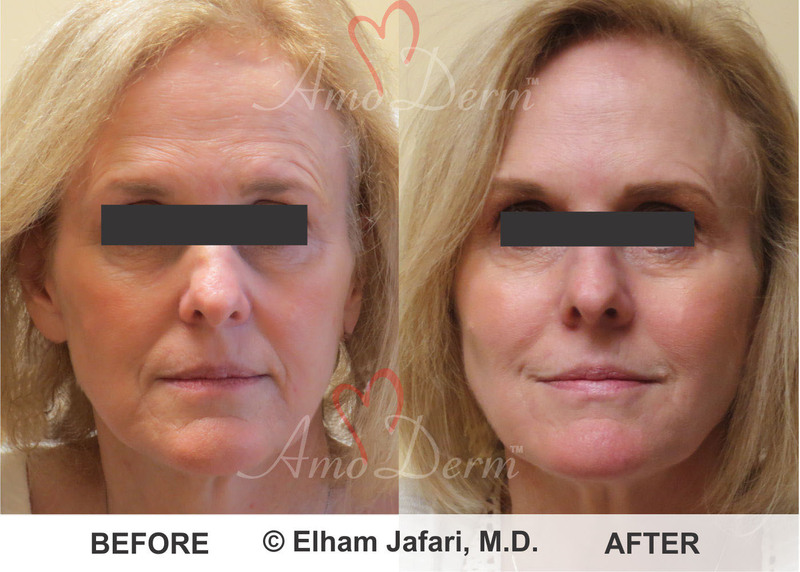 Immediate results are usually seen right after the injection in form of improved and smoothed out lines, folds and wrinkles and restored volume. A subsequent follow-up appointment might be made 4 to 6 weeks later to do a reassessment of the treatment and discuss with your doctor whether additional treatments are recommended. 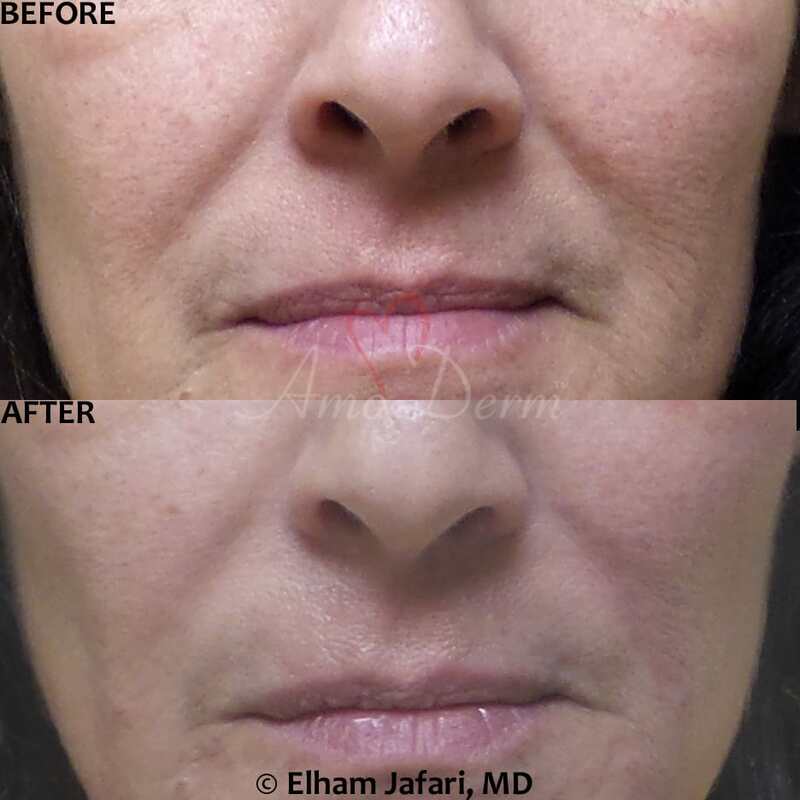 Bellafill has been studied extensively in clinical studies and proven to be as safe as other dermal fillers commonly used to treat skin aging and restore lost volume. Who Is a Candidate for Bellafill? 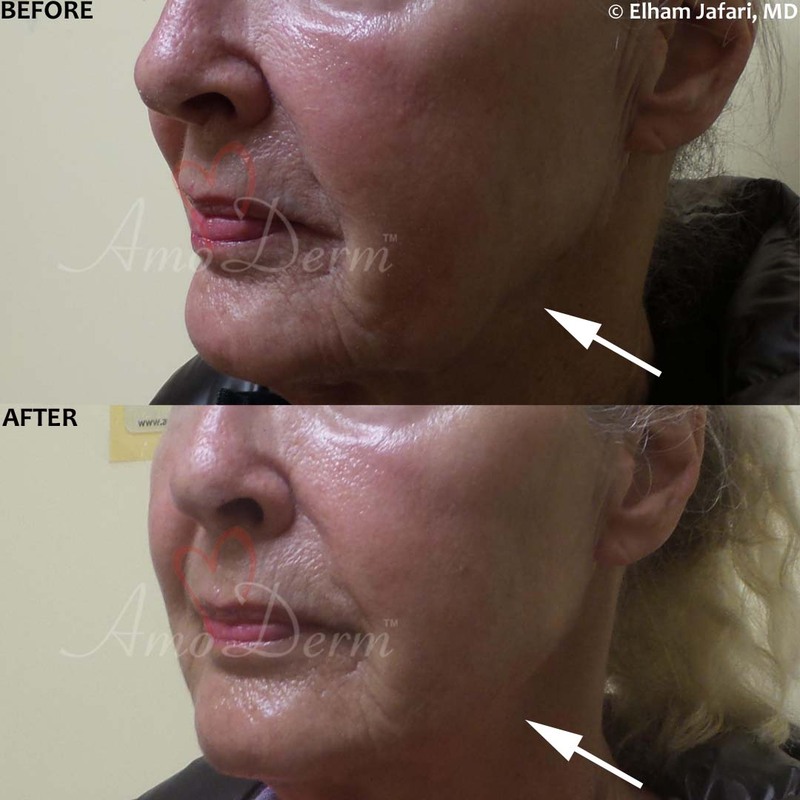 In clinical studies, Bellafill was shown to be highly effective in treating lines, wrinkles, folds and areas of lost volume in the skin in men and women and patients with all skin types. 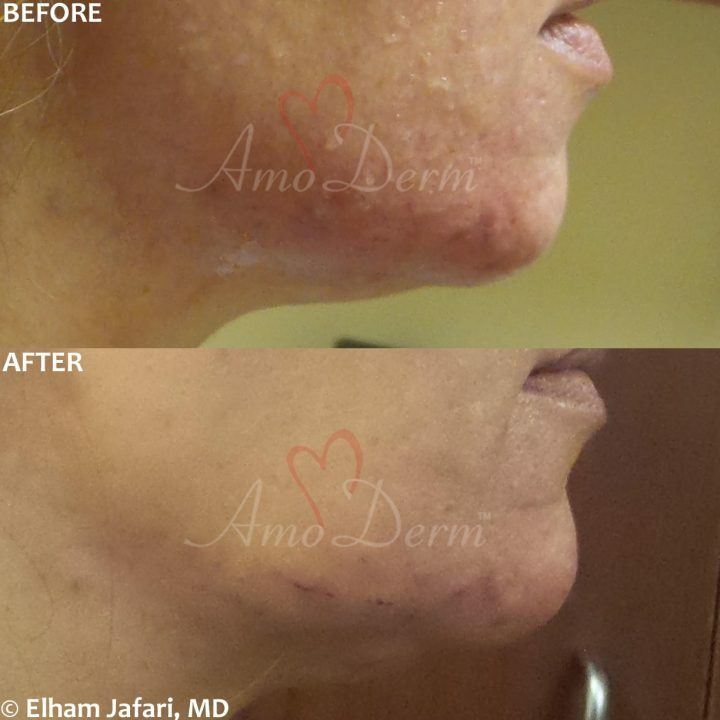 It is also approved by the FDA for the treatment of specific types of skin scars that are pitted or depressed, having a recessed surface, lower than the skin surface surrounding them. 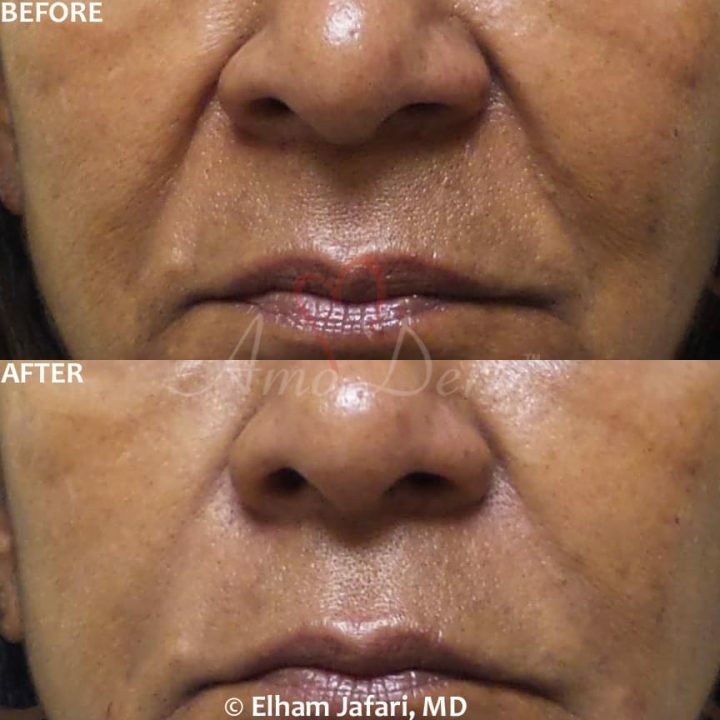 Bellafill is especially preferred for those looking for a long-term solution as the results typically last for long time. 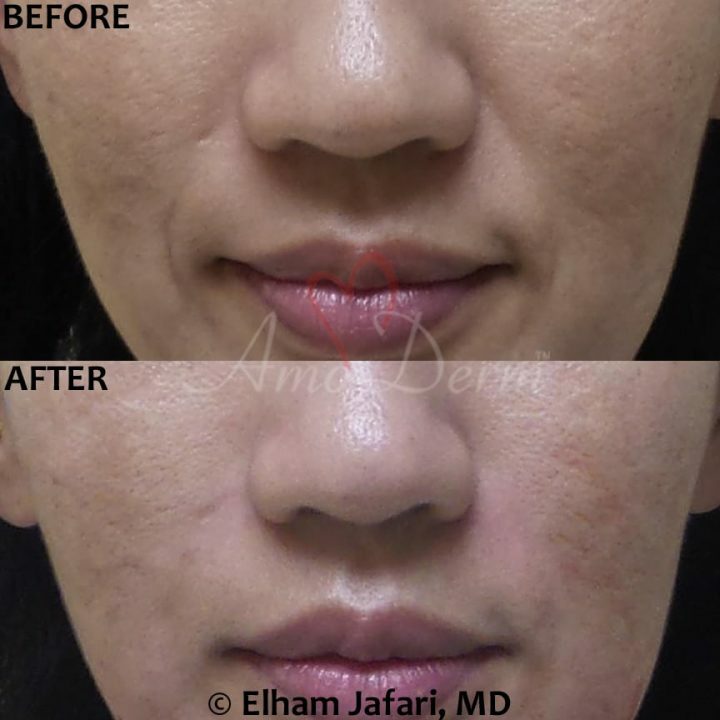 How Is Bellafill Used to Treat Acne Scars? 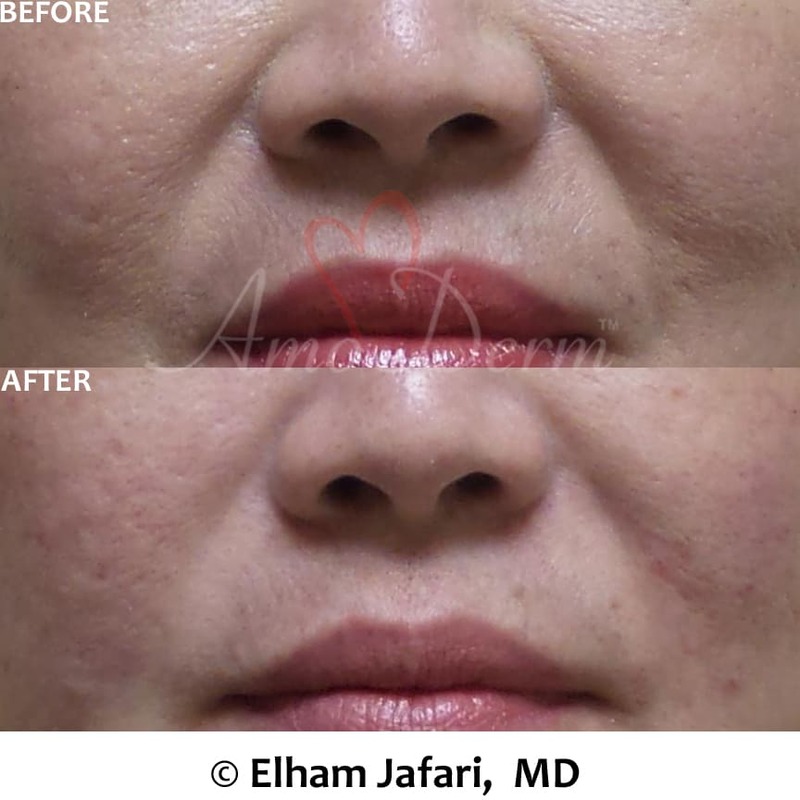 Bellafill is FDA-approved for treatment of scars including acne scars. 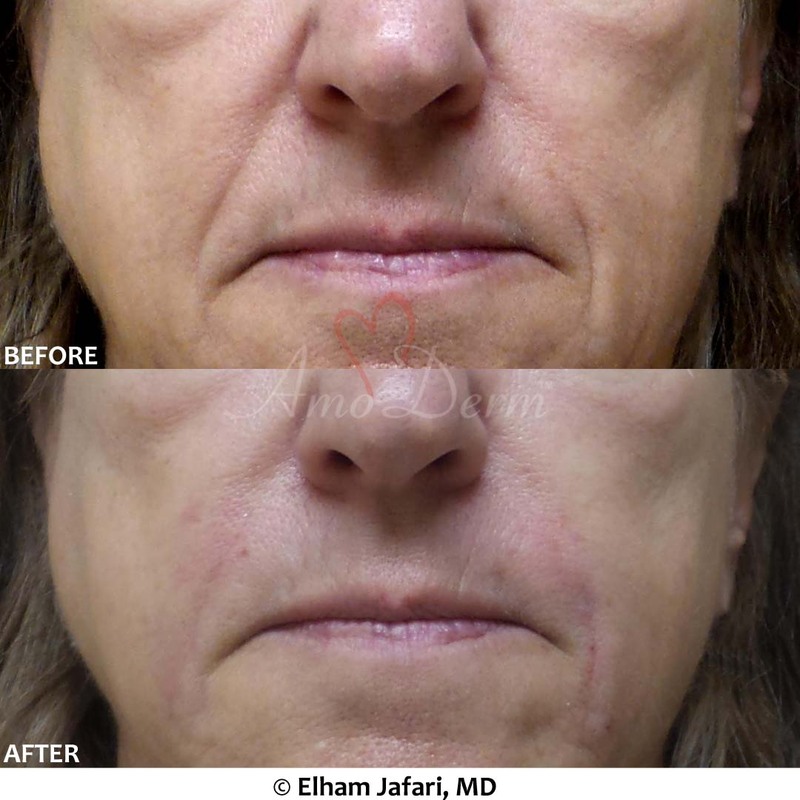 Scars come in different types and shapes, and the type that can be treated by Bellafill is the pitted scar. Pitted scars are recognized by their surface being lower than the surface of the normal skin adjacent to them. 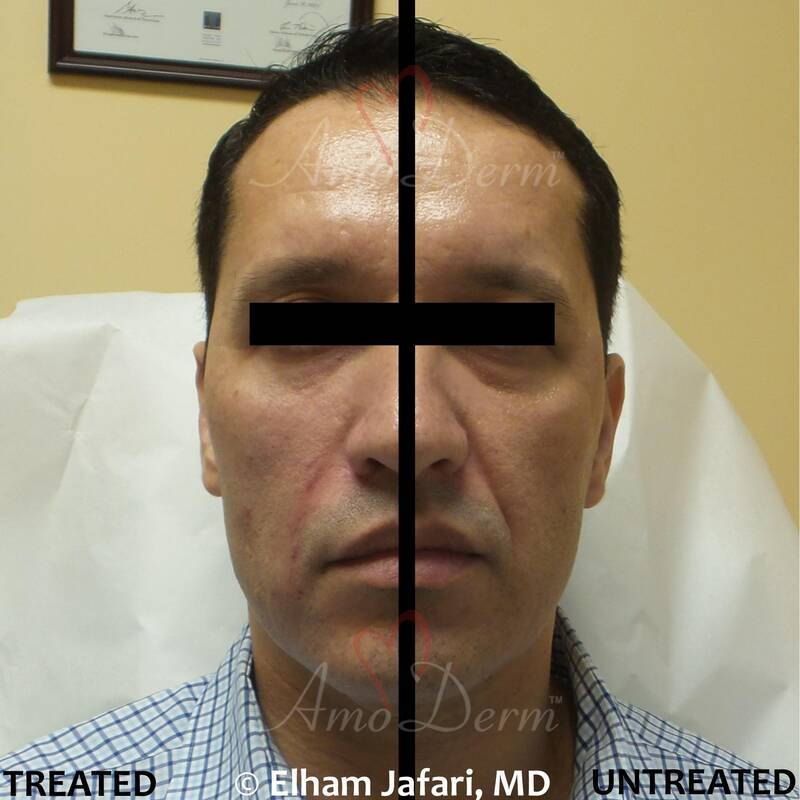 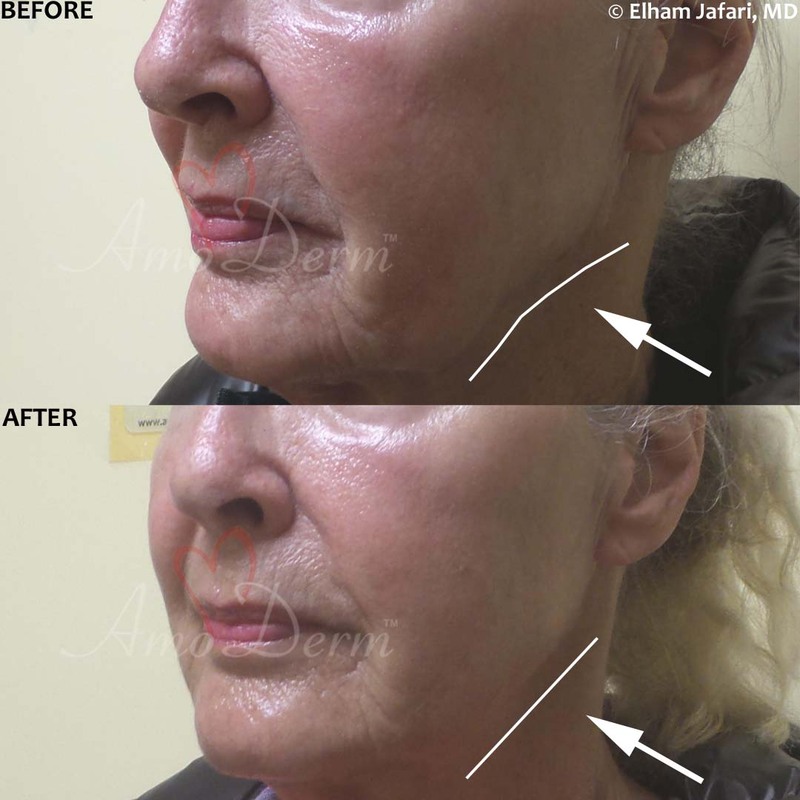 Your doctor can inject Bellafill under the skin in the scarred area and lift the skin, so that its surface is more in line with the normal skin surrounding the scar. It should be noted that other treatments such as laser skin resurfacing and Fractional CO2 laser can also be used in combination with Bellafill (or at times, on their own) to improve the scars and make them less noticeable. 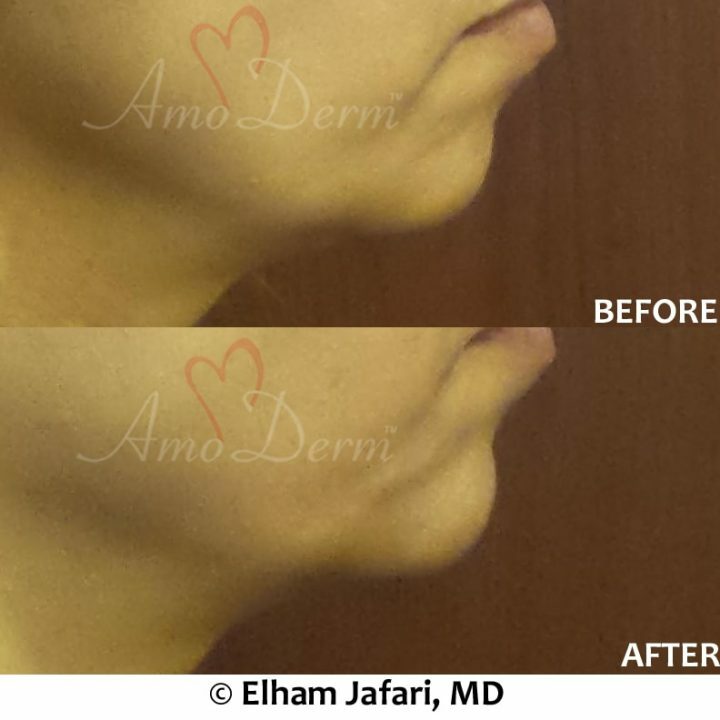 How Soon Are the Results Typically Seen? Thanks to its unique formulation, Bellafill provides collagen that immediately lifts the skin and volumizes it, allowing the patients to enjoy the results right away. 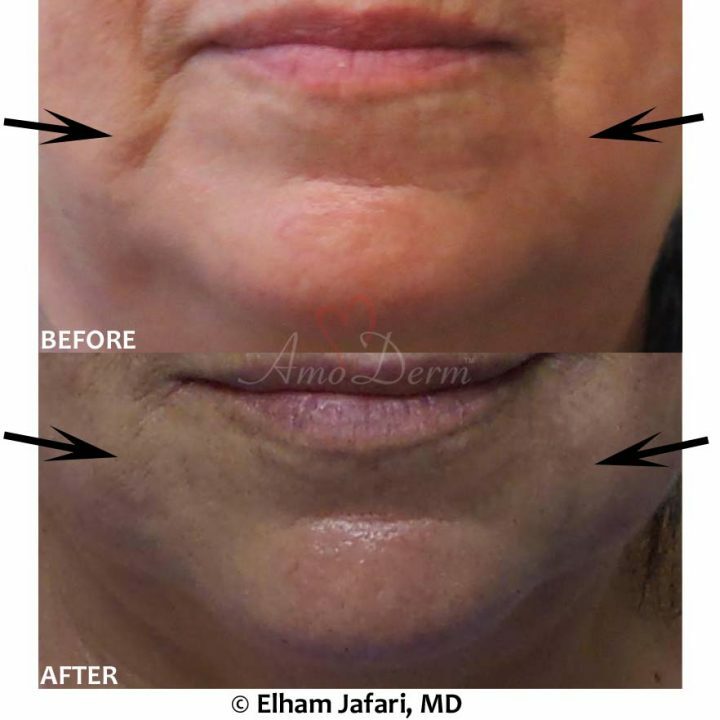 Additionally, the PMMA microspheres will continue to recruit and stimulate fibroblasts and other cells in the body to make new collagen in the months following the treatment, ensuring long-lasting and sustained treatment results in form of youthful, firmer and rejuvenated skin with fewer lines, wrinkles and folds. 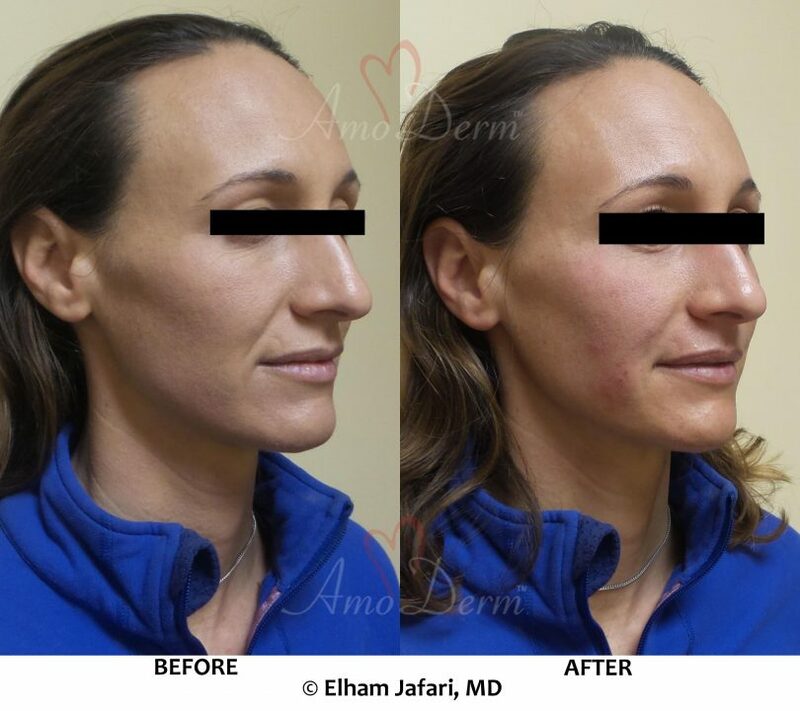 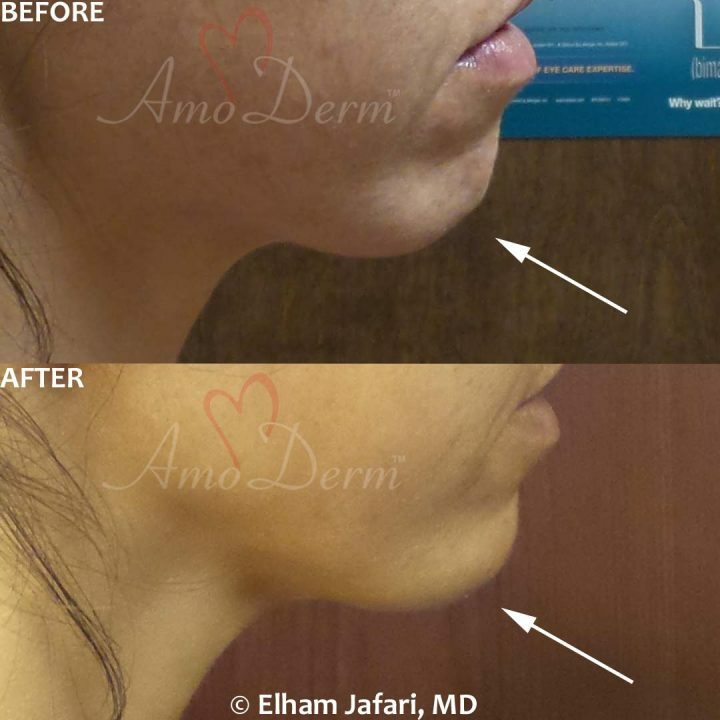 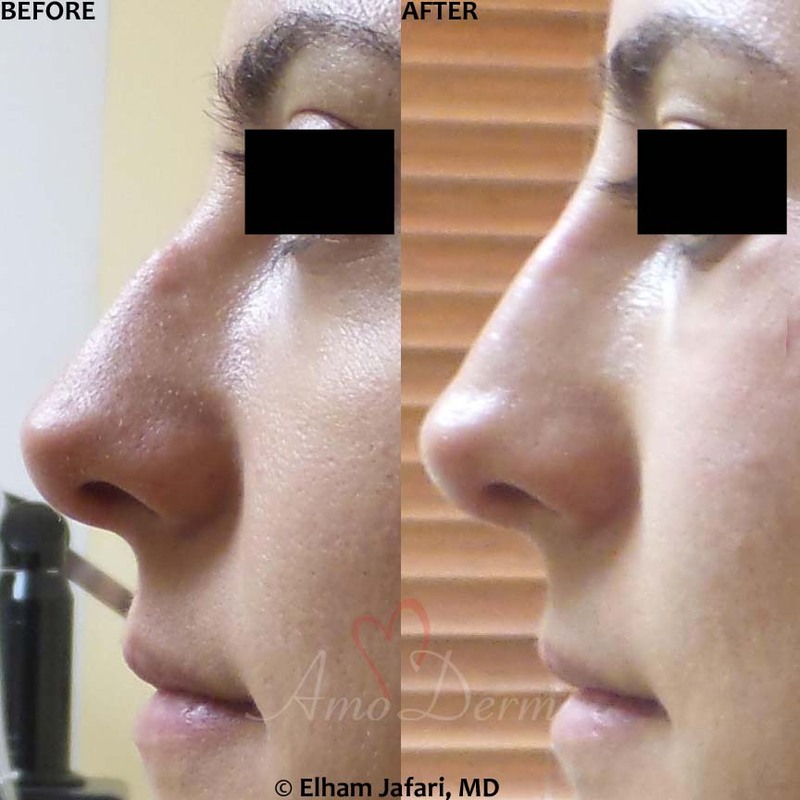 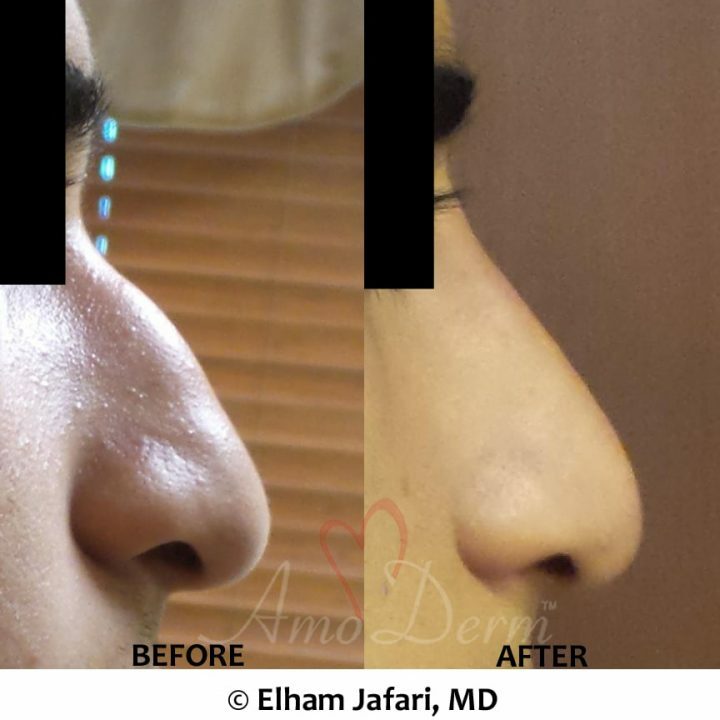 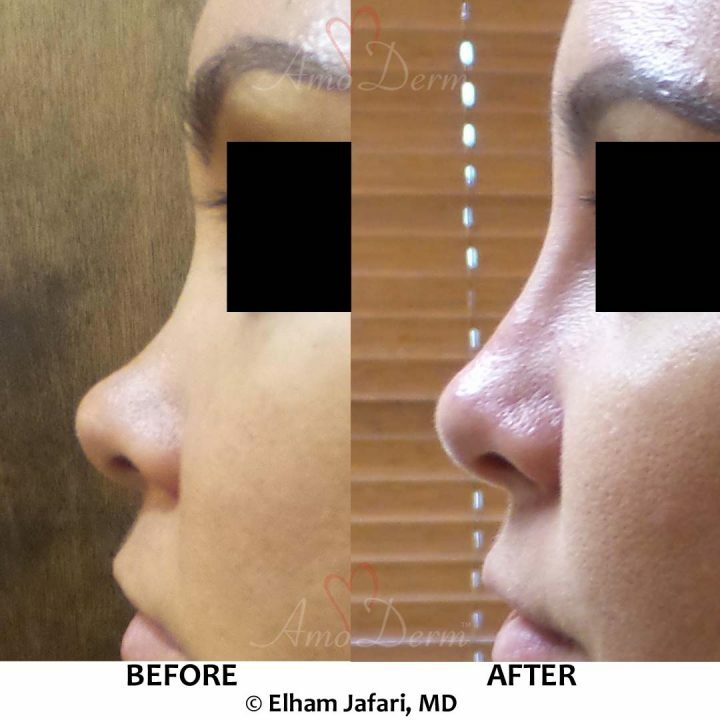 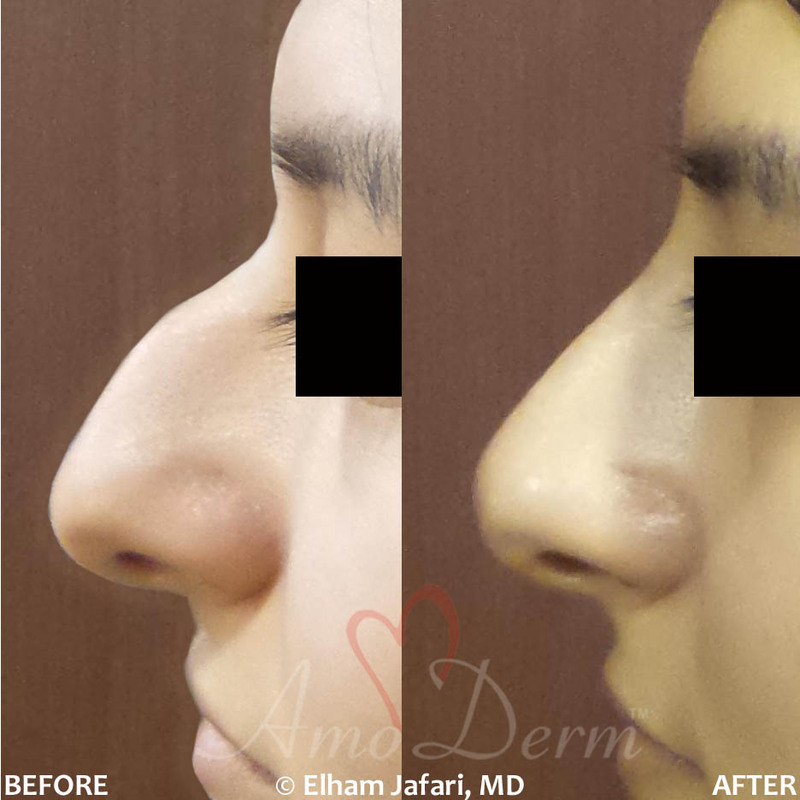 The results of Bellafill typically last for 1-2 years and even more. Is There Pain or Down-time? 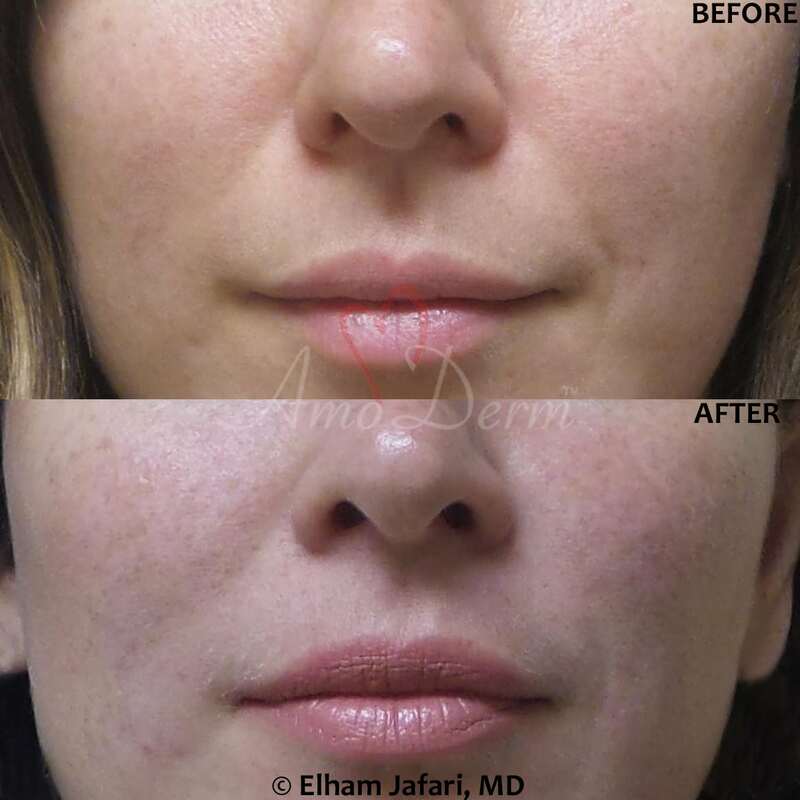 The downtime following Bellafill injection is typically none to minimal, just like any other injectable fillers. 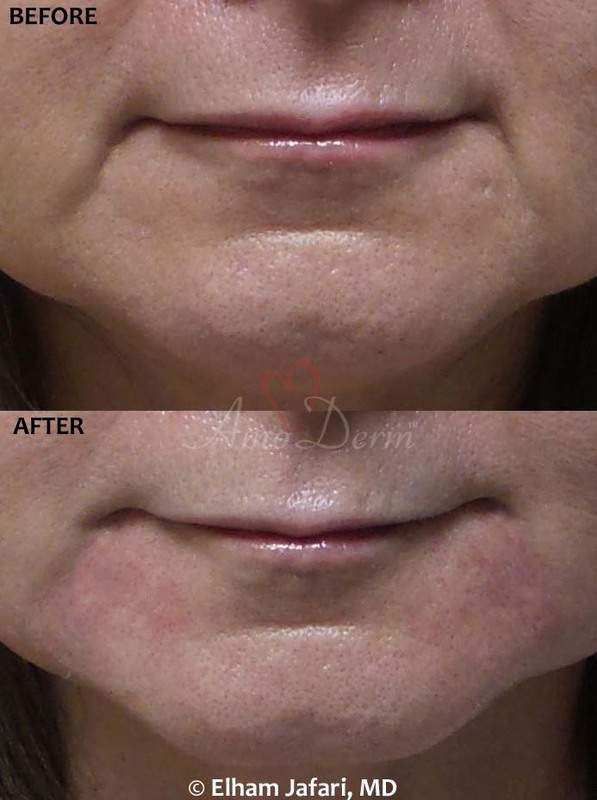 You might experience some levels of swelling, redness and/or bruising following the treatment that is usually self-limiting and goes away gradually following the treatment. 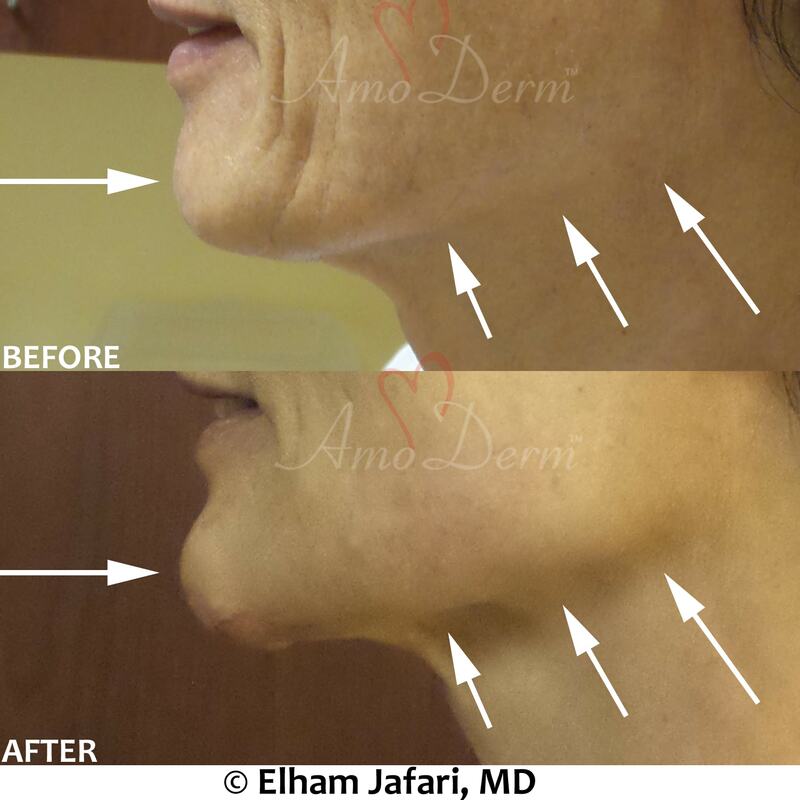 The pain and discomfort are usually minimal. 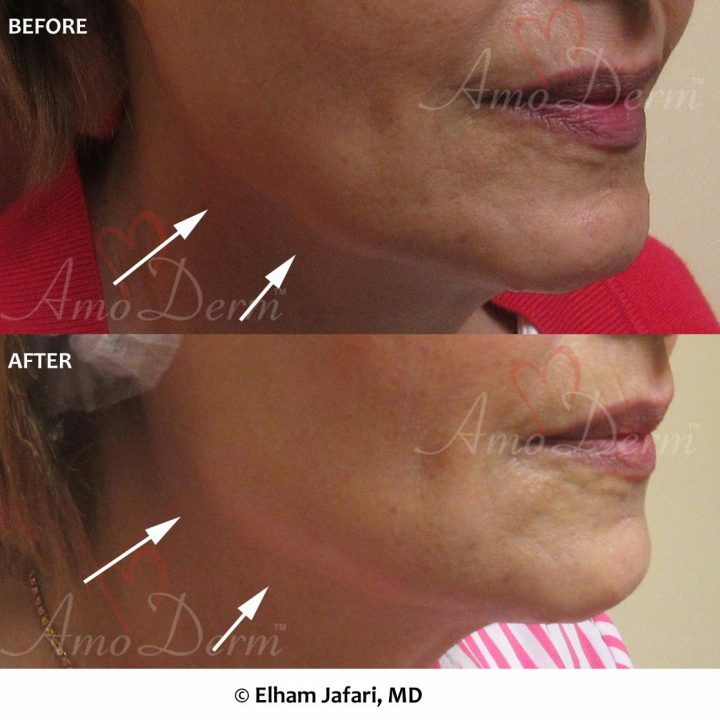 Lidocaine is a topical anesthetic that numbs the skin and greatly reduces any pain or discomfort. 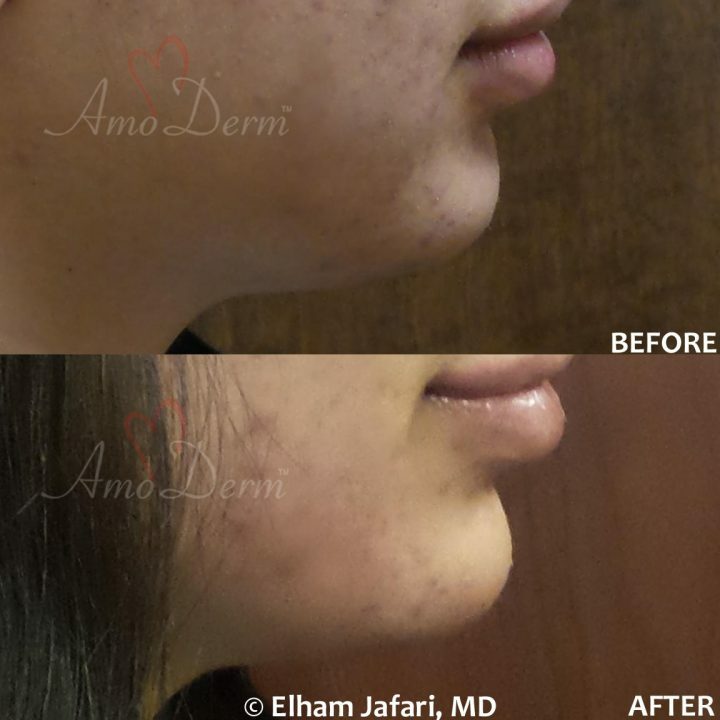 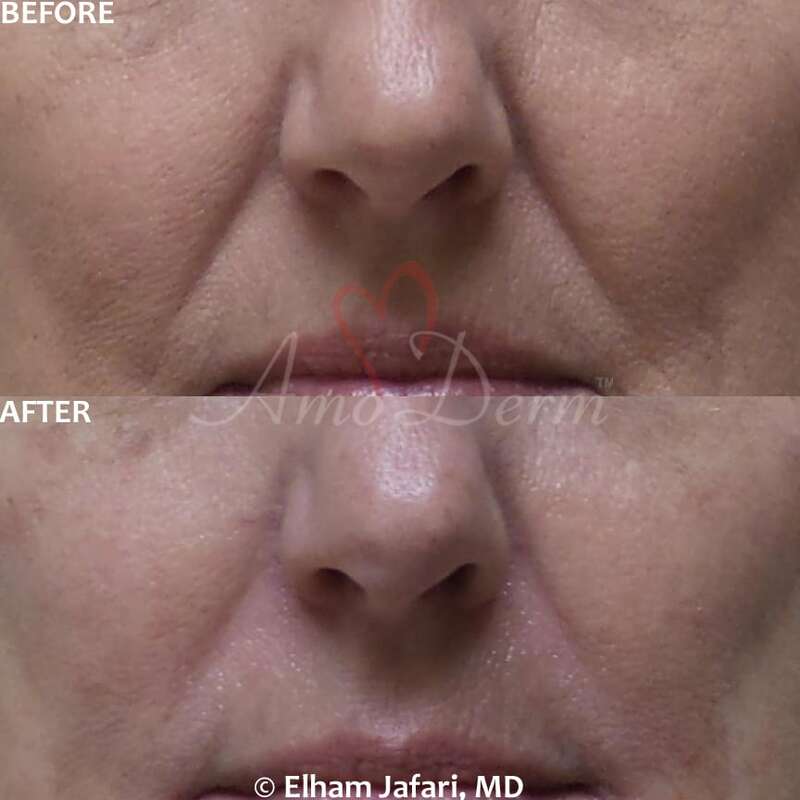 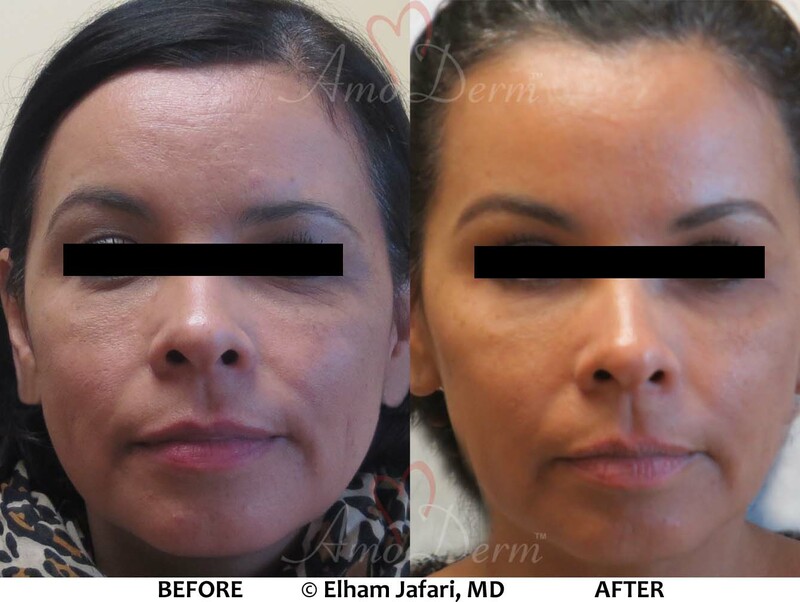 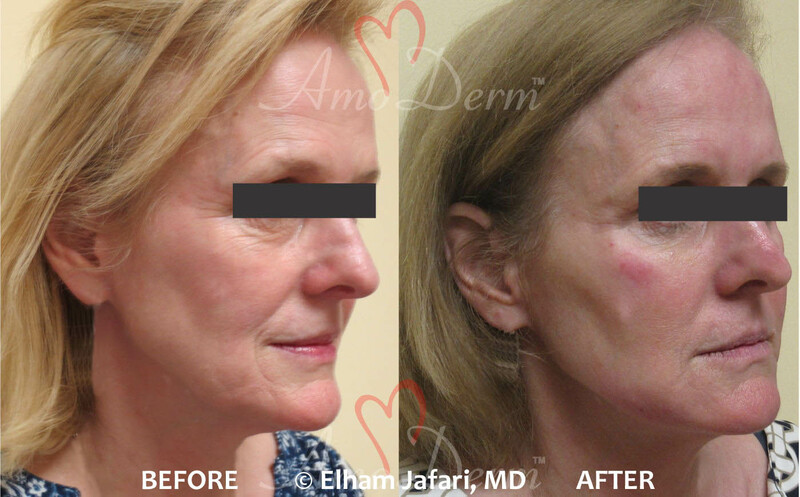 Contact Amoderm in Irvine today to schedule your complimentary consultation and discover the secrets to the beauty that lasts with Bellafill and other dermal fillers!